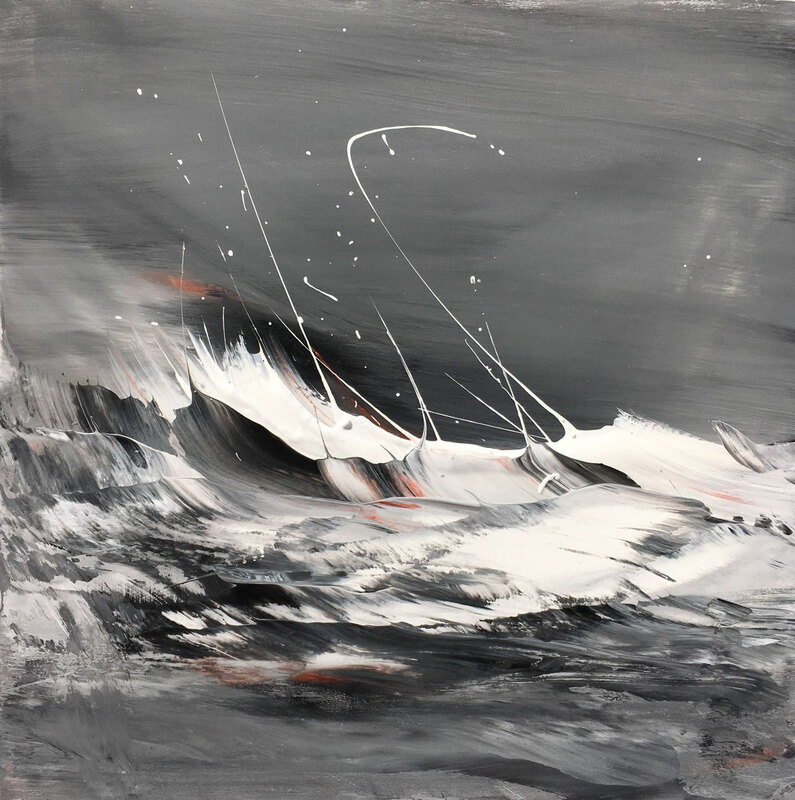 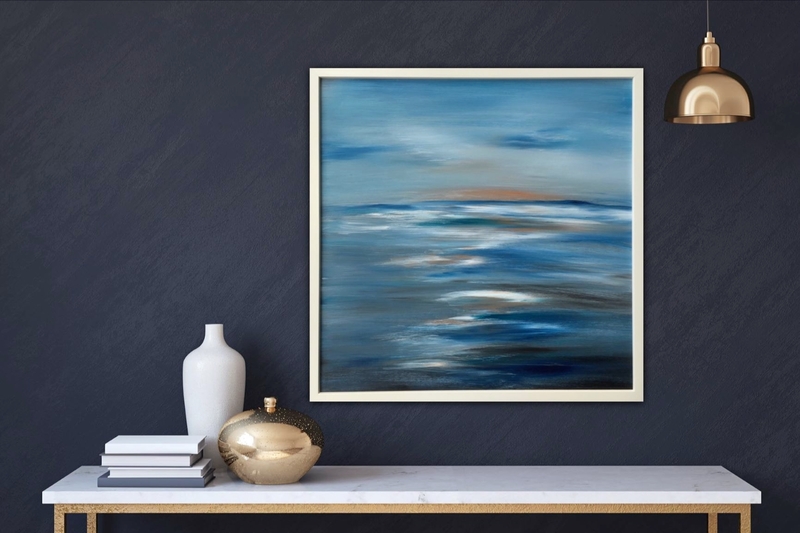 Great waves give this painting a special and powerful expression. The reduced colours palette of turquoise, black and white make this artwork a long lasting pleasure. 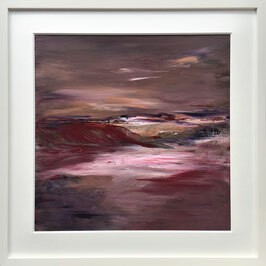 Comes framed - ready to hang. 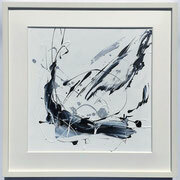 This piece comes ready framed in black frame (wood) and custom made white mat. 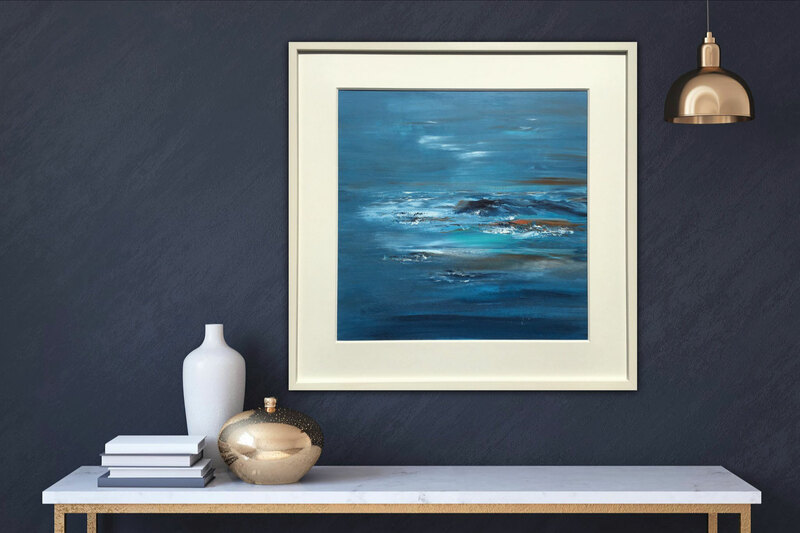 A calm seascape with golden hints and great depth. 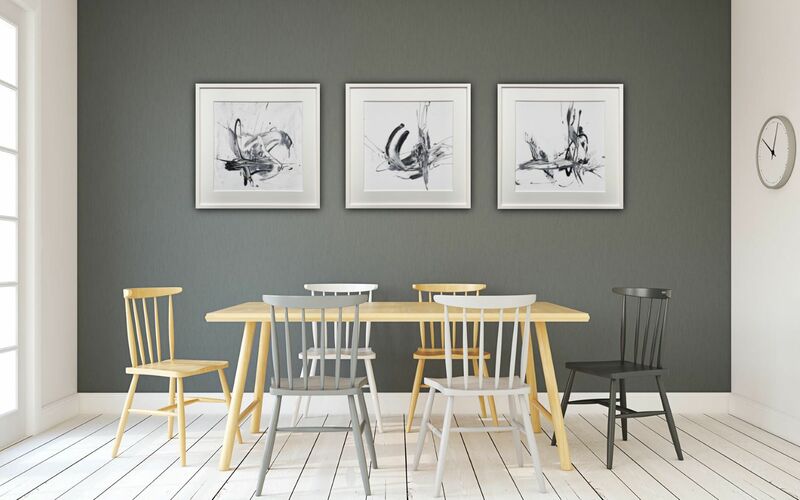 The reduced colours palette of white, black and gold guarantees a long lasting pleasure. 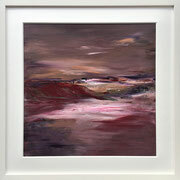 This original comes framed in white frame (wood) including custom made white mat - ready to hang. 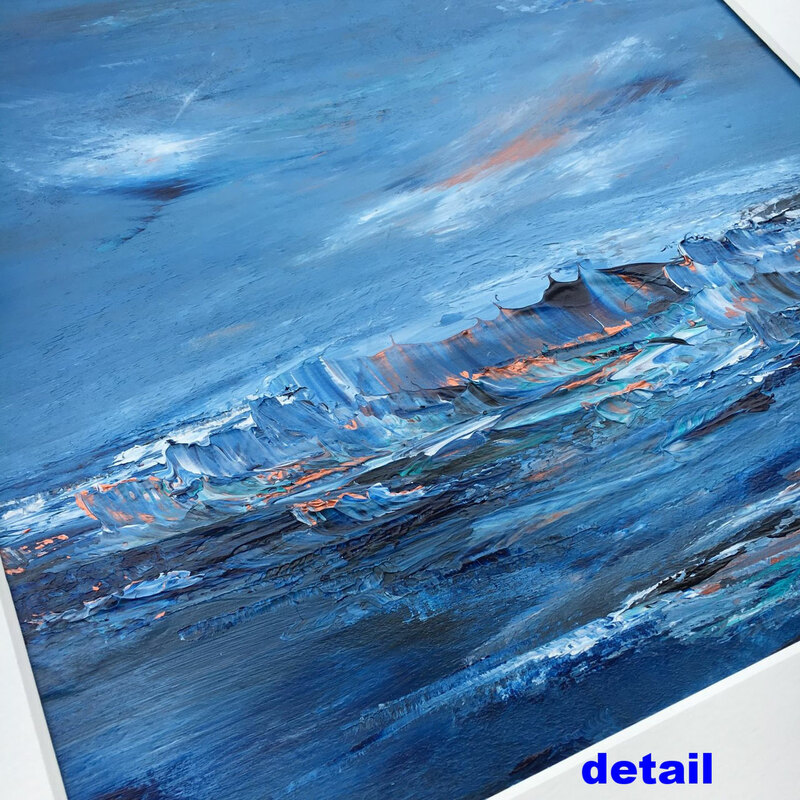 Acrylic paint on thin HDF-board 0,3 cm (0,12 inch) - comes ready framed. 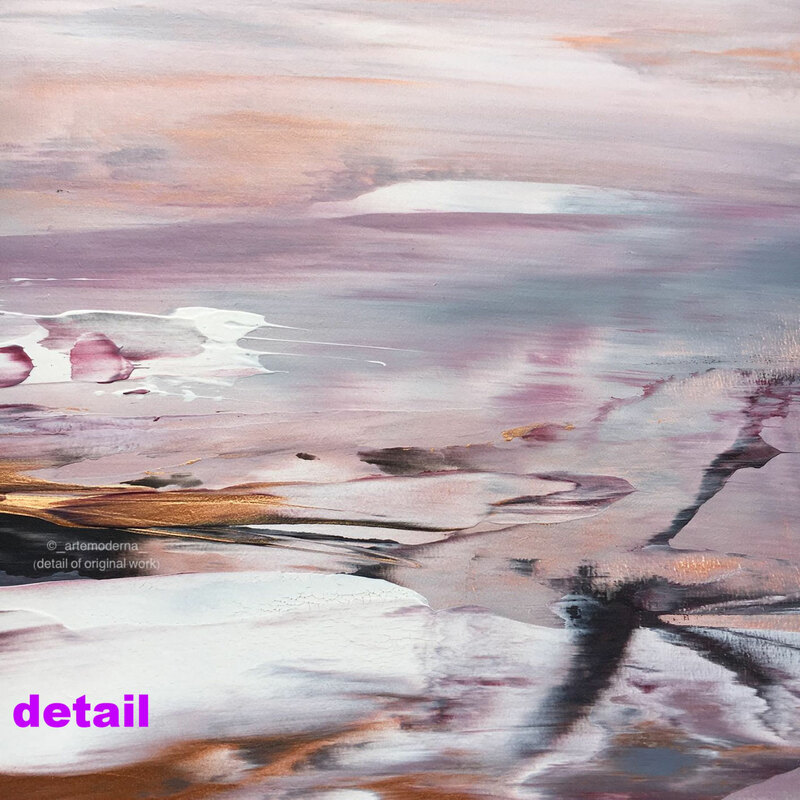 I'm always inspired by nature. 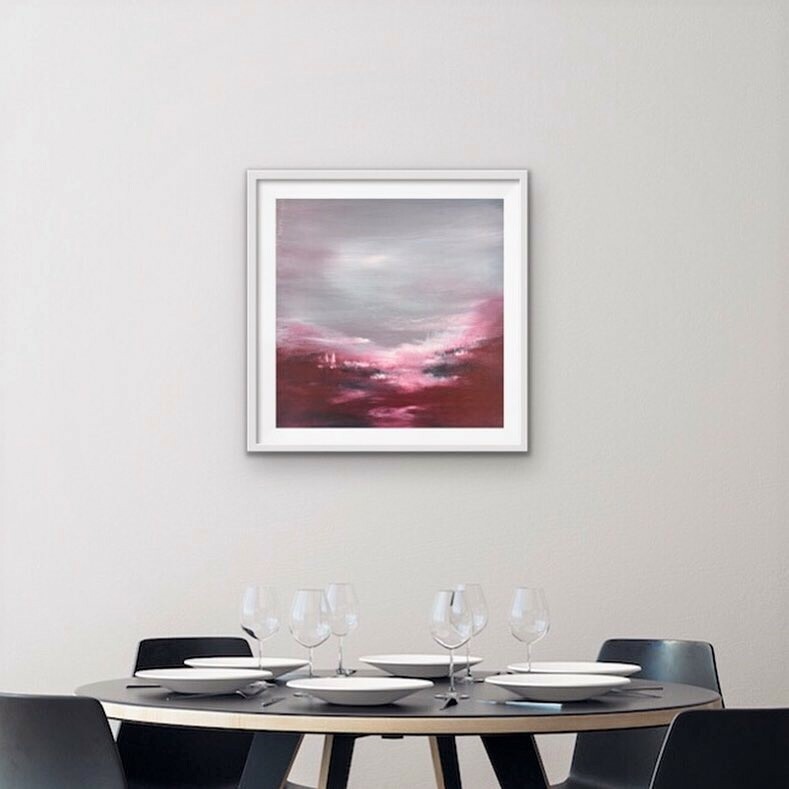 So I created an abstract "dreamscape" series, that transports this recreating and recharging feelings I contribute to nature adding a dreamy fantasy note to it. 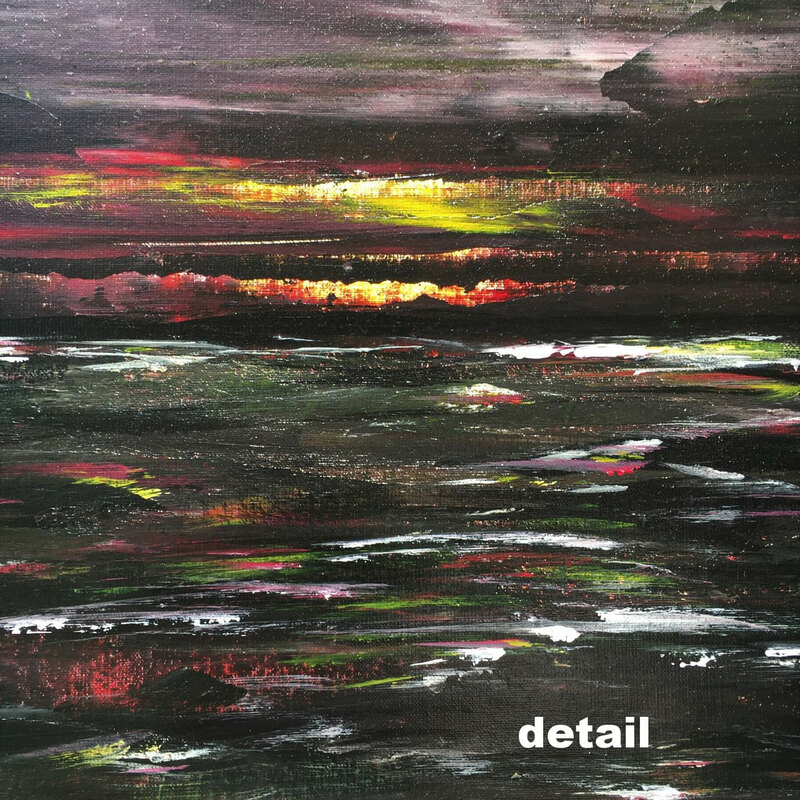 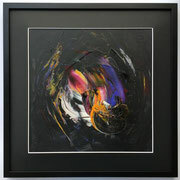 Every piece conveys it's very unique feeling due to the colour choice and composition. 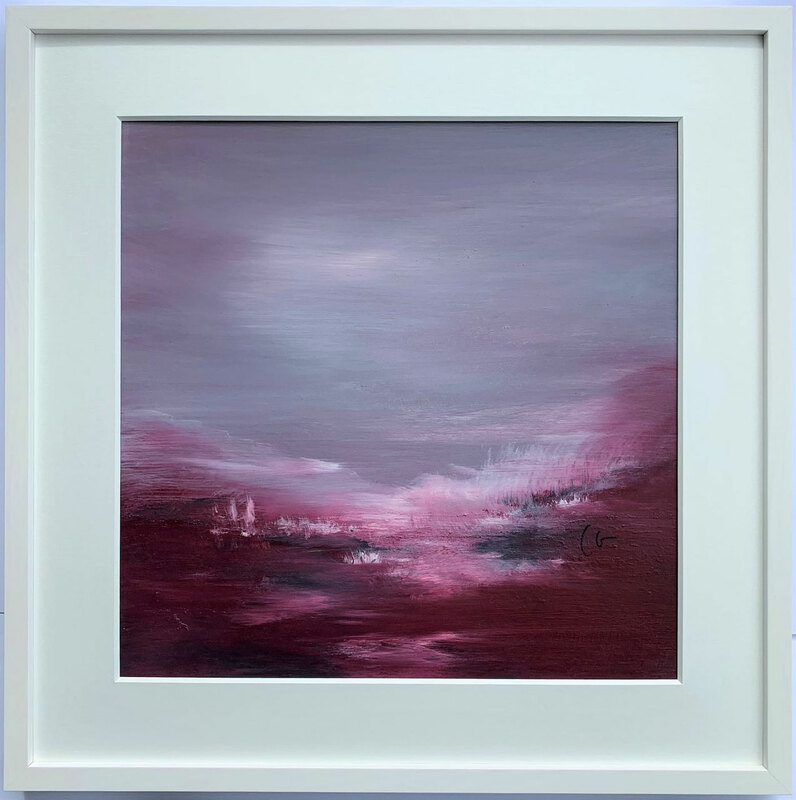 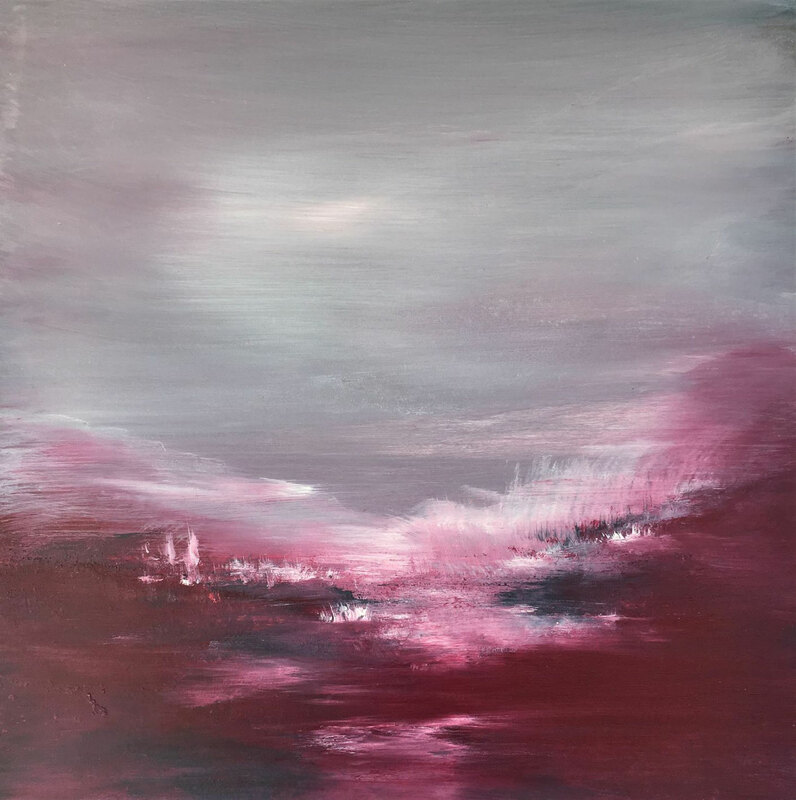 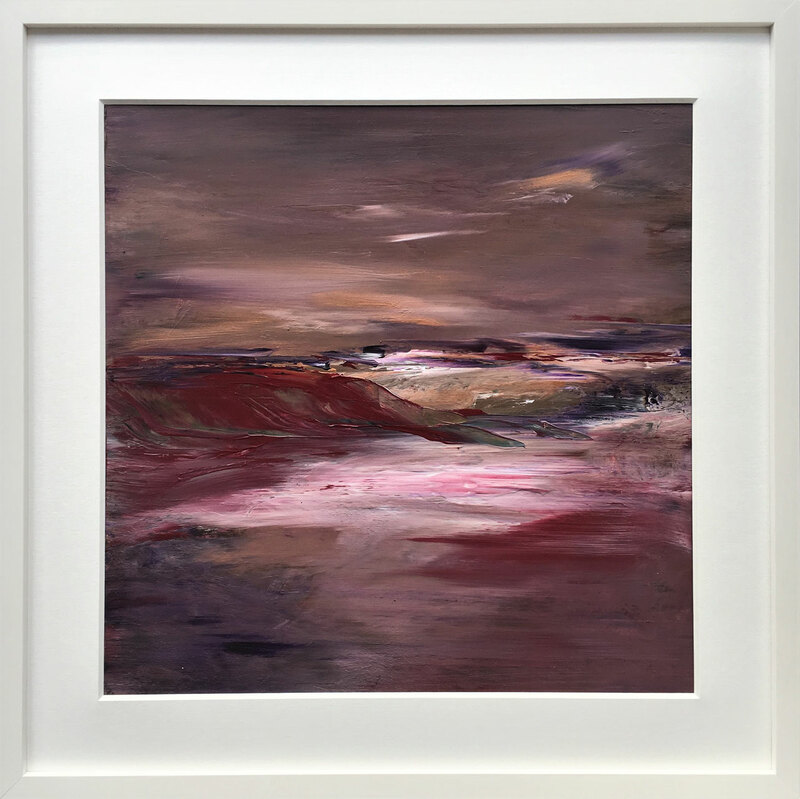 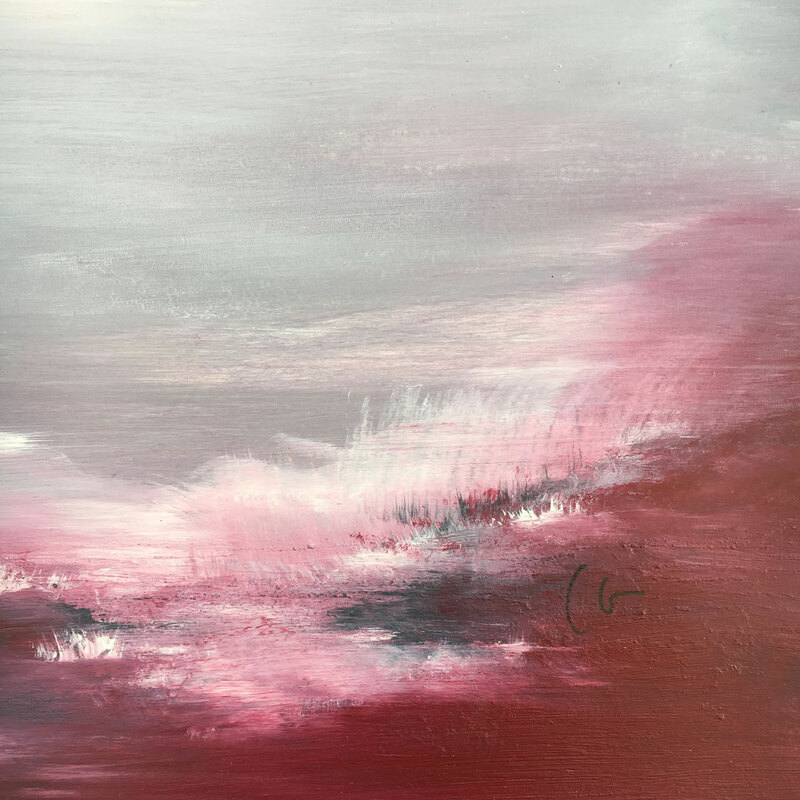 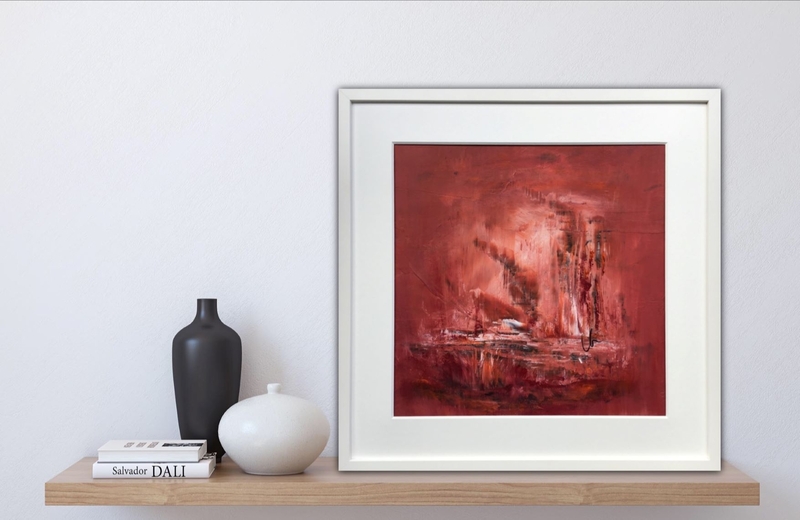 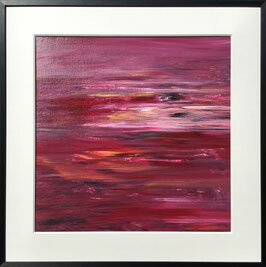 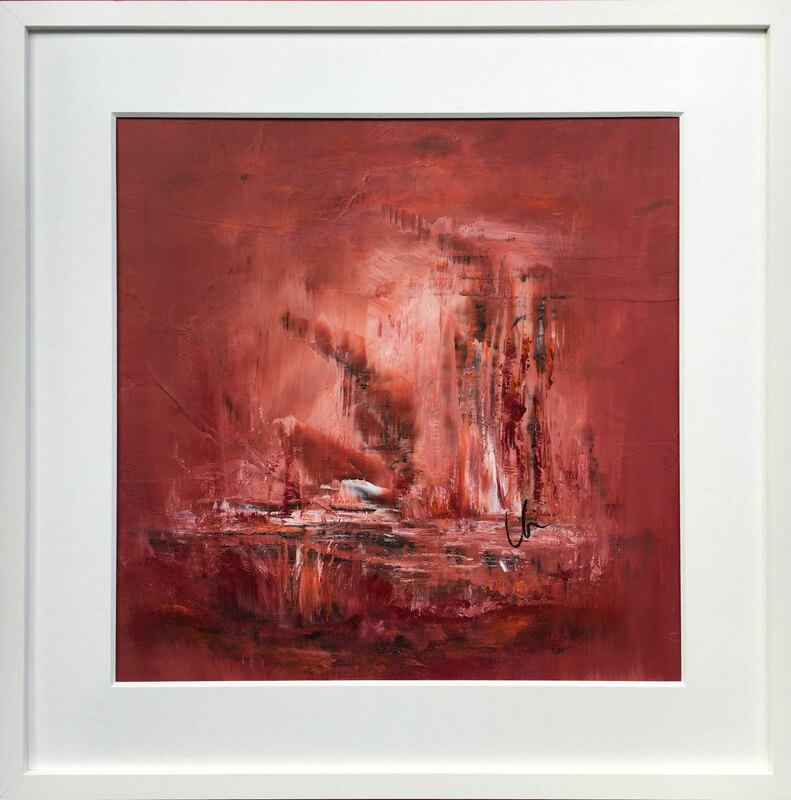 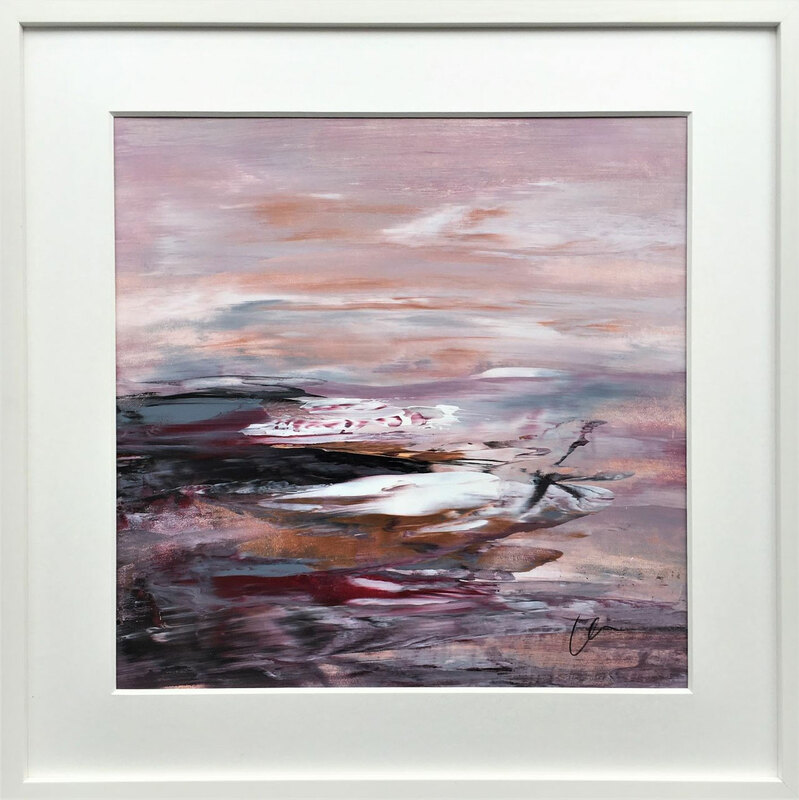 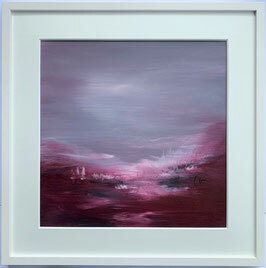 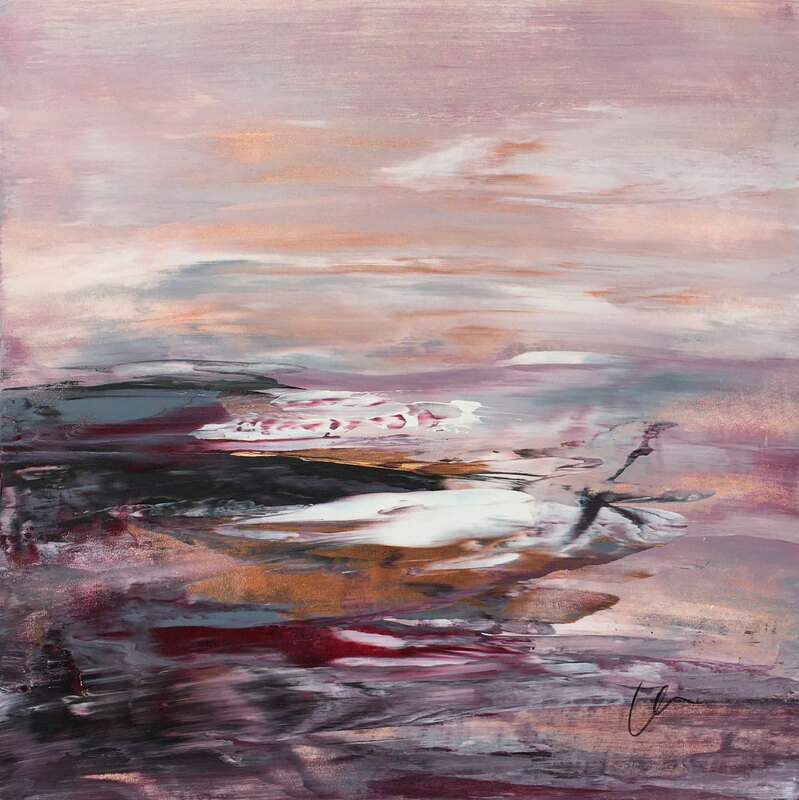 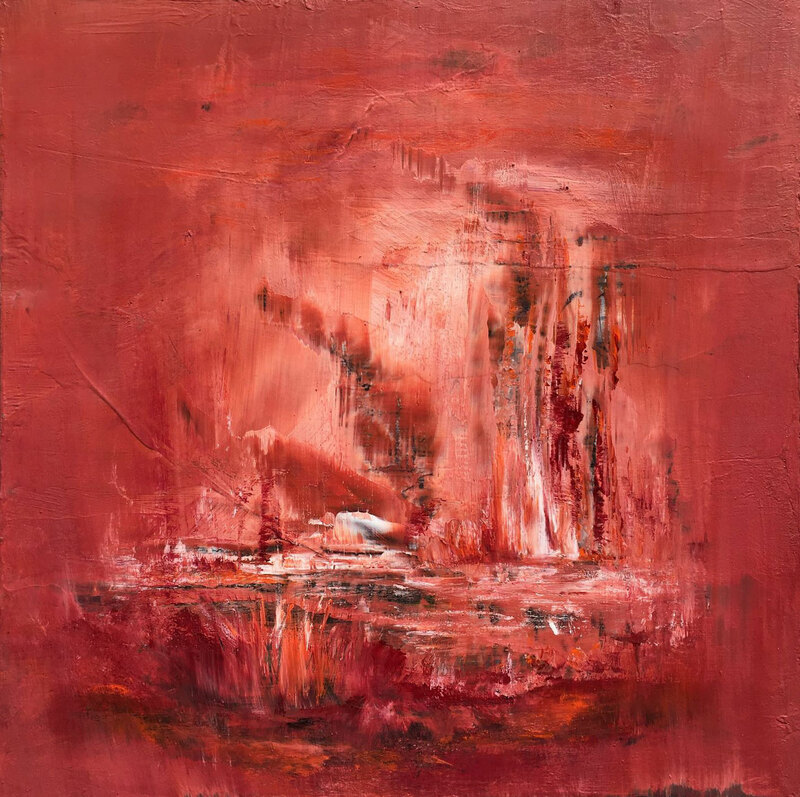 This piece has vibrant shades of red and a contrasting grey sky. 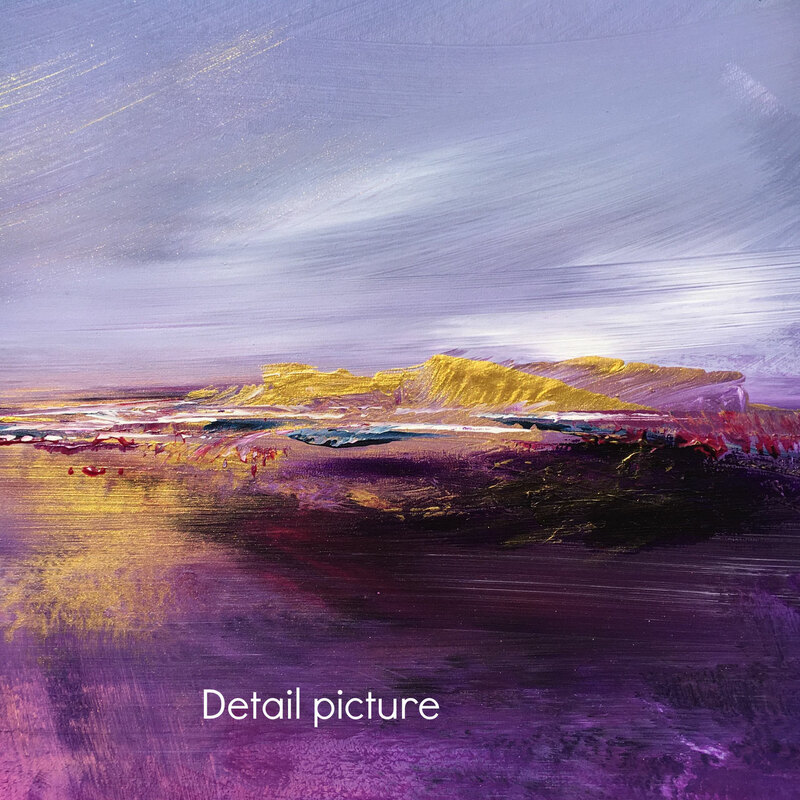 It's warm landscape with an inviting depth, full of light and beautiful details. This unique piece comes framed - ready to hang. Acrylic paint on thin HDF-board 0,3 cm (0,12 inch) - sealed with matt varnish, comes ready framed in wooden frame, white with custom made white mat. 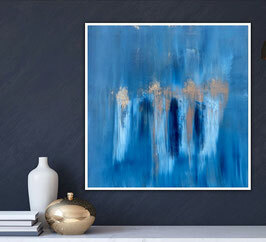 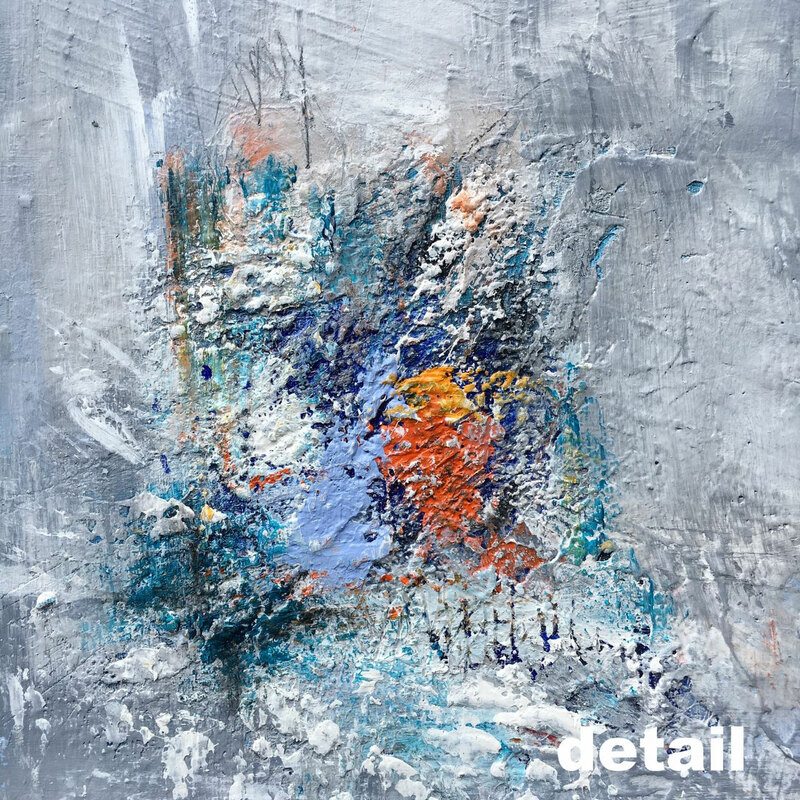 In this beautiful abstract piece different blu shades and textures catch the attention and keep the fantasy going. 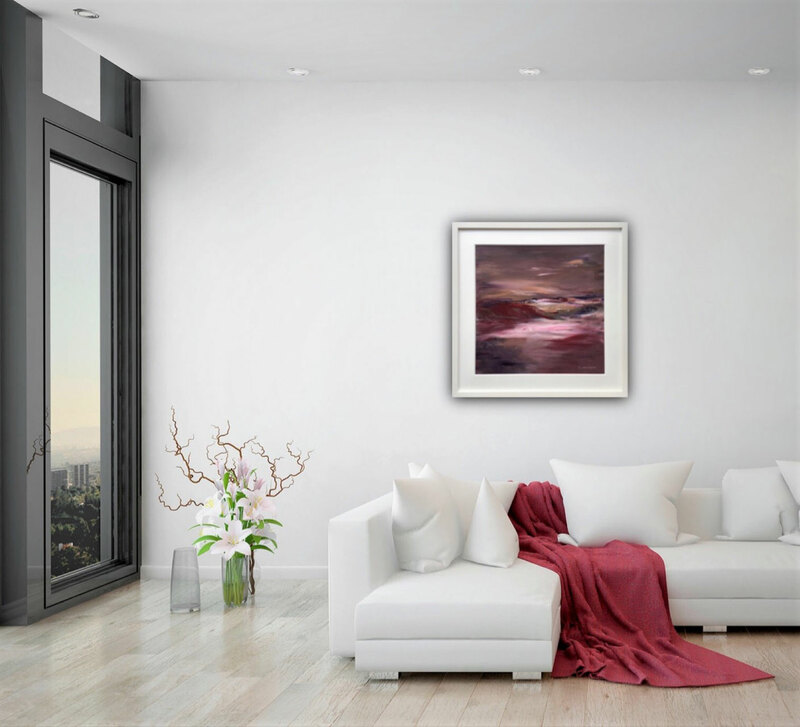 A dreamy artwork with a peaceful atmosphere, which ensures a longlasting pleasure. This original comes in white frame (wood) with white mat - ready to hang. 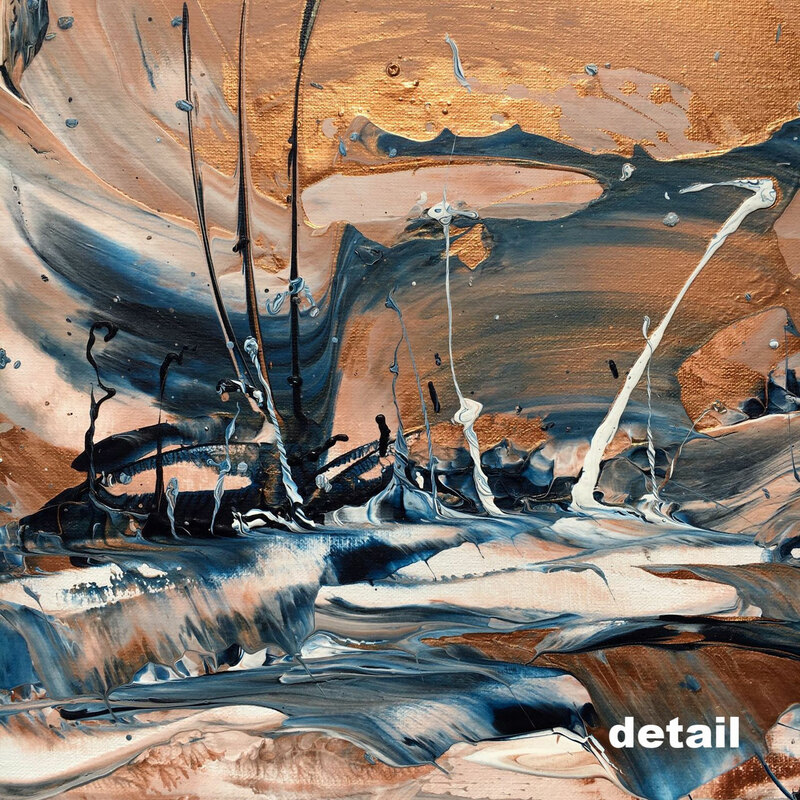 Acrylic paint on thin HDF-board 0,3 cm (0,12 inch) - Sealed with matt varnish. 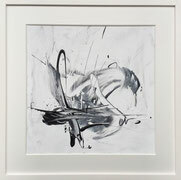 Comes ready framed in a wood frame - white, with custom made white mat. 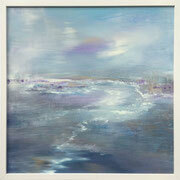 This piece is reduced in colours but has a beautiful light shining within. 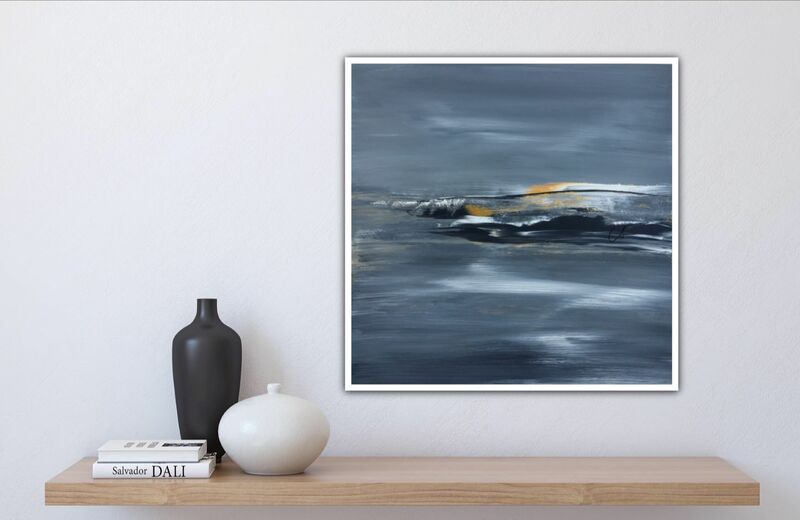 A peaceful and calming piece and for sure a long lasting eye candy. 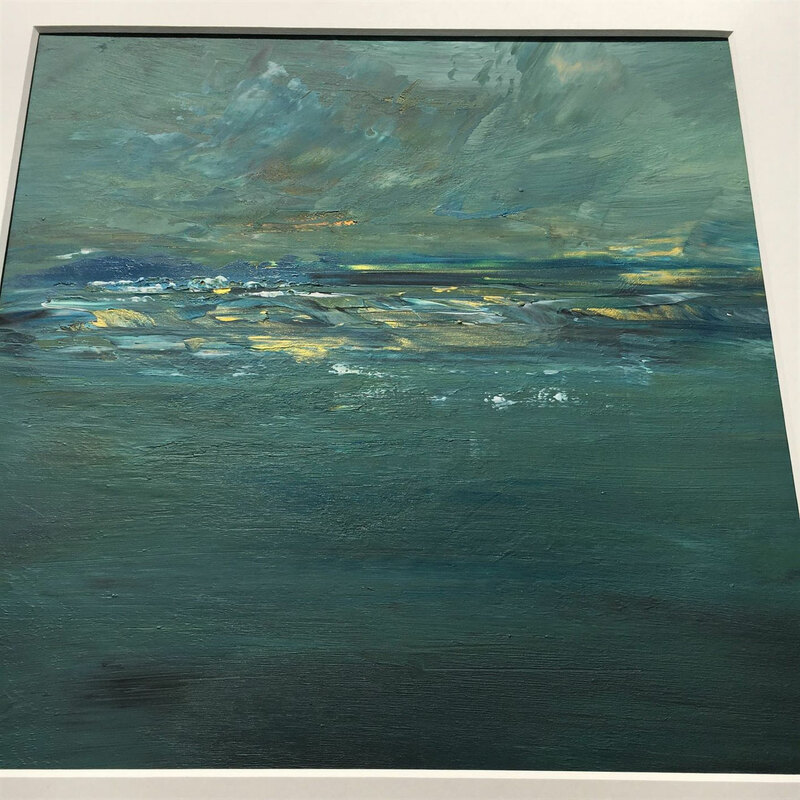 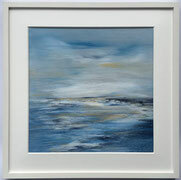 This piece comes ready framed in a white aluminium frame, ready to hang. This original comes in white frame (aluminium) - ready to hang. 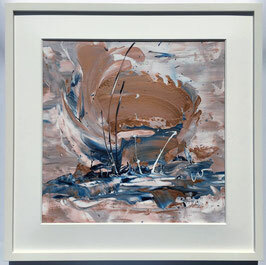 Acrylic paint on thin HDF-board 0,3 cm (0,12 inch) - comes framed in white aluminum frame - ready to hang. 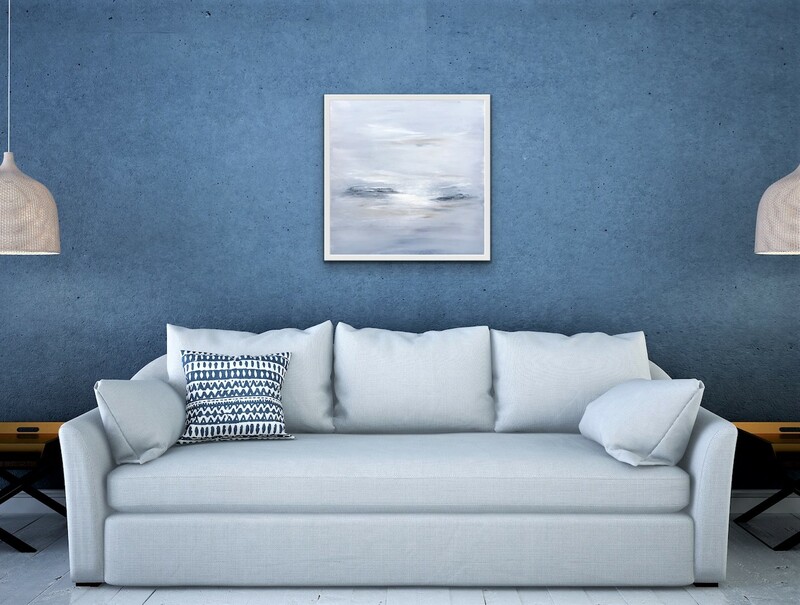 This peaceful and calming piece has soft blue shades with hints of golden light and a great depth. 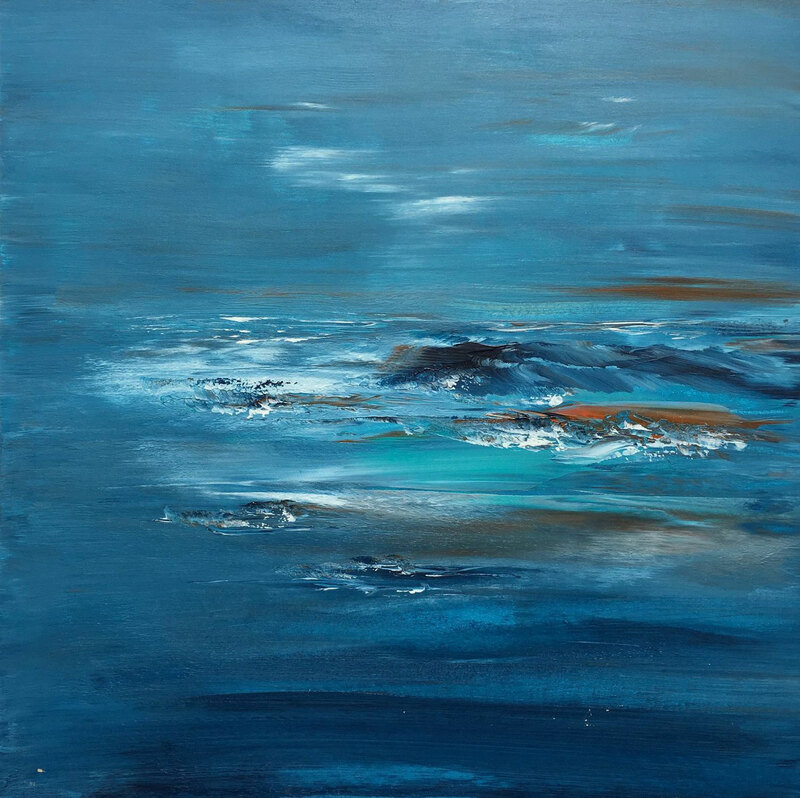 A beautiful dreamy piece for lovers of the Sea. 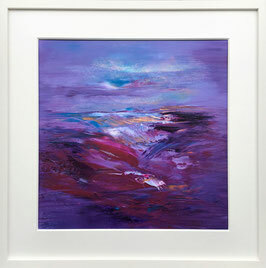 Acrylic paint on thin HDF-board 0,3 cm (0,12 inch) - ready framed. I painted this piece directly after a wonderful autumn vacation at the Atlantic Ocean in northern Spain. 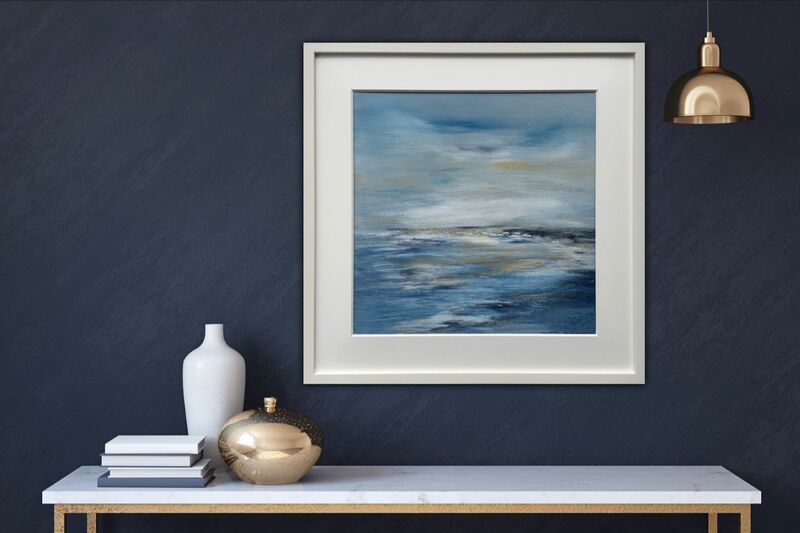 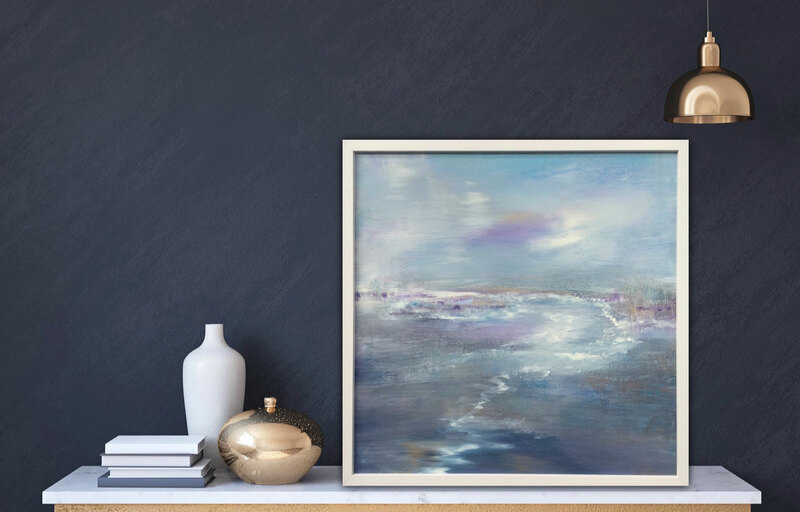 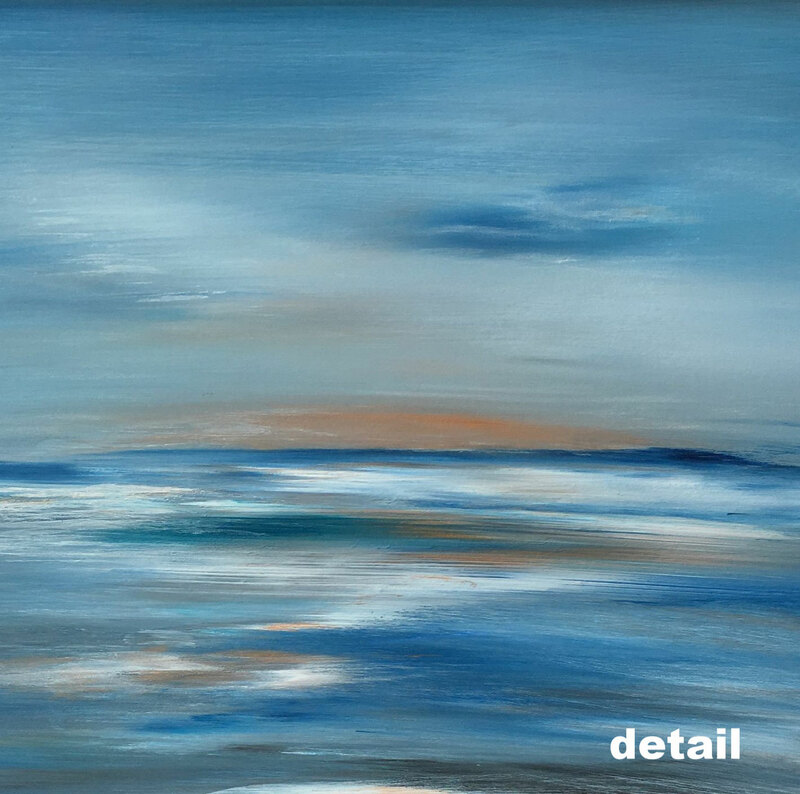 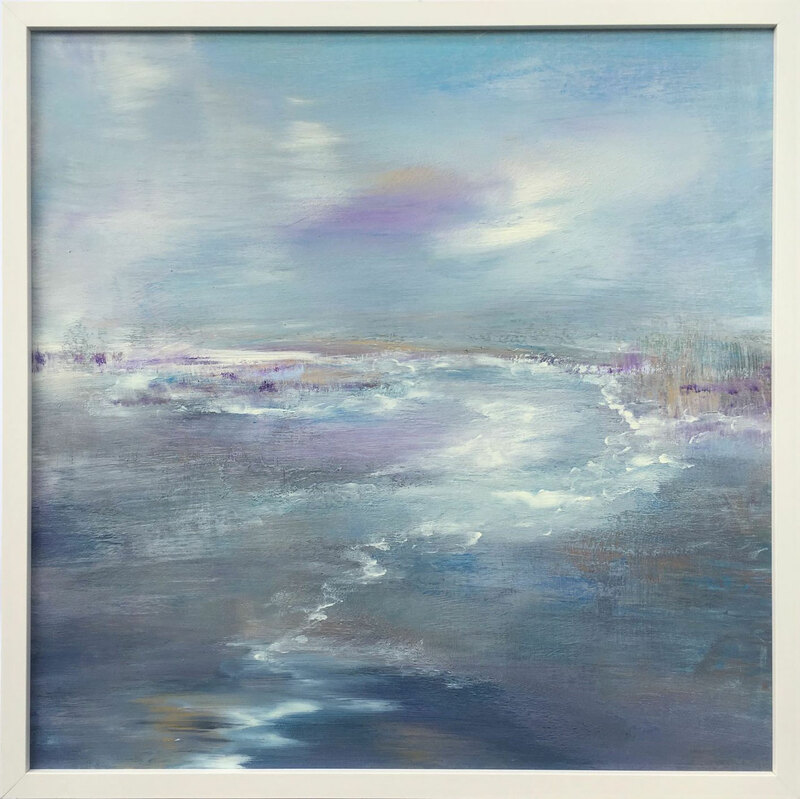 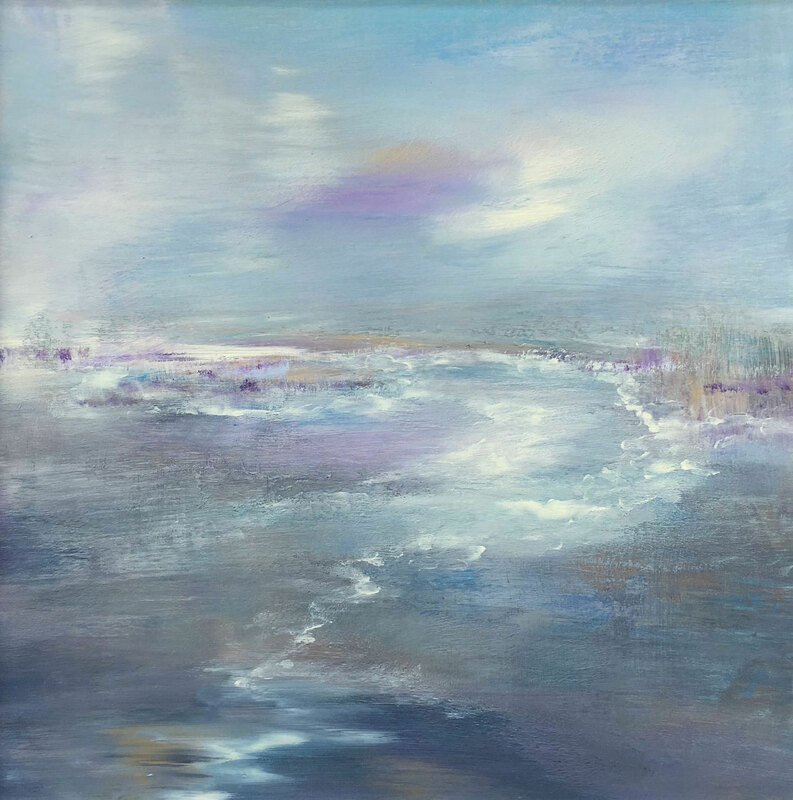 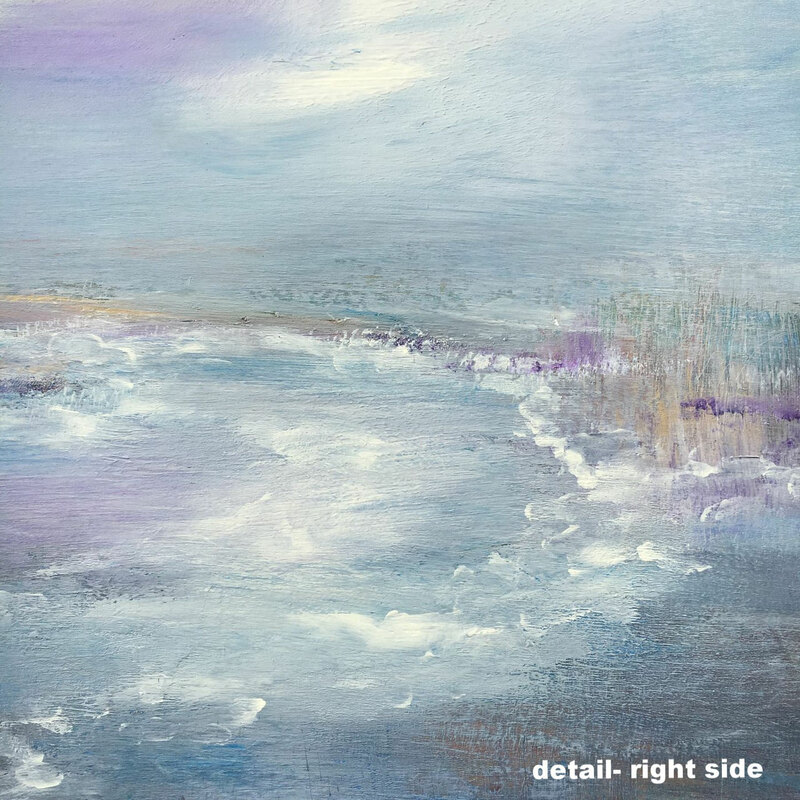 This dreamy seascape unites calme blue shades with white soft waves and great depth. 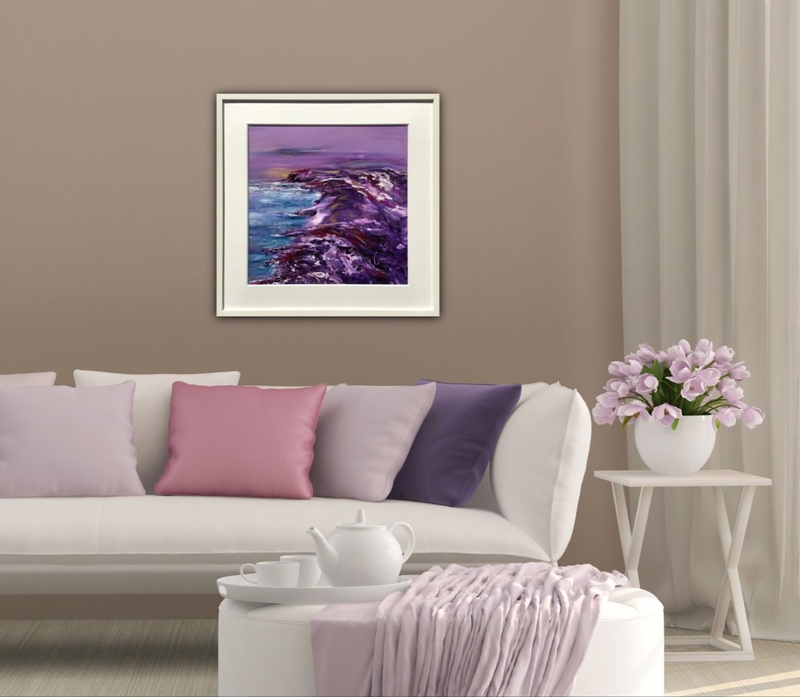 The soft light with hints of gold and violet brings a peaceful and relaxing feeling into your home / office - or could be a great and unique gift for someone you love. 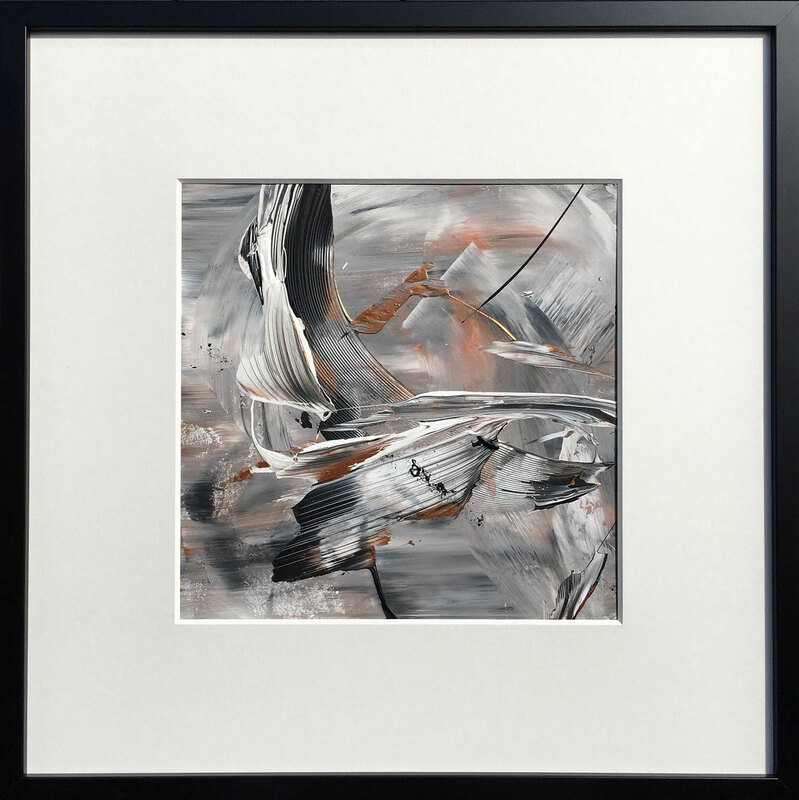 This original comes in white frame (wood) - ready to hang. 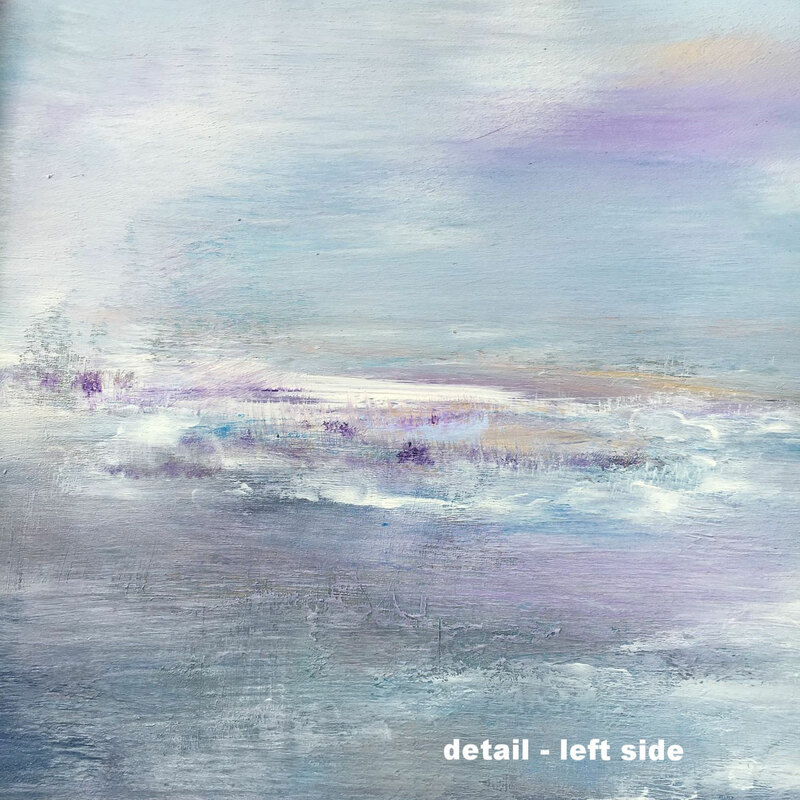 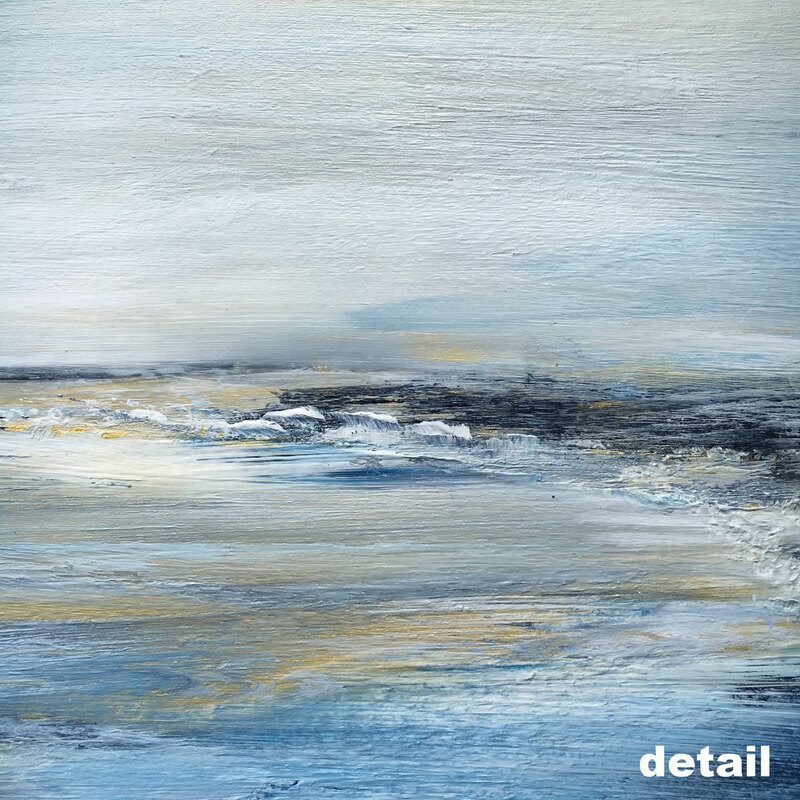 This piece is reduced in colours but has so many exciting details, a great texture (with sand) and a mysterious radiosity. 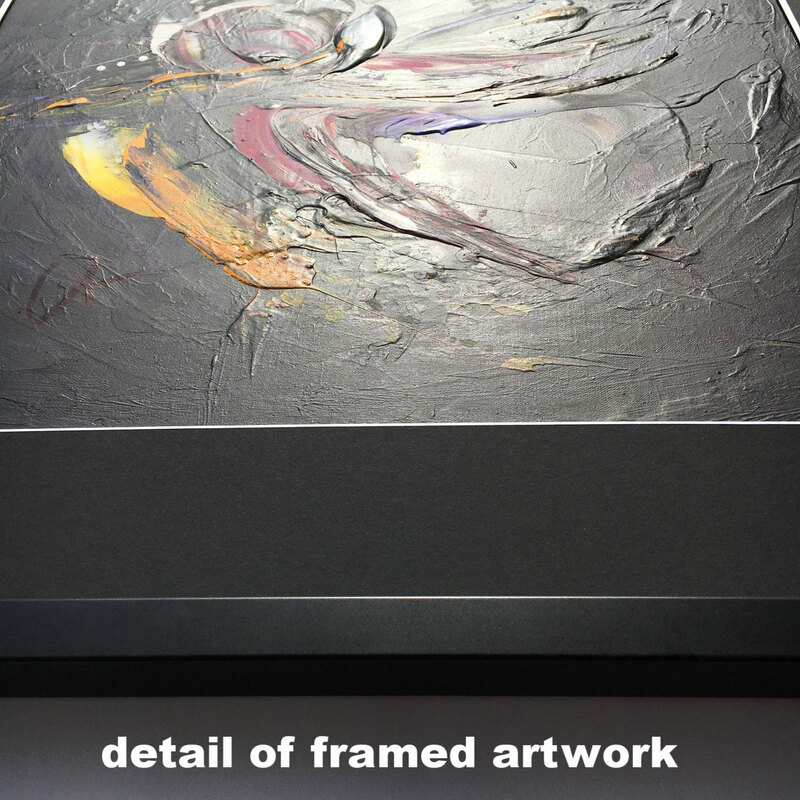 I recommend to hang it framed without glass to show the beautiful and special surface. 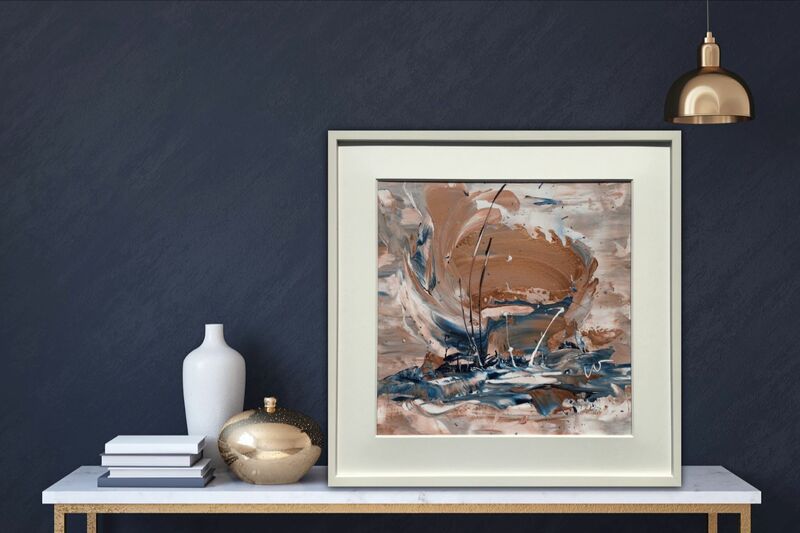 This piece in soothing blue hues with warm copper shades is full of fantasy and lightness. 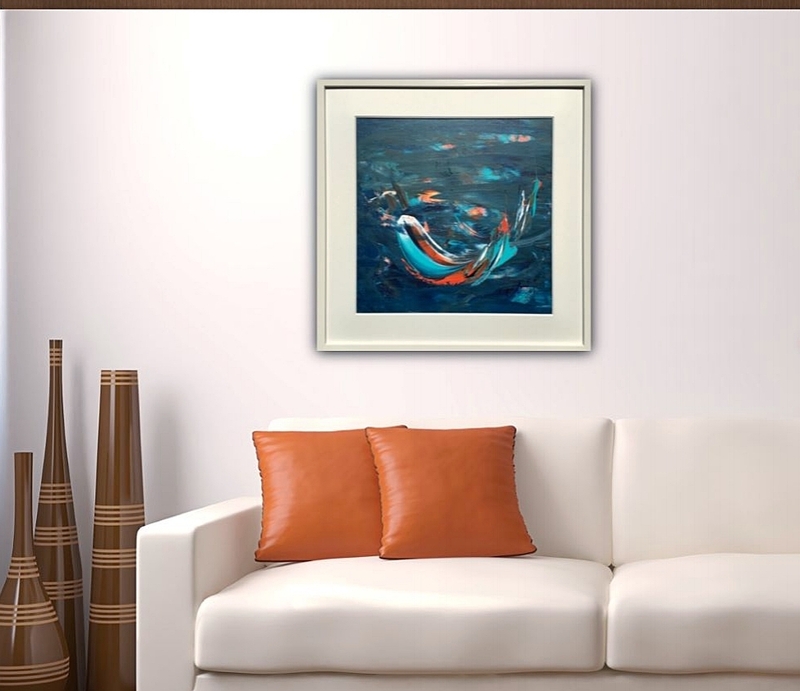 A beautiful eye-catcher piece which guarantees a longlasting pleasure. 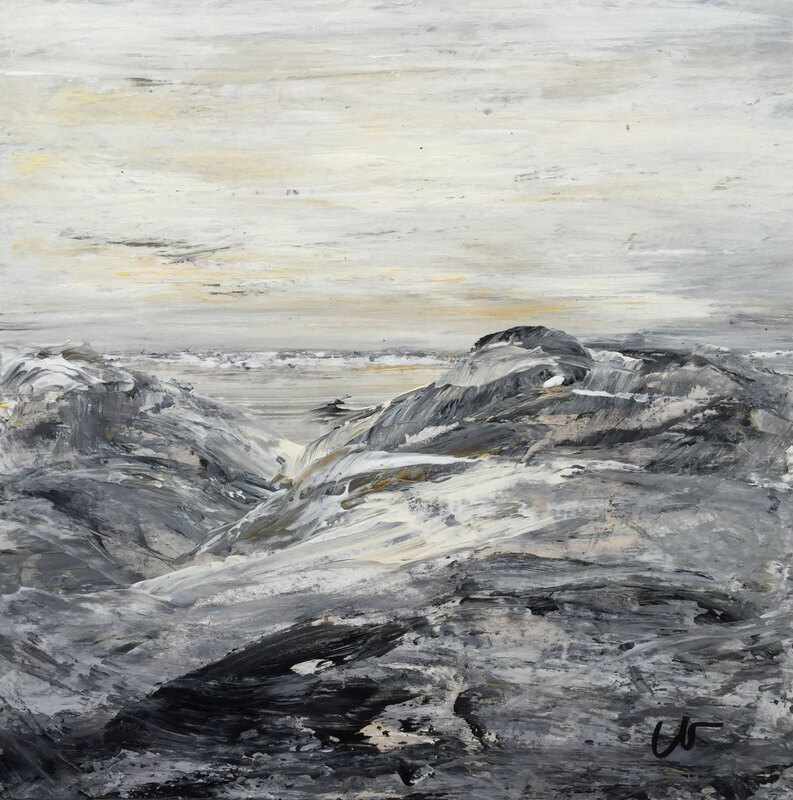 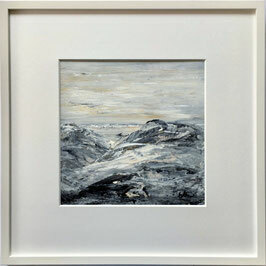 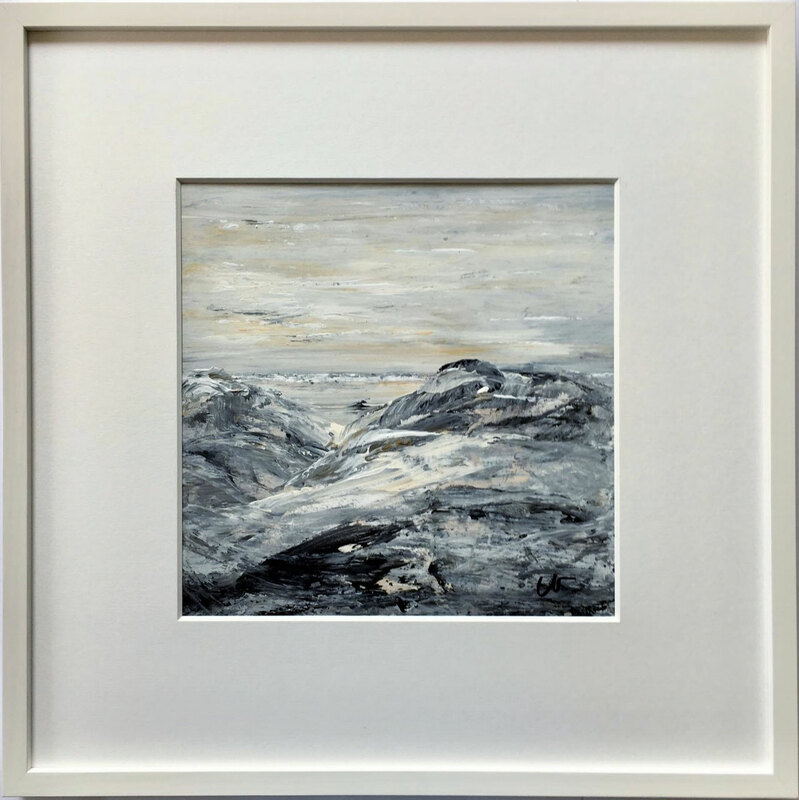 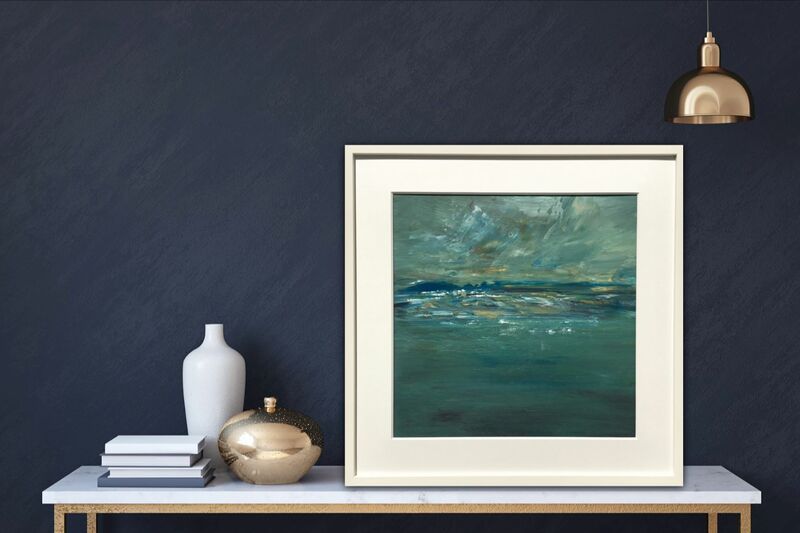 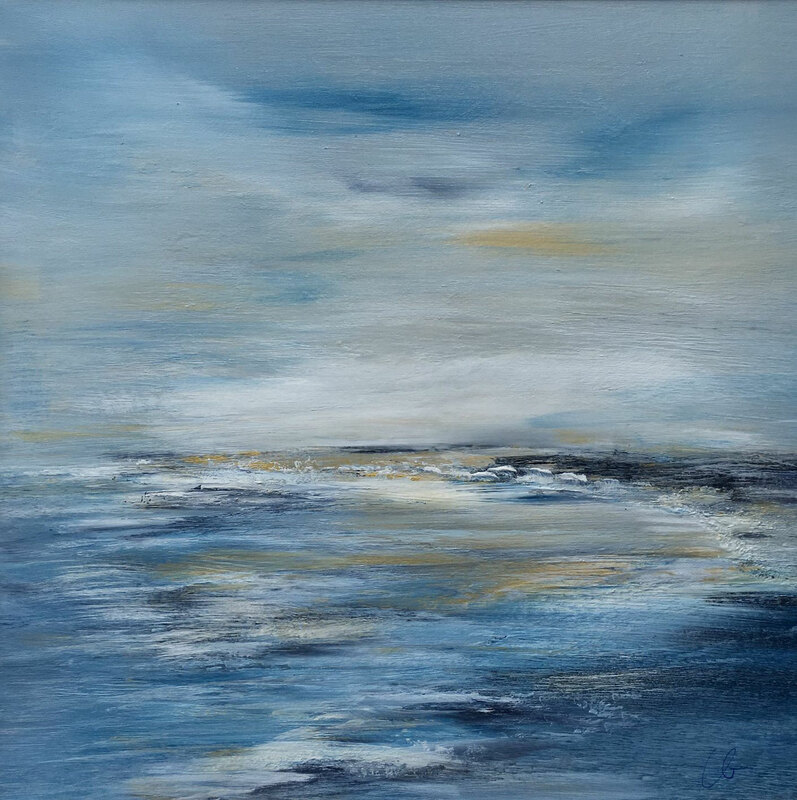 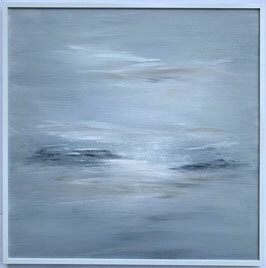 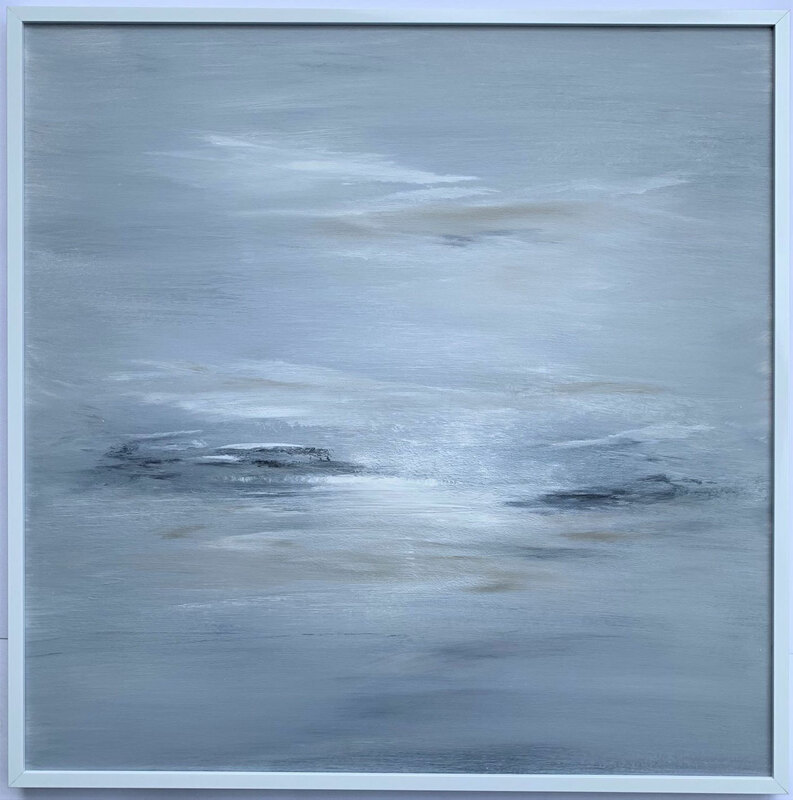 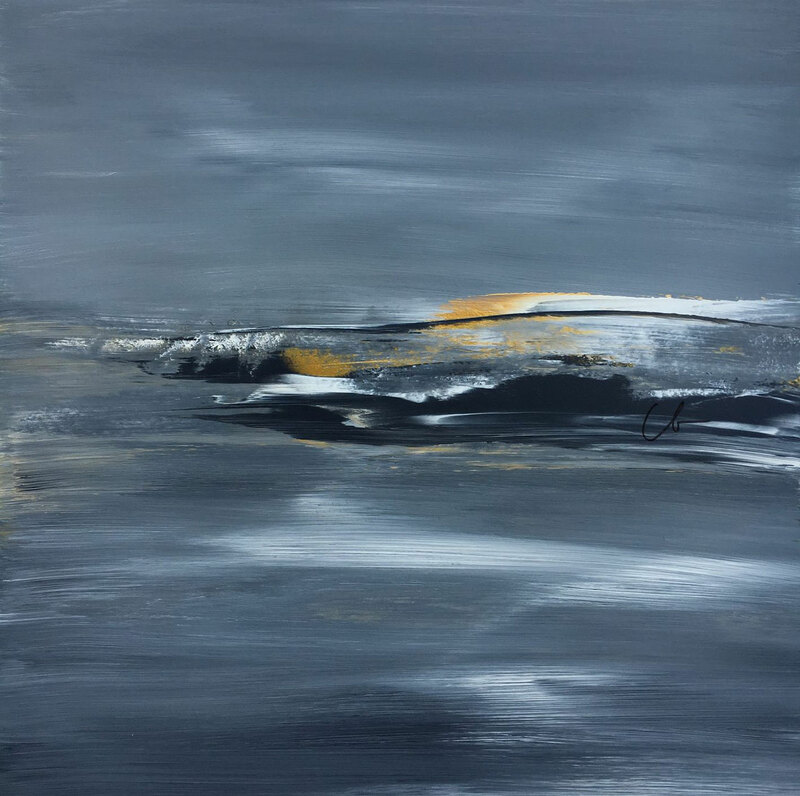 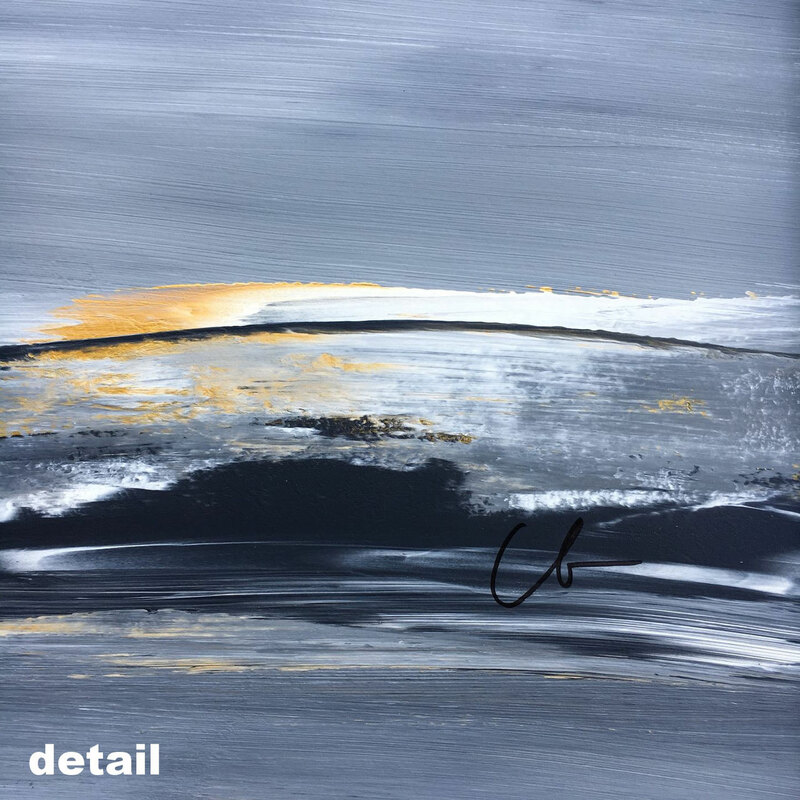 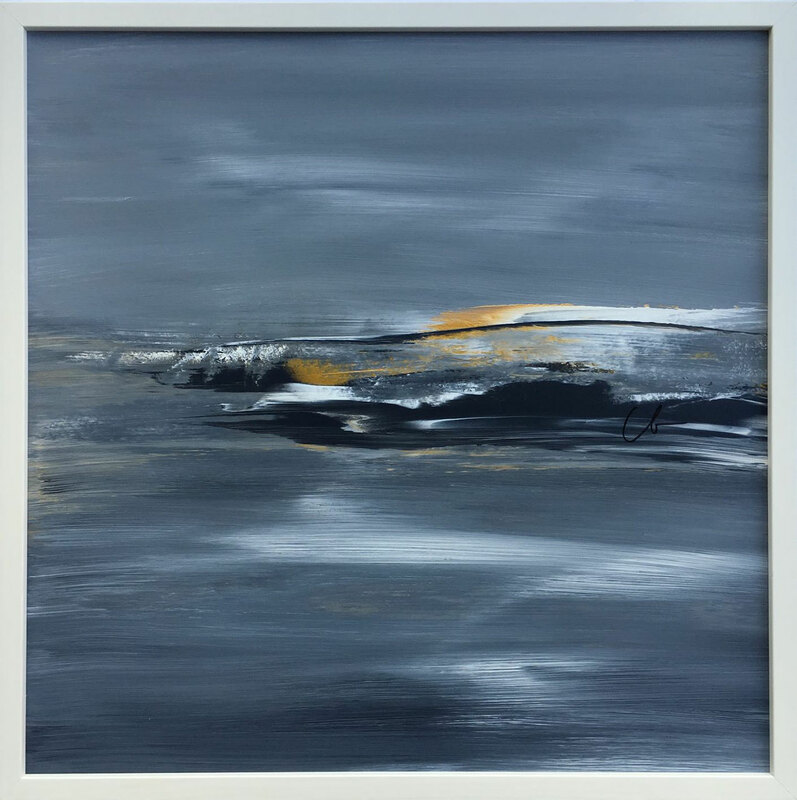 This piece has soothing paynes grey shades a great depth and an inviting golden horizon. 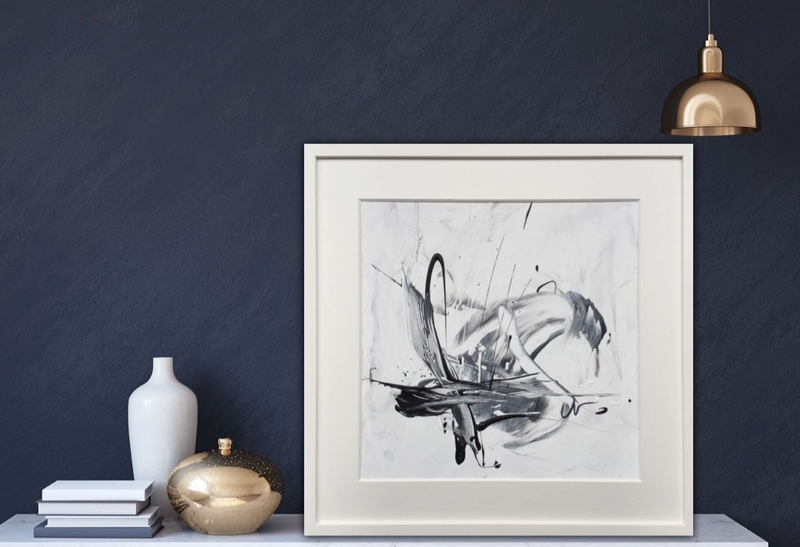 A rather minimalist piece and therefore a long lasting gem. 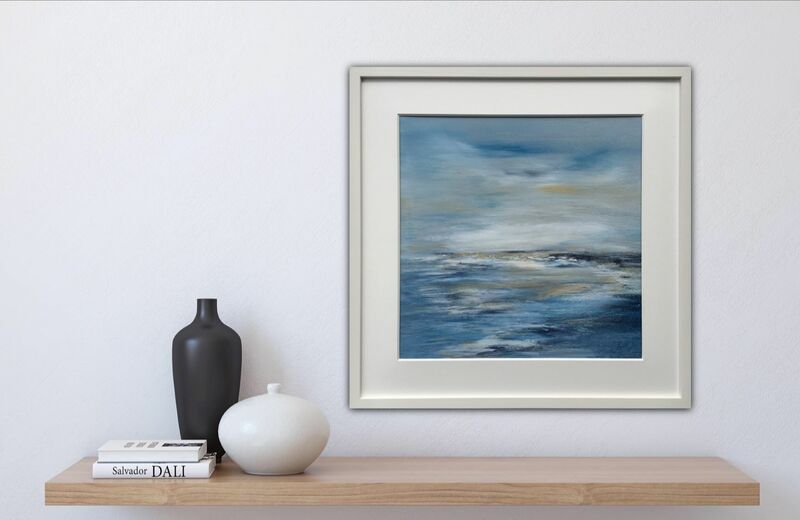 This original comes in a white frame (wood) - ready to hang. 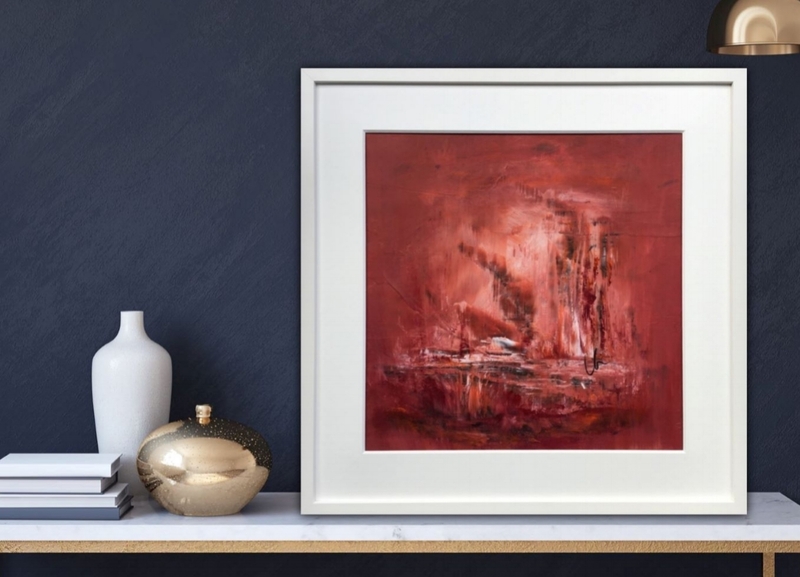 This piece has vibrant shades of copper and red. It's a powerful and warm landscape with an inviting depth. Every painting can stand alone as single eye-catcher or can be arranged with other pieces of the series. 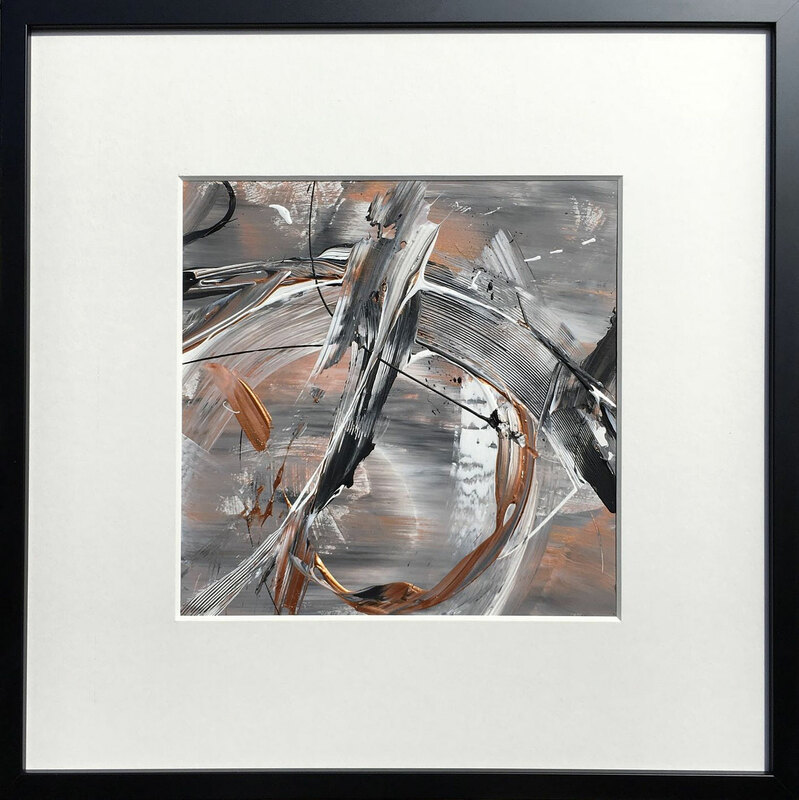 This original comes in a white frame (wood) with white mat - ready to hang. Every piece of my "dreamscape" series conveys it's very unique feeling due to the colour choice and composition. 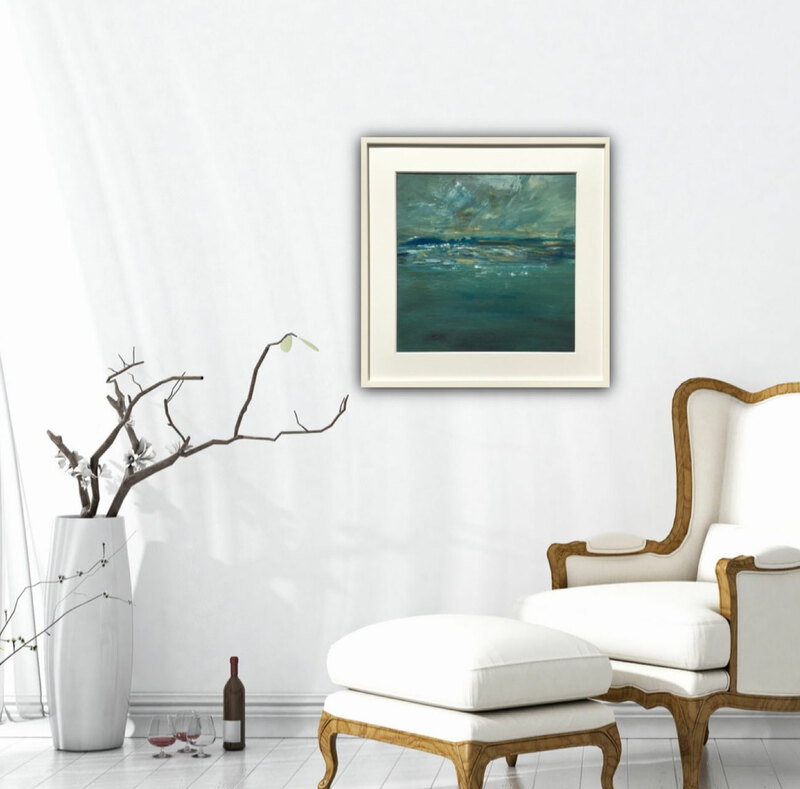 This piece unites different shades of green with hints of gold and forms a imaginative recreating landscape. 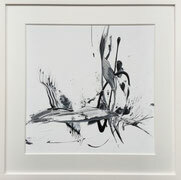 A rather minimalist piece and therefore a long lasting gem. 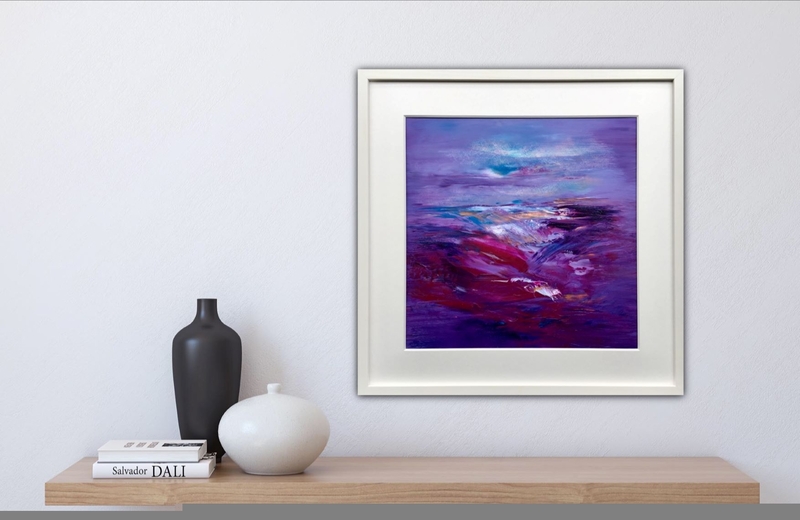 Every piece of my "dreamscape" series conveys it's very unique feeling due to the colour choice and composition. 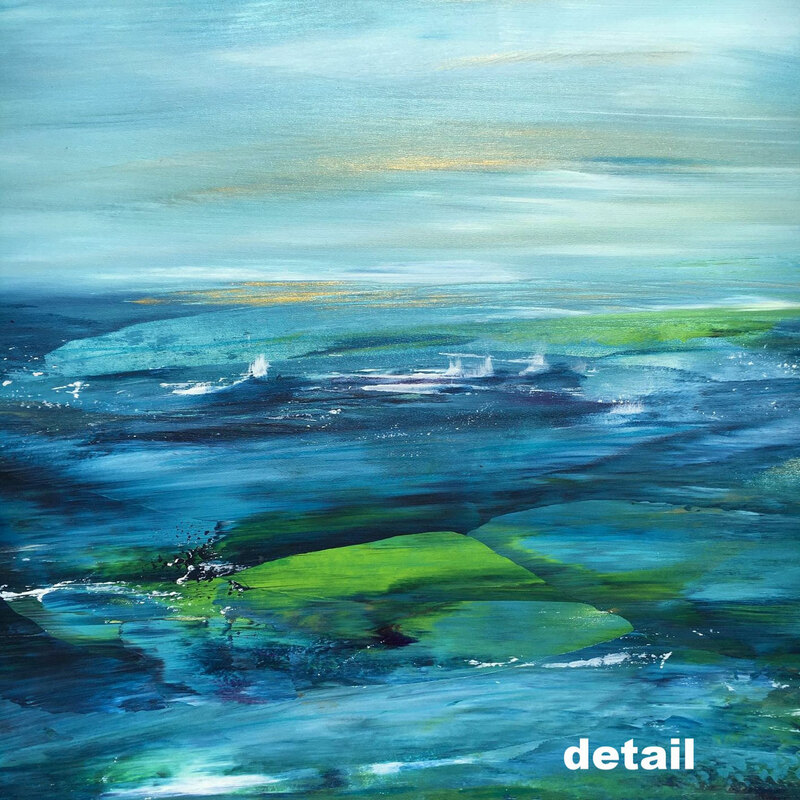 This piece has vibrant blue shades, it is an attractive and peaceful work with depth and beautiful details. 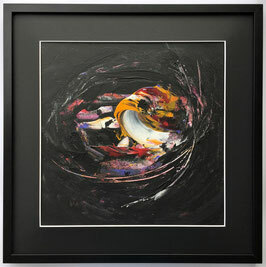 Every painting can stand alone as a single eye-catcher or can be arranged with other pieces from the series. 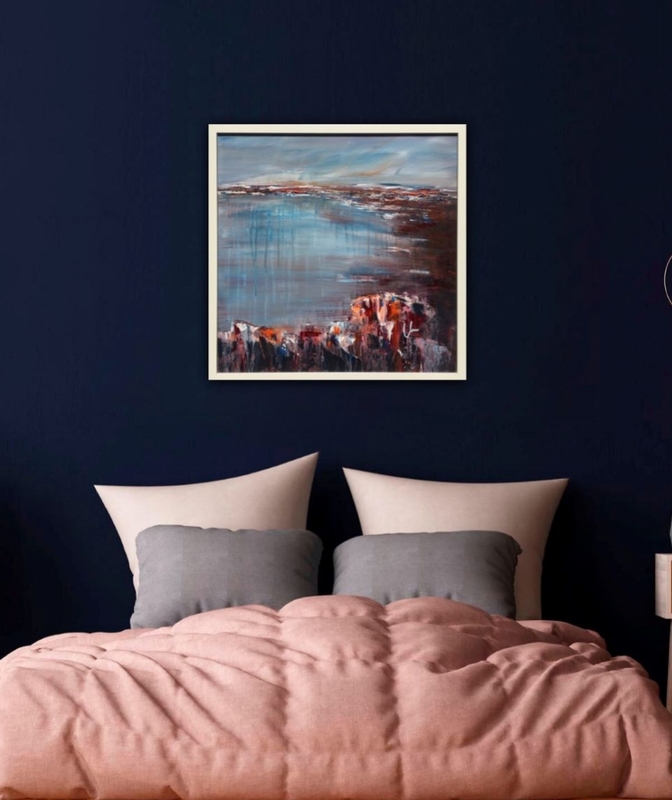 Every piece of my "dreamscape" series conveys it's very unique feeling due to the colour choice and composition. 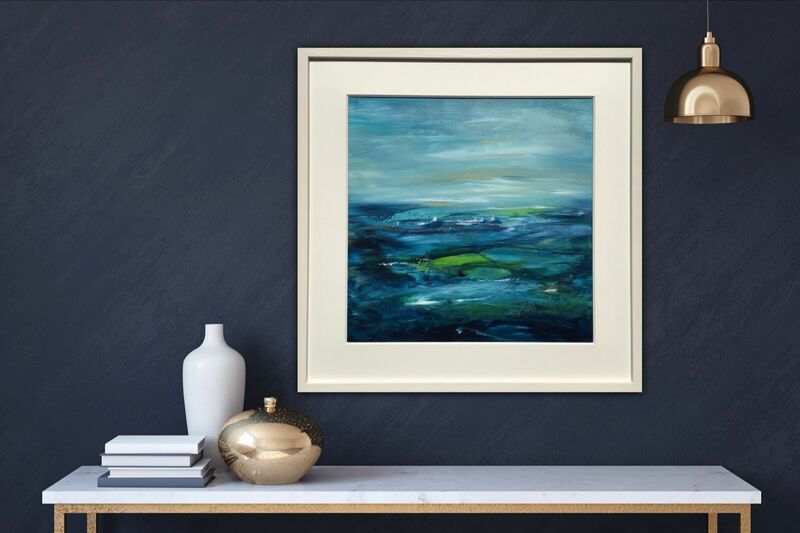 This piece has vibrant blue and green shades with a hint of gold. 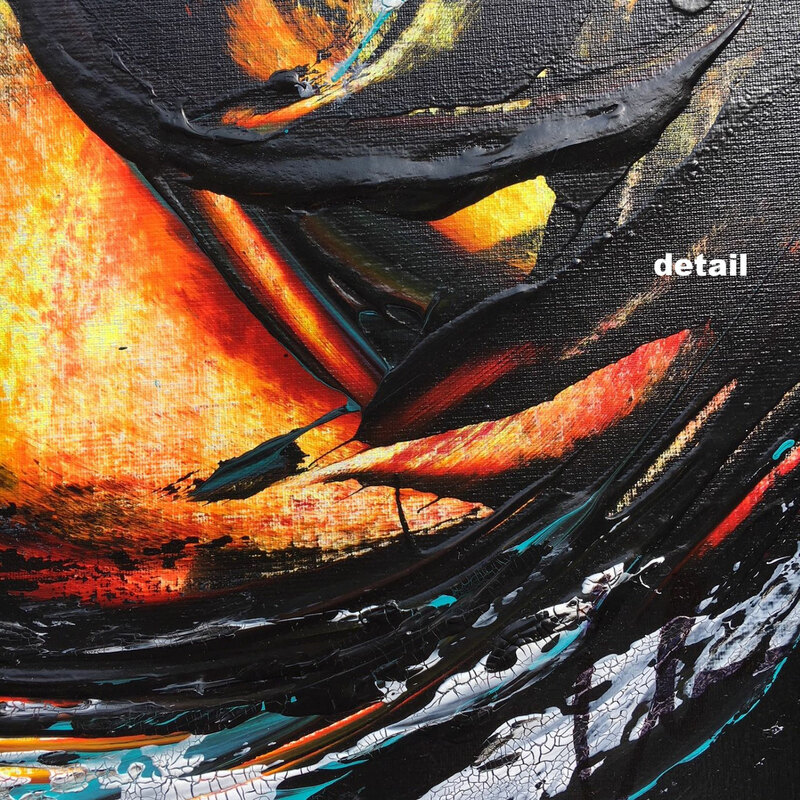 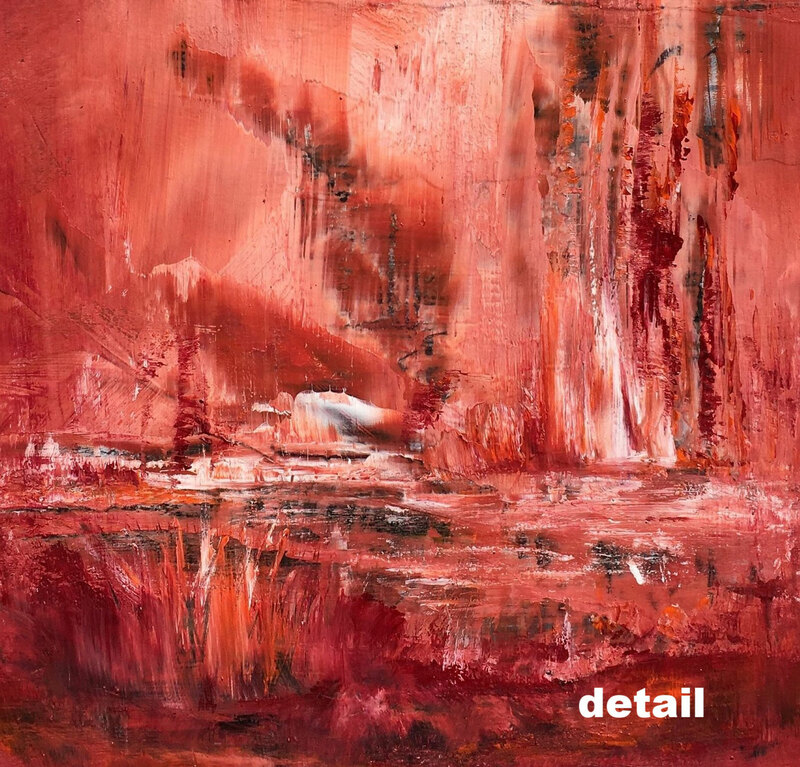 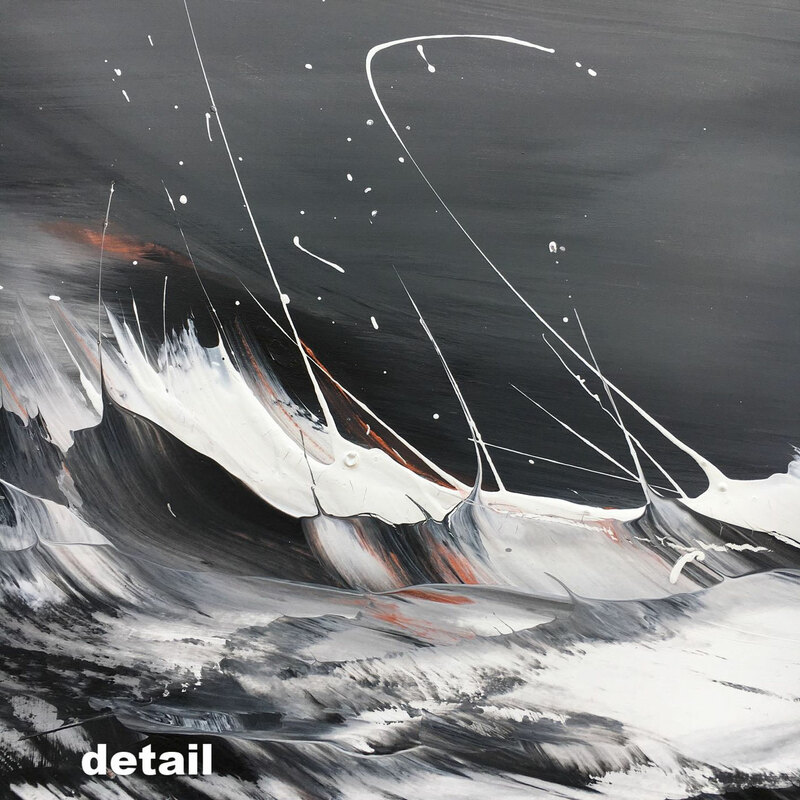 It's an peaceful and attractive work with depth and beautiful details. 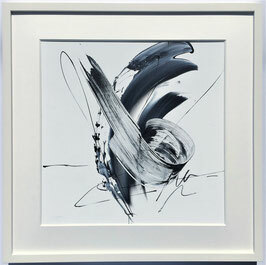 This piece has found a new owner in Germany. 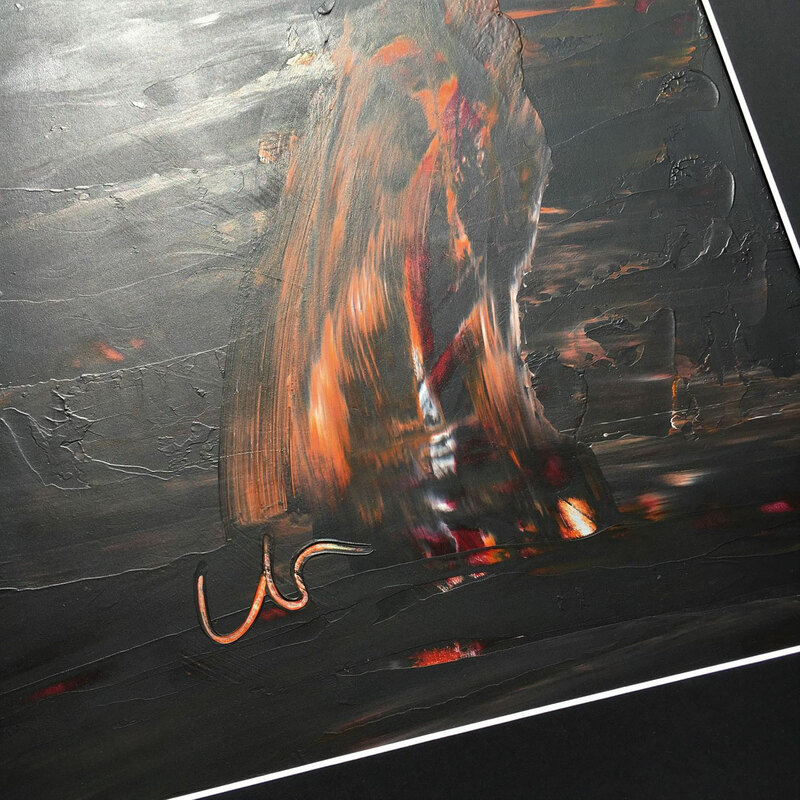 Acrylic paint on thin HDF-board 0,3 cm (0,12 inch) - needs framing. 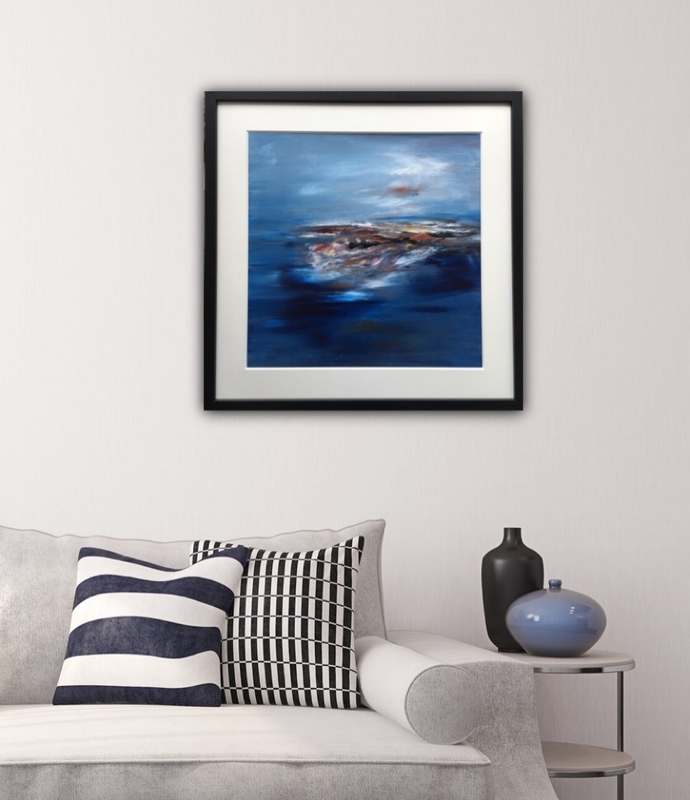 Every piece of my "dreamscape" series conveys it's very unique feeling due to the colour choice and composition. 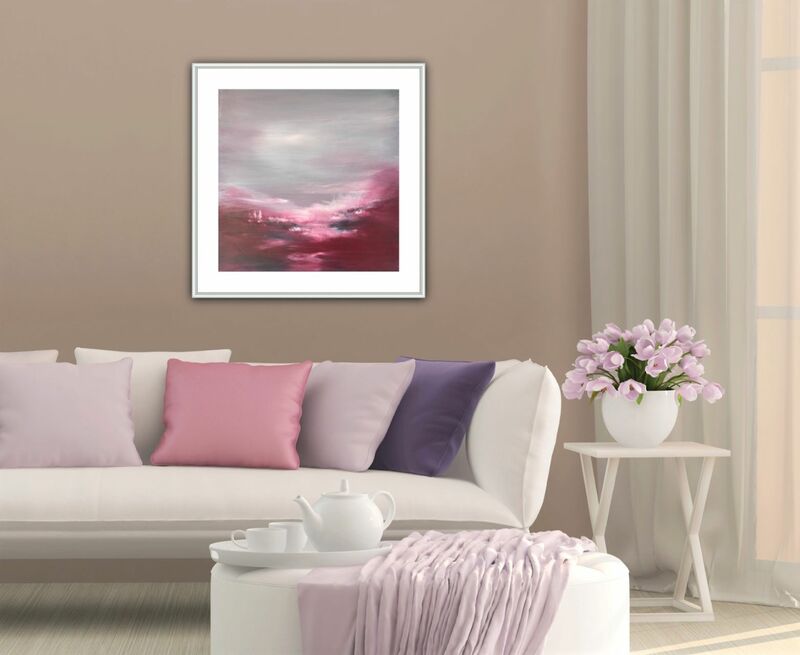 This piece has vibrant pink and violett shades, it is an attractive and special work full of fantasy and beautiful details. 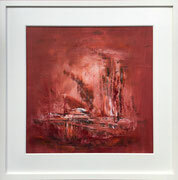 Every painting can stand alone as a single eye-catcher or can be arranged with other pieces from the series. 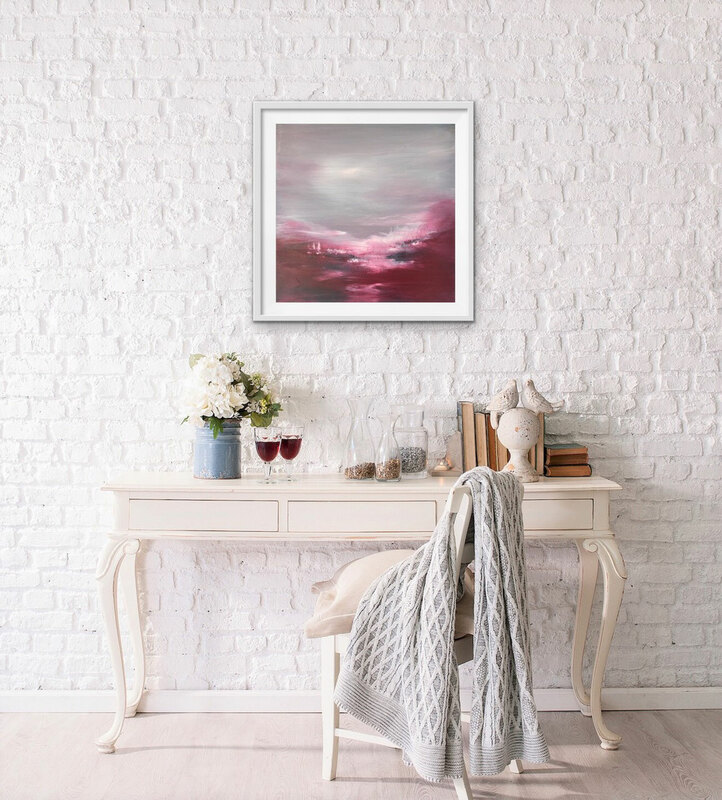 I created this abstract "dreamscape" series, to express the recreating and recharging feelings I contribute to nature adding a dreamy fantasy note to it. 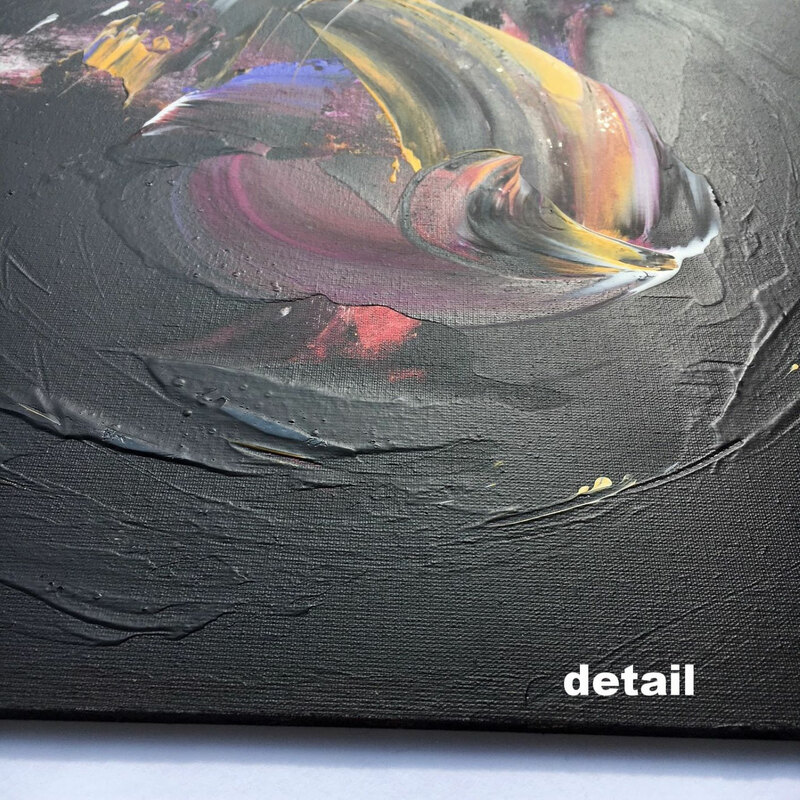 Every piece conveys it's very unique feeling due to the colour choice and composition. 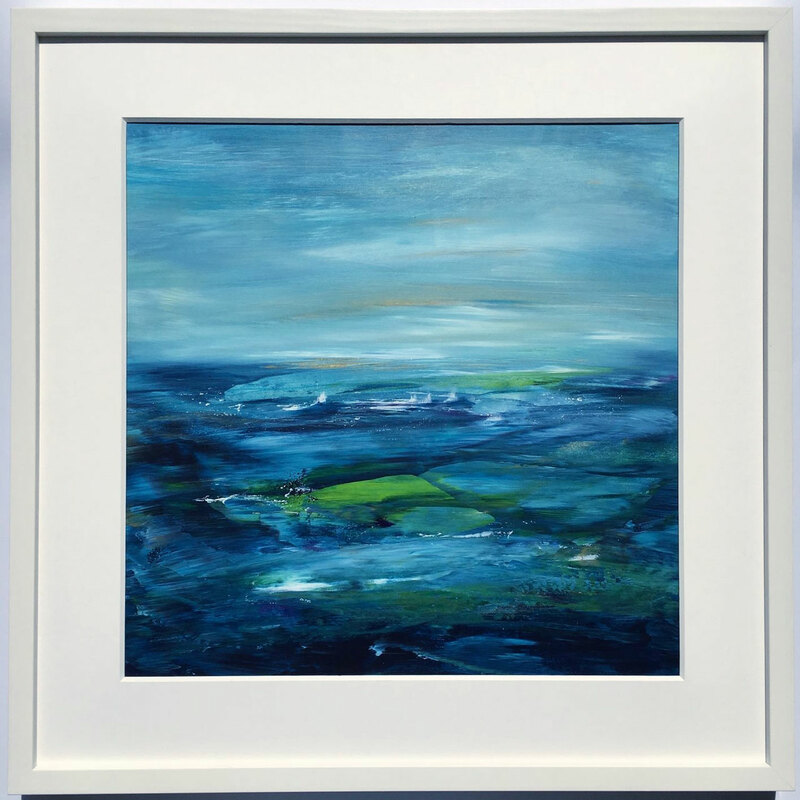 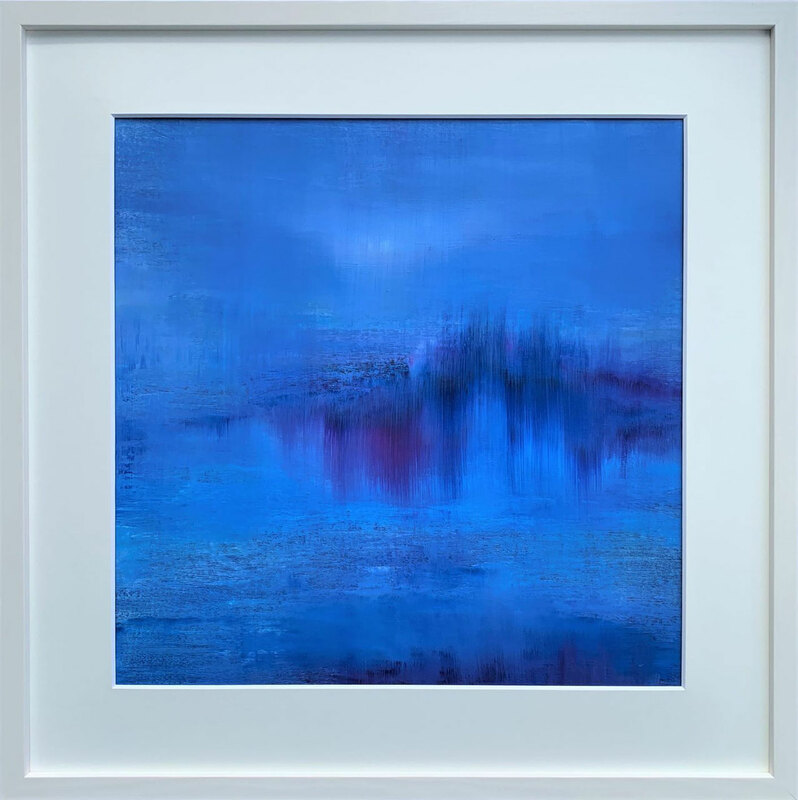 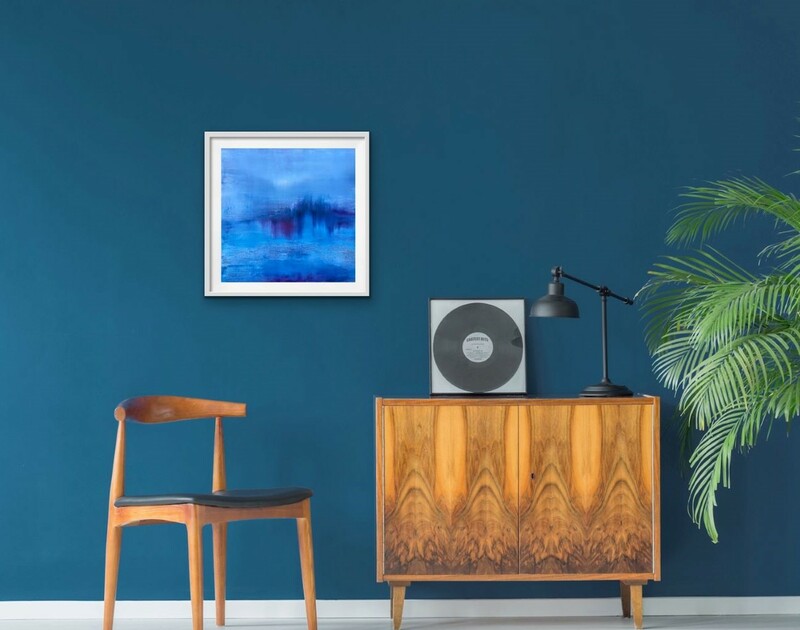 This piece has vibrant blue shades, it is a peaceful and at the same time fascinating piece, with lots of depth and beautiful colourful details. Every painting can stand alone as a single eye-catcher or can be arranged with other pieces from the series. 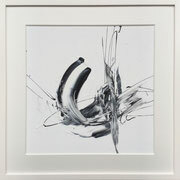 This original comes in black frame (wood) with white mat - ready to hang. 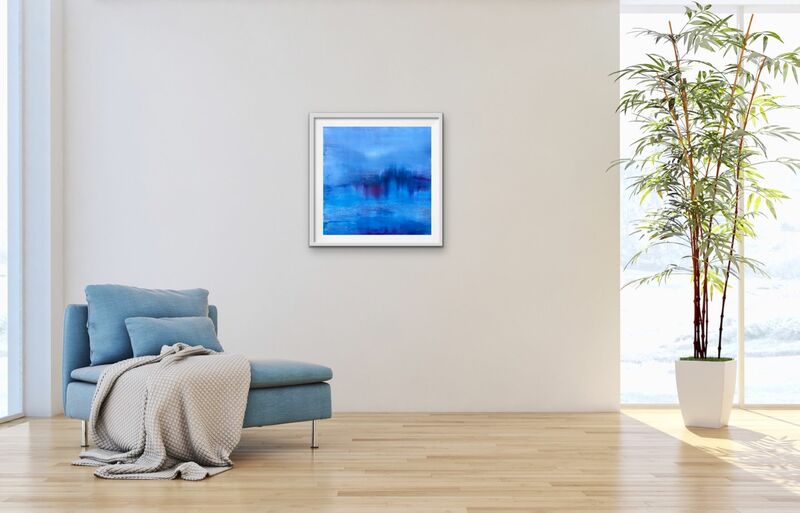 I created this abstract "dreamscape" series, because I wanted to express the recreating and recharging feelings I contribute to nature - adding a dreamy fantasy note to it. 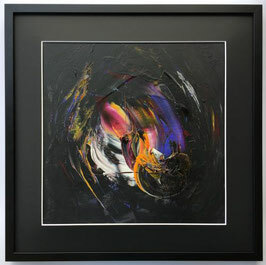 Every piece conveys it's very unique feeling due to the colour choice and composition. 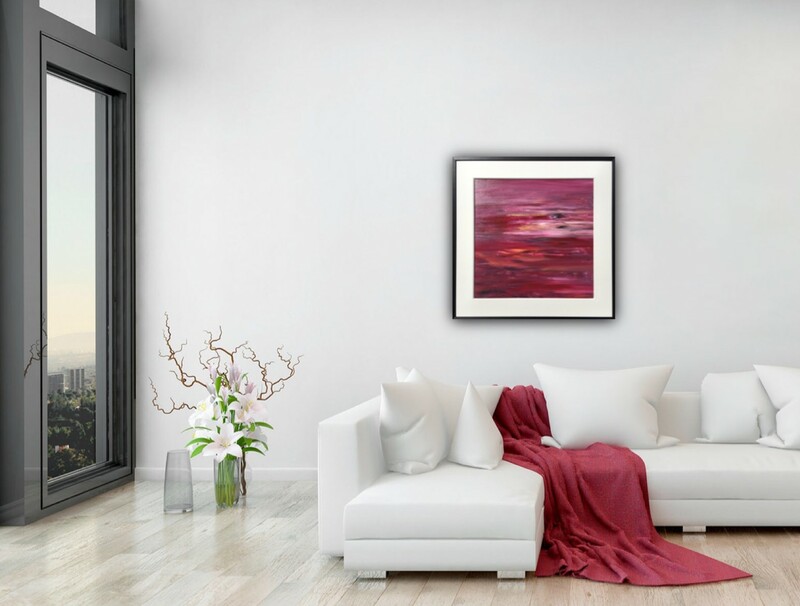 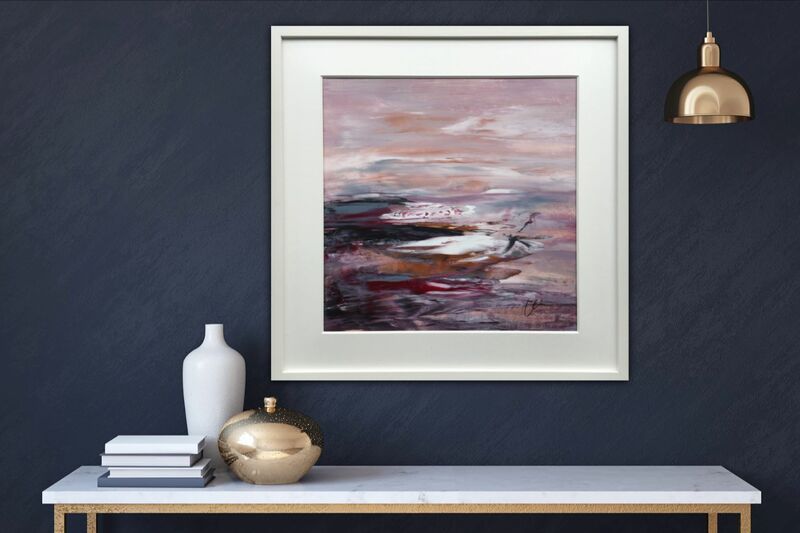 This piece has vibrant shades of copper mixed with, red, grey white and bright purple. 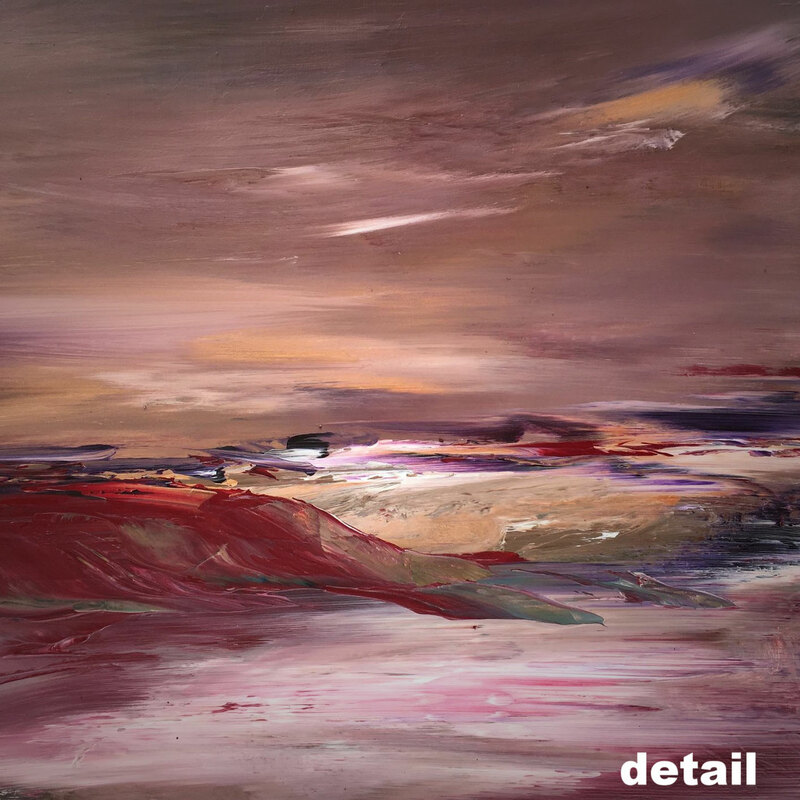 It's a warm, elegant and inviting abstract landscape with exciting details. 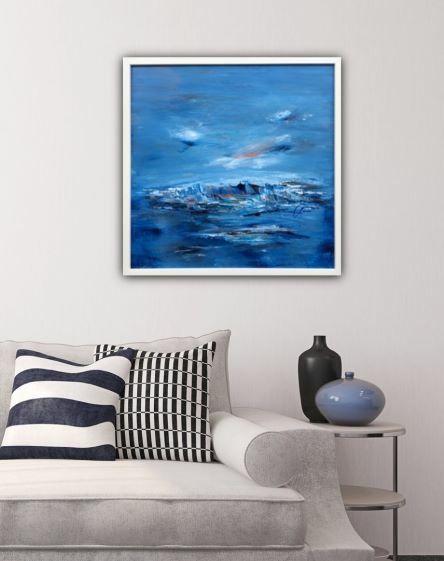 Every piece of my "dreamscape" series conveys it's very unique feeling due to the colour choice and composition. 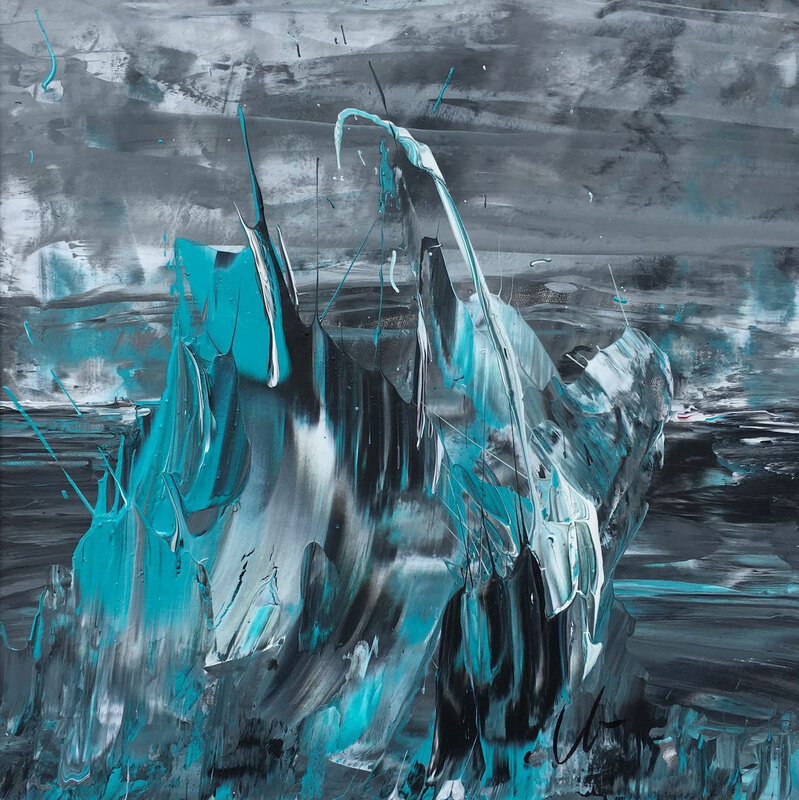 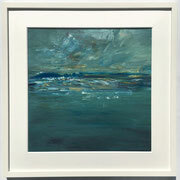 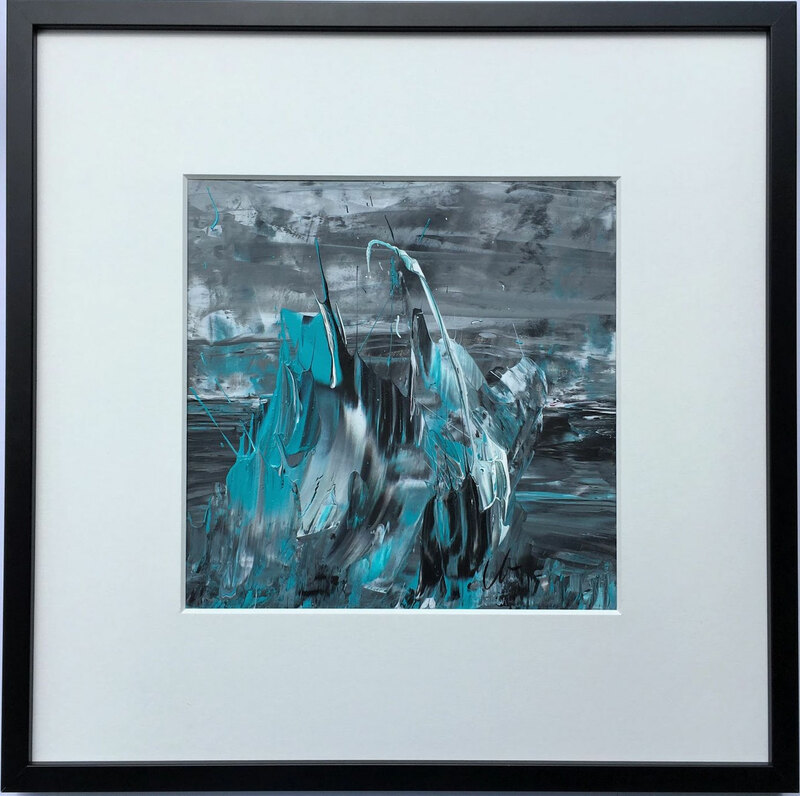 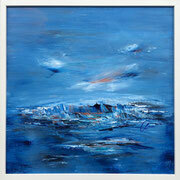 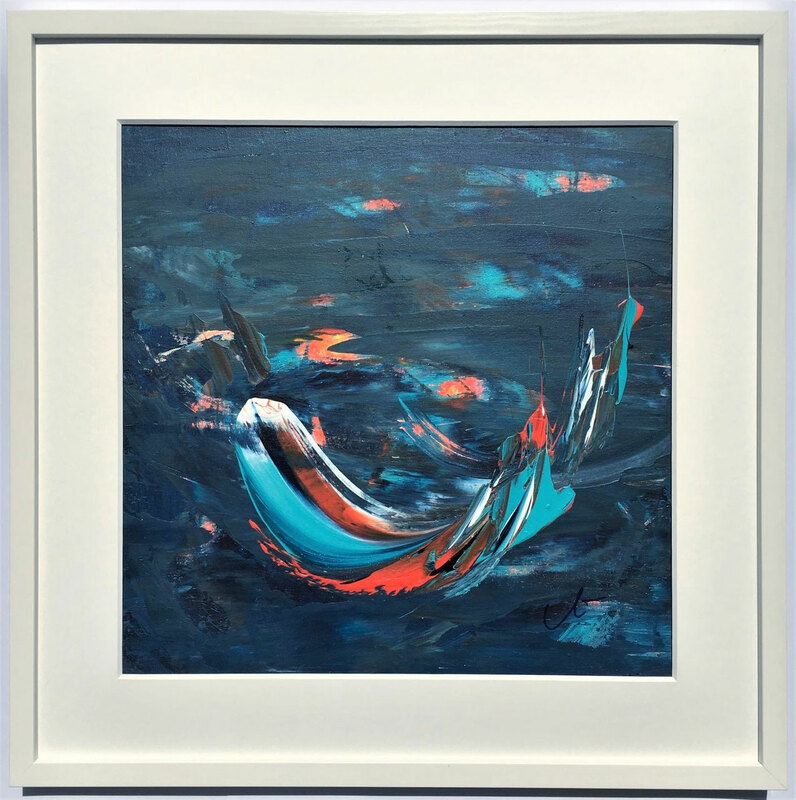 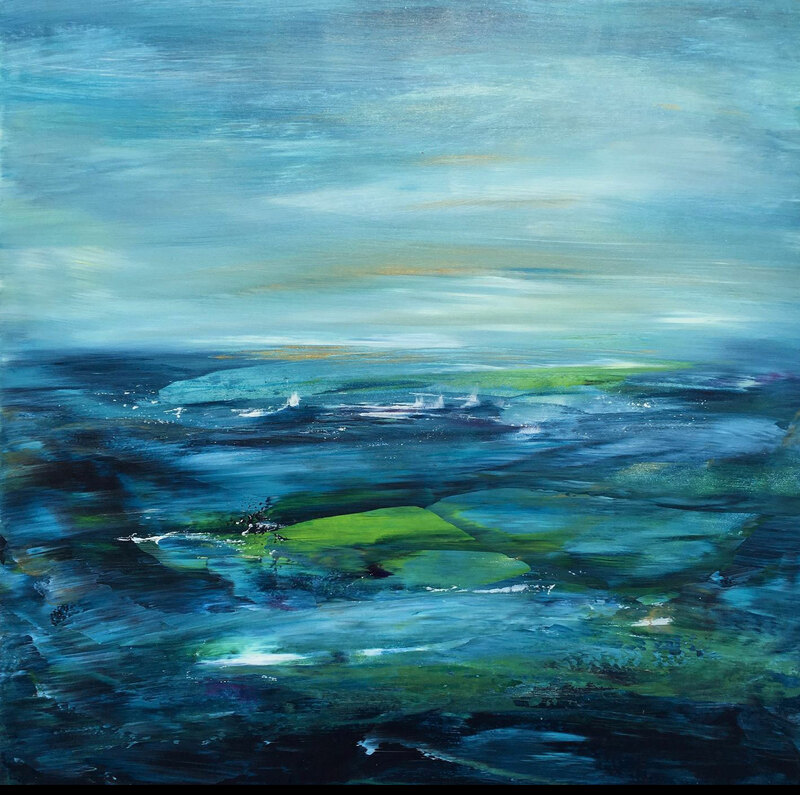 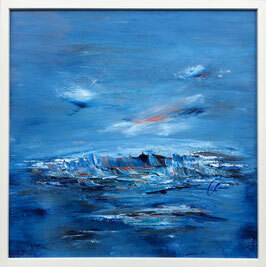 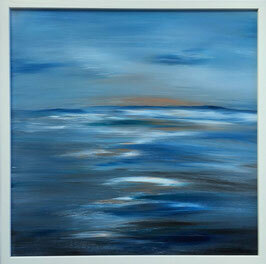 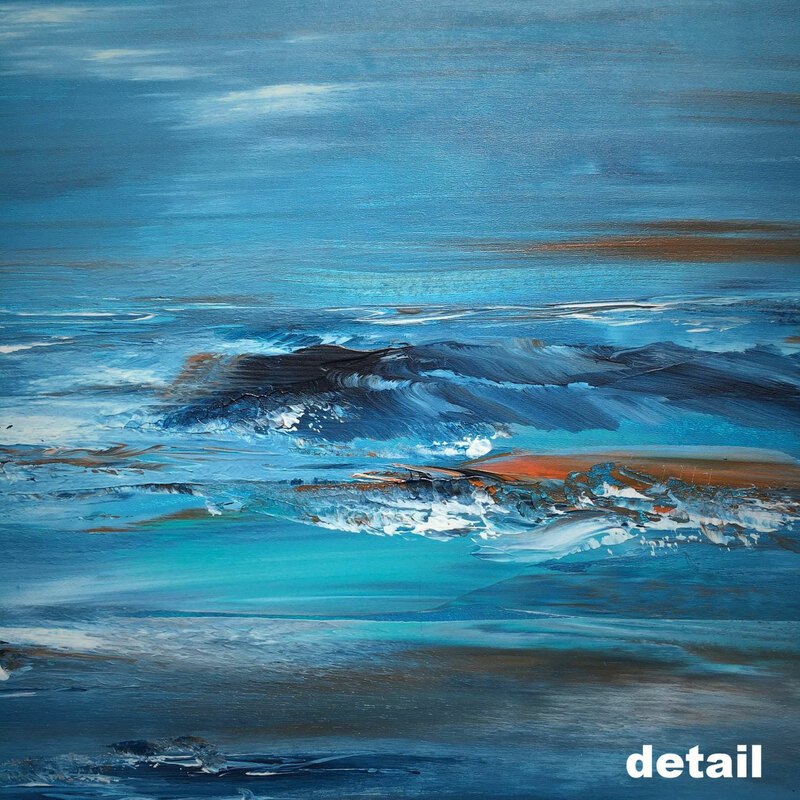 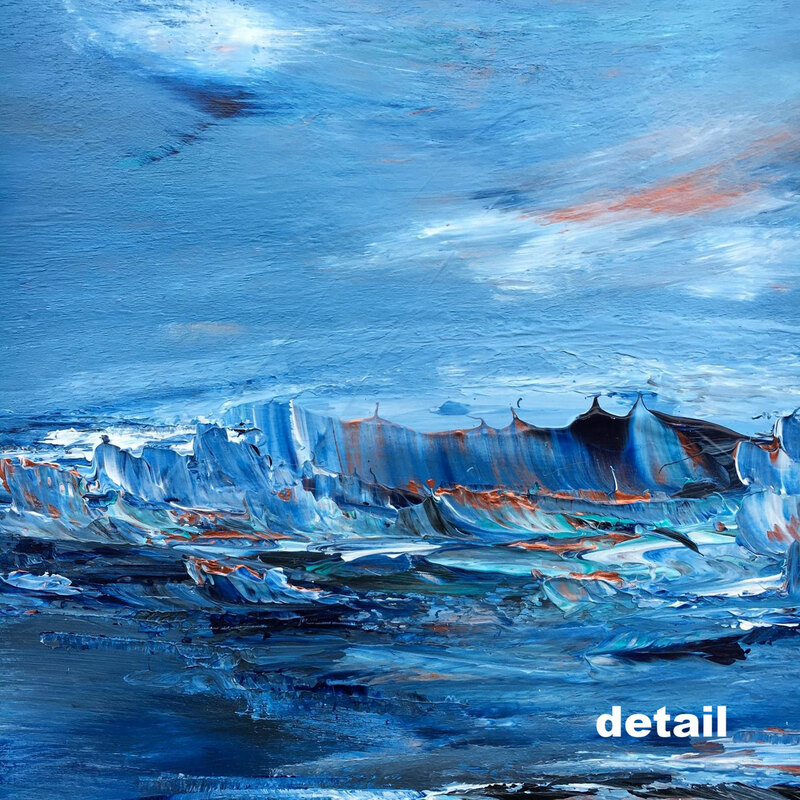 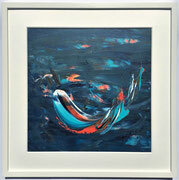 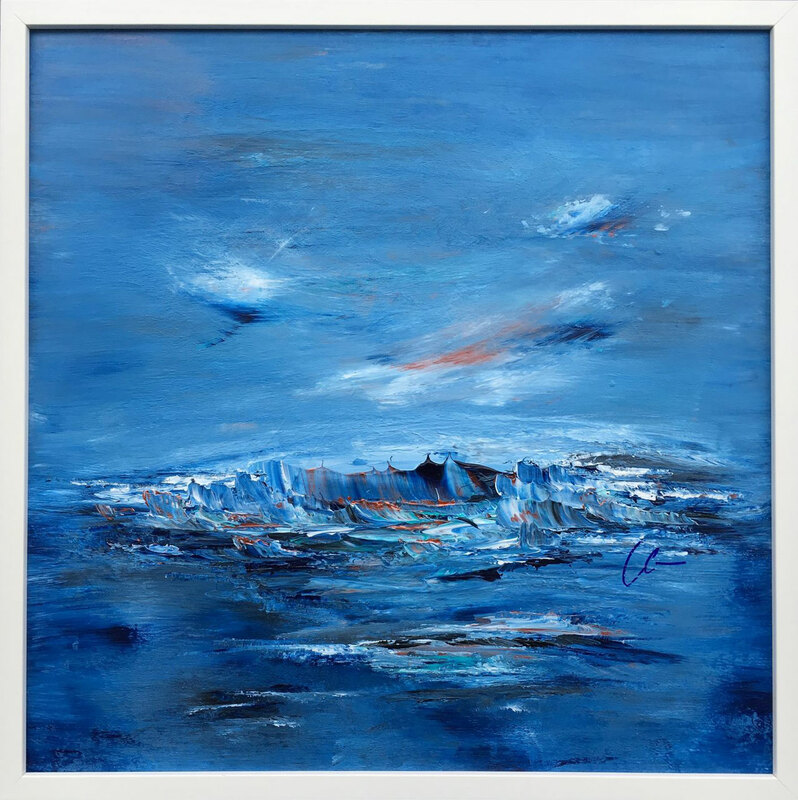 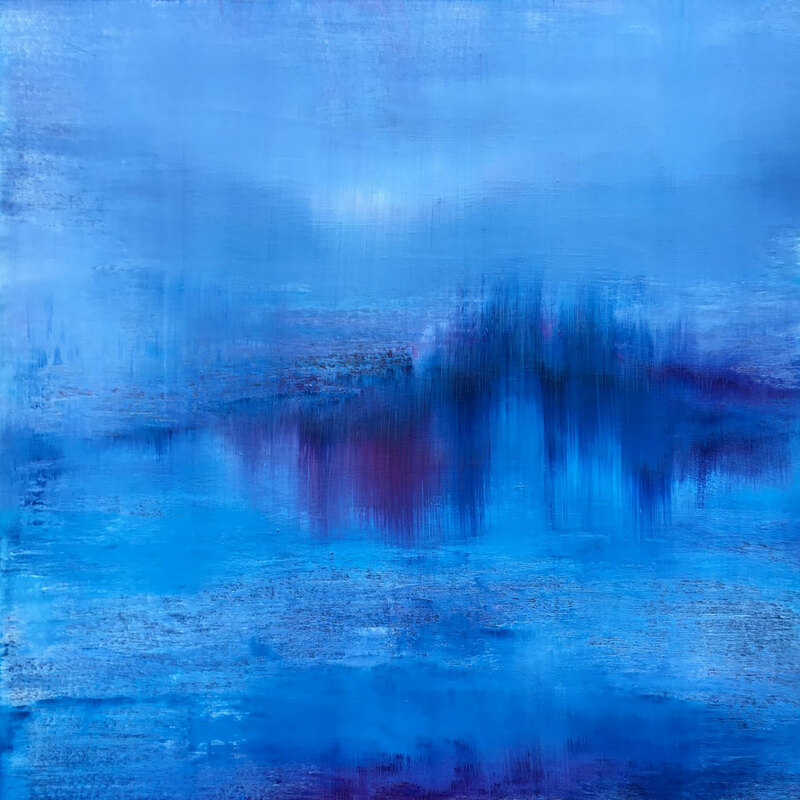 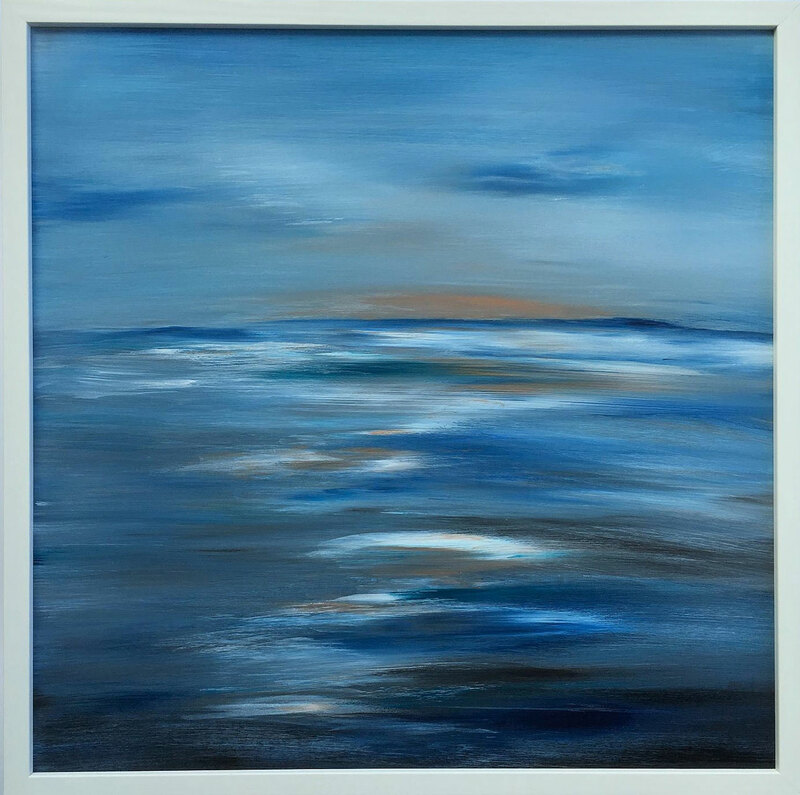 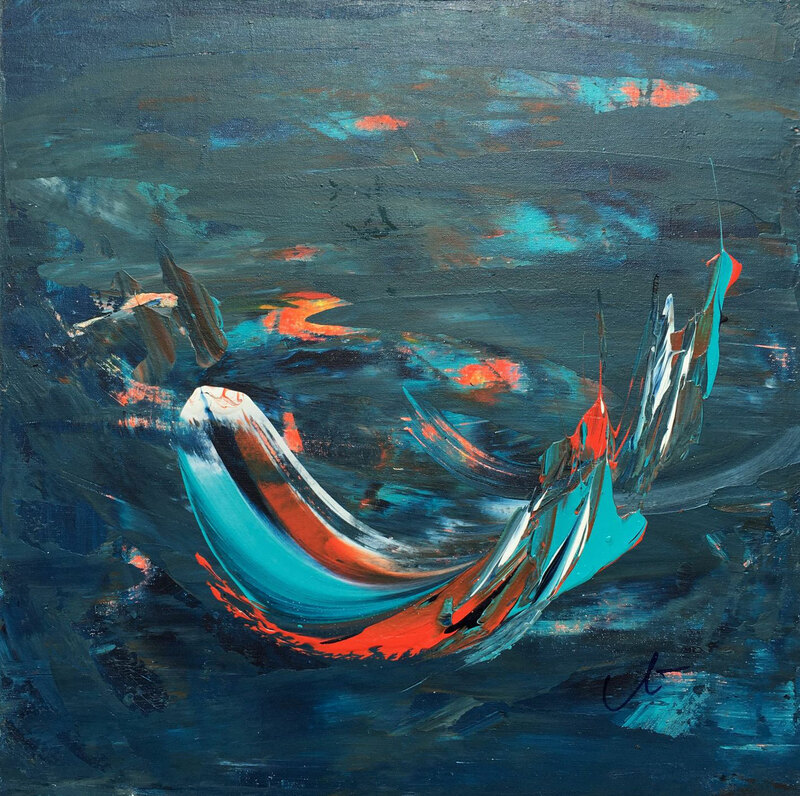 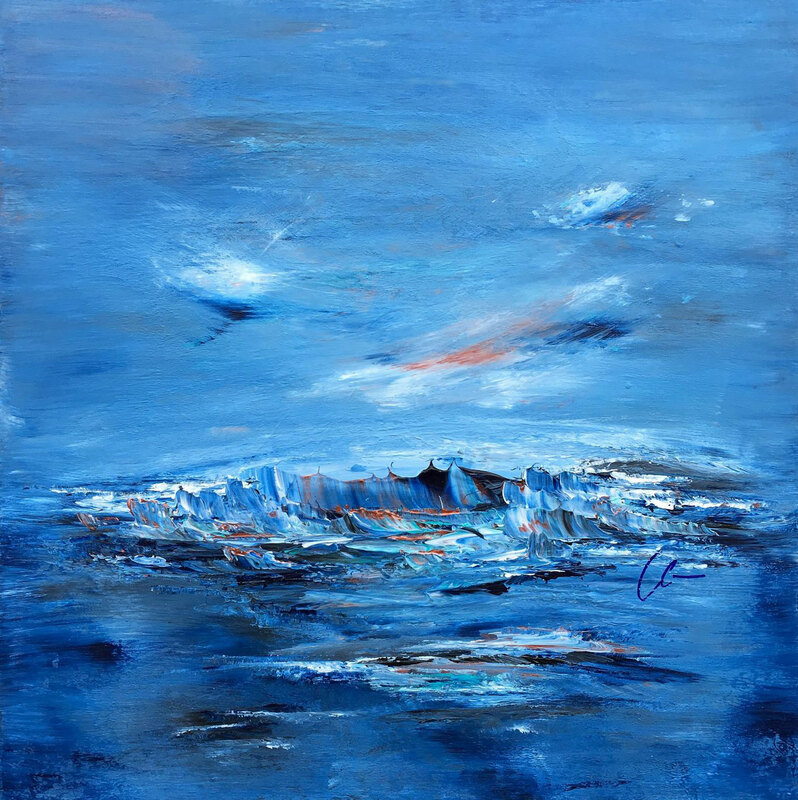 This piece has vibrant blue shades and is an attractive piece full of depth and water movement. 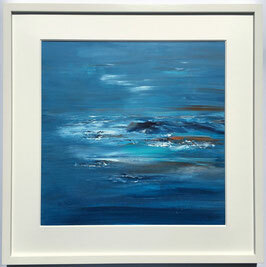 A beautiful blue gem for lovers of the Sea. Every piece of my "dreamscape" series conveys it's very unique feeling due to the colour choice and composition. This attractive piece has vibrant blue shades, it has a peaceful radiance and beautiful details. Every painting can stand alone as a single eye-catcher or can be arranged with other pieces from the series. 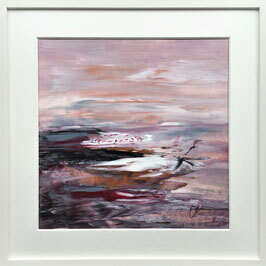 Acrylic paint on thin HDF-board - ready framed. This piece has vibrant blue shades with warm copper reflections. An attractive piece full of depth and water movement. A beautiful blue gem for lovers of the Sea. 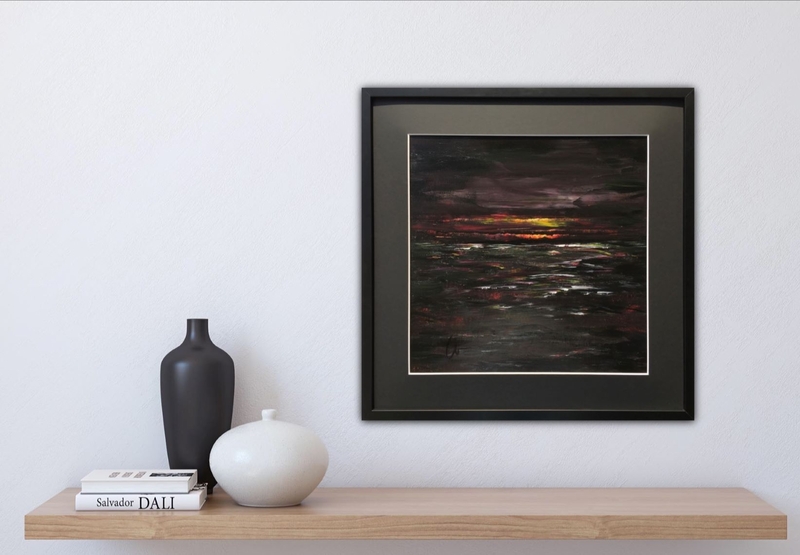 Atmospheric painting with a shiny golden horizon. 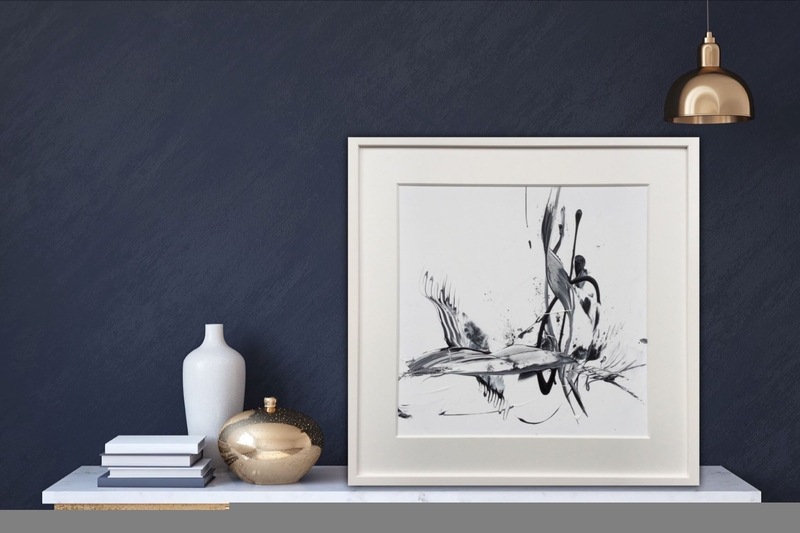 An attractive, rather minimalist piece that changes expression depending on light conditions during the day and never gets boring. 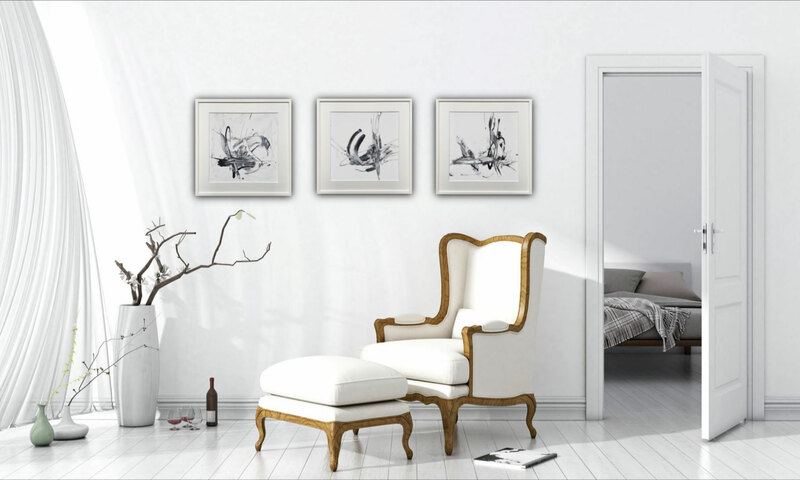 Ads a touch of exclusiveness e.g. 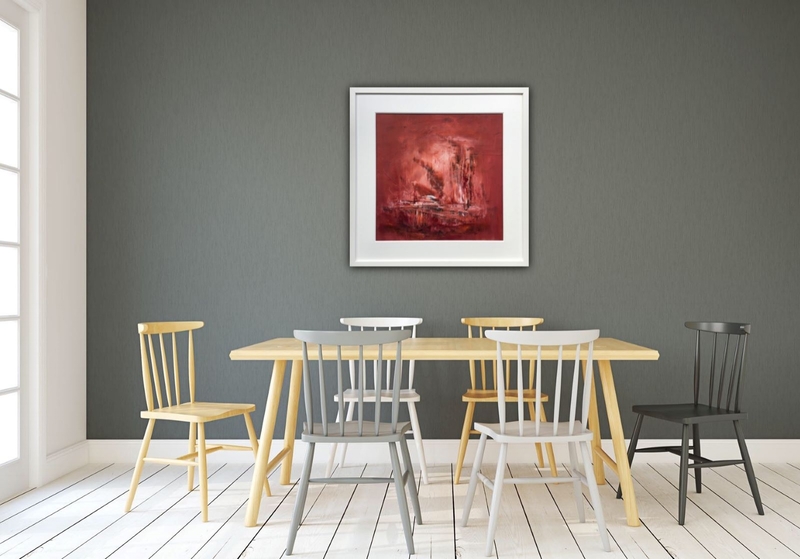 hanging over a dining table or a sideboard. 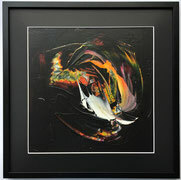 The original is in a private collection and not available at the moment. 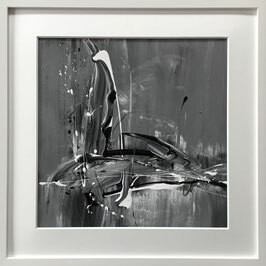 --> High quality art print on Hahnemühlepaper available size: 50x50 cm (19,7 x 19,7 inch). 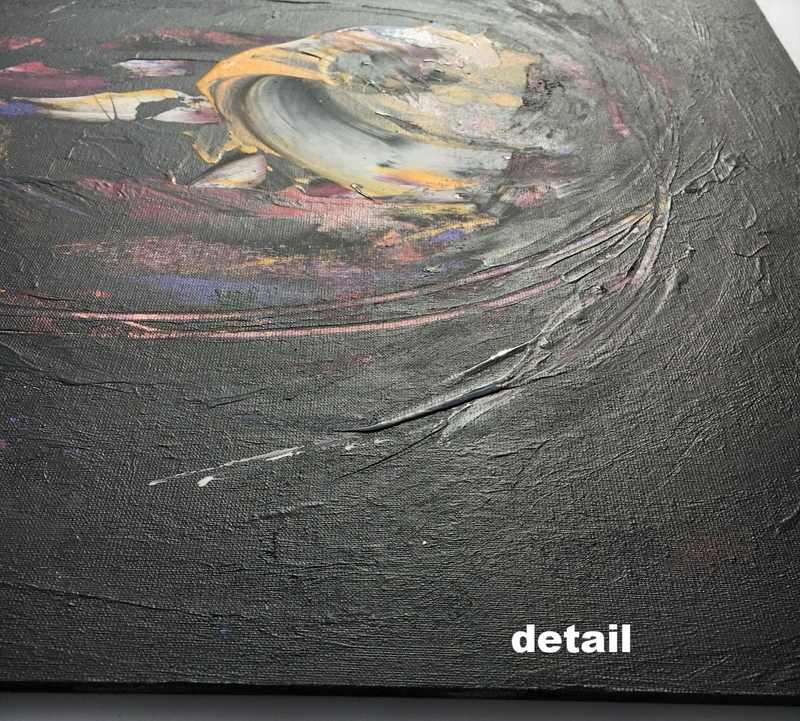 Please contact me for price if interested. 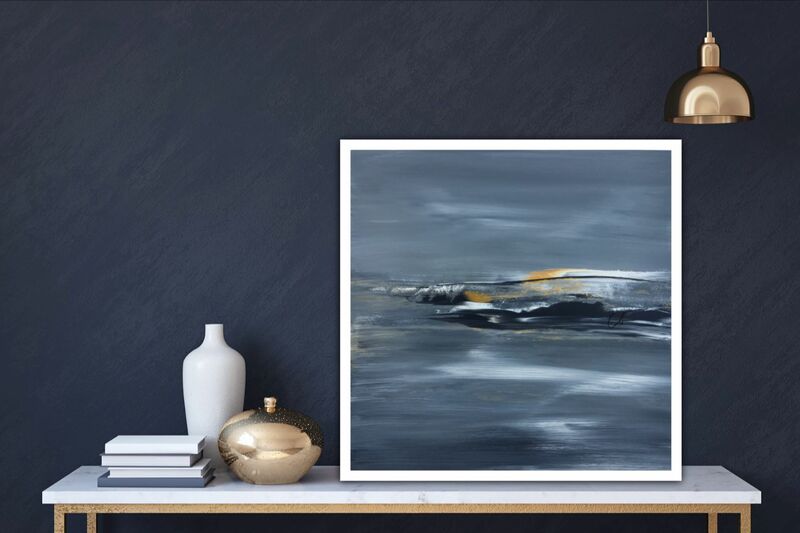 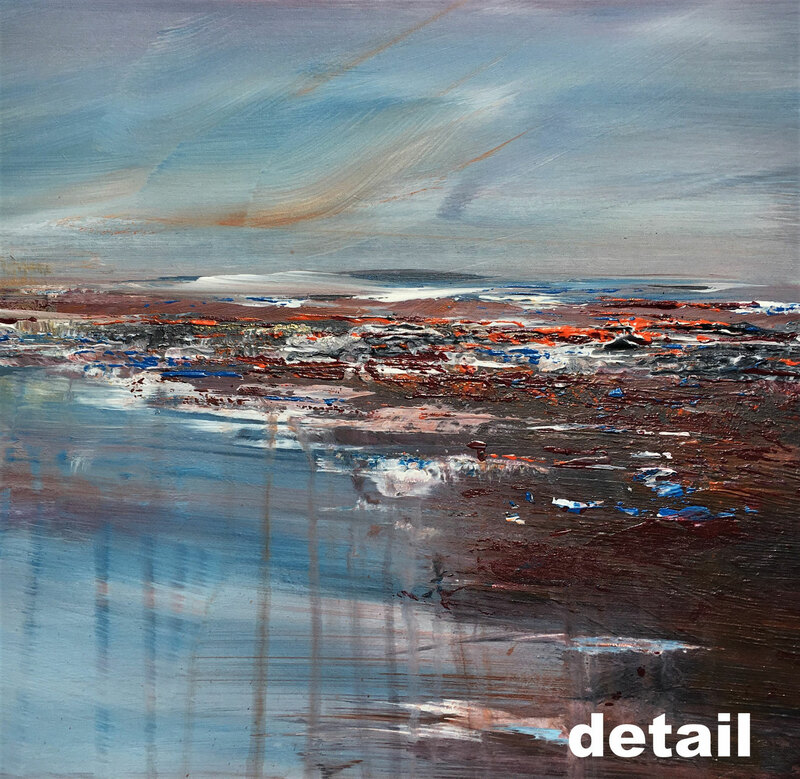 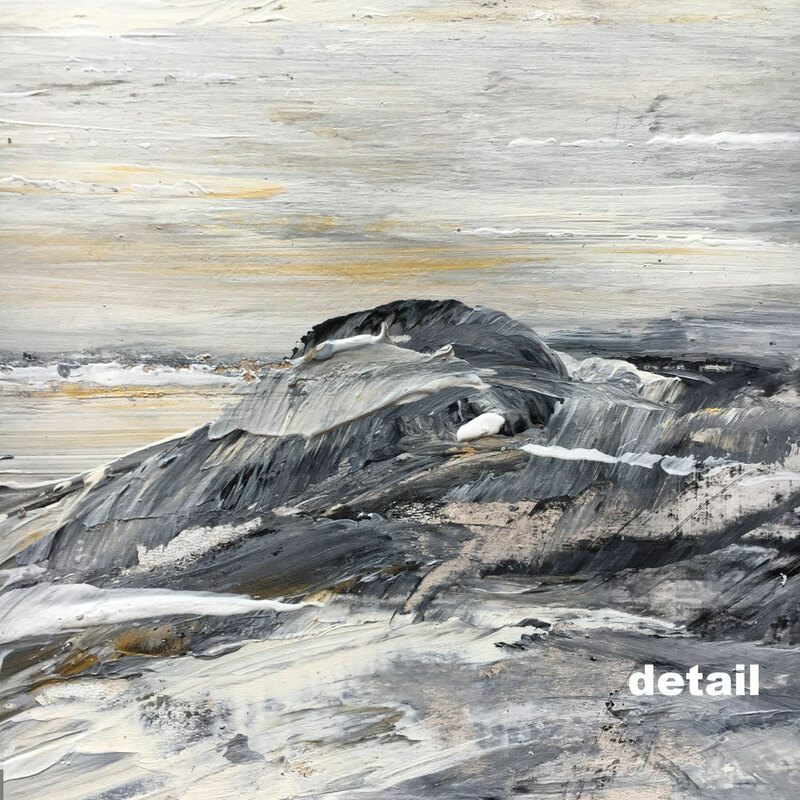 This abstract landscape with a kind of mysterious shore is an intriguing eye-catcher due to its colour shades and drippings. 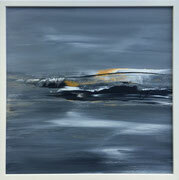 Great depth and beautiful combination of warm and cold colours ensure a longlasting spell. 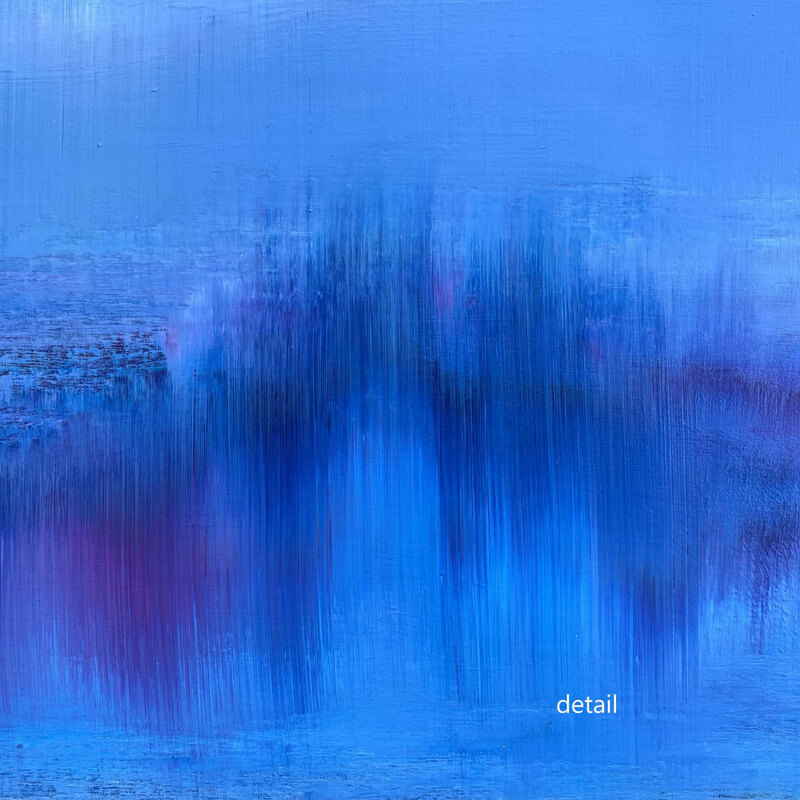 Painting this I was asking myself: "how deep can love really be?" 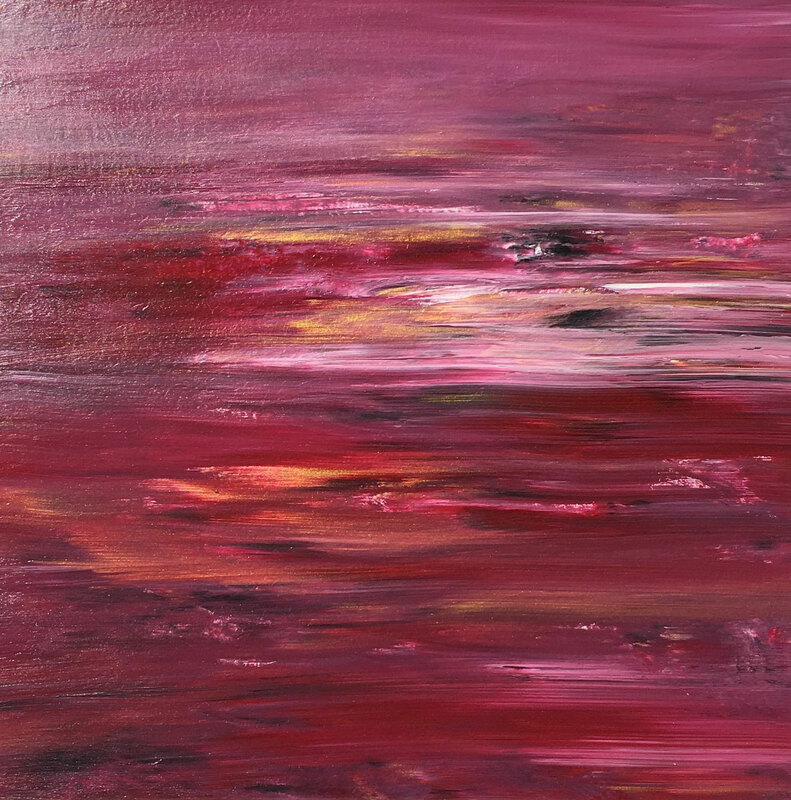 So here is my interpretation of this wonderful feeling of deep and intense love. 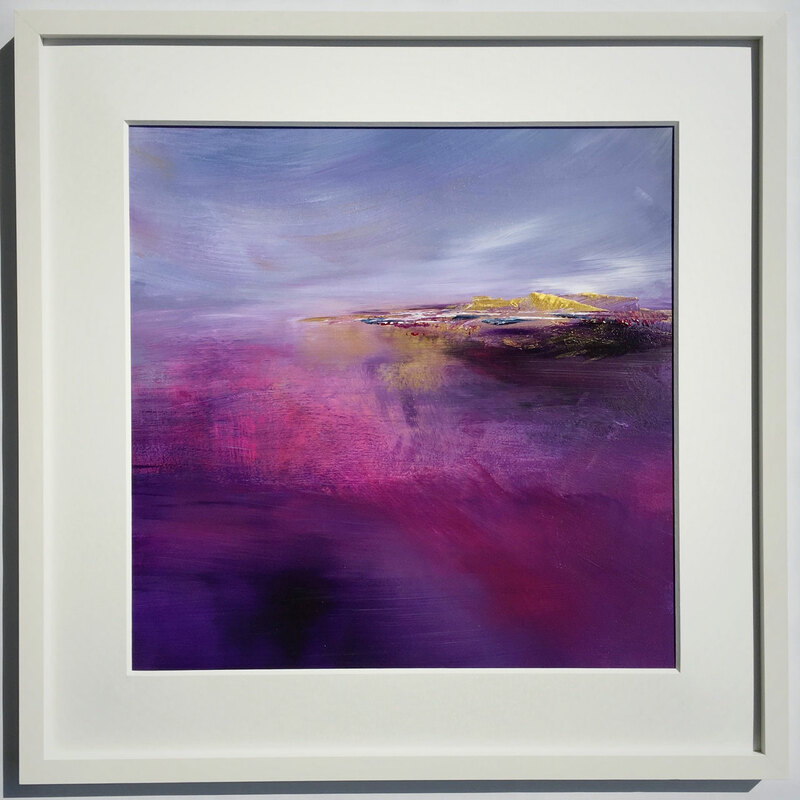 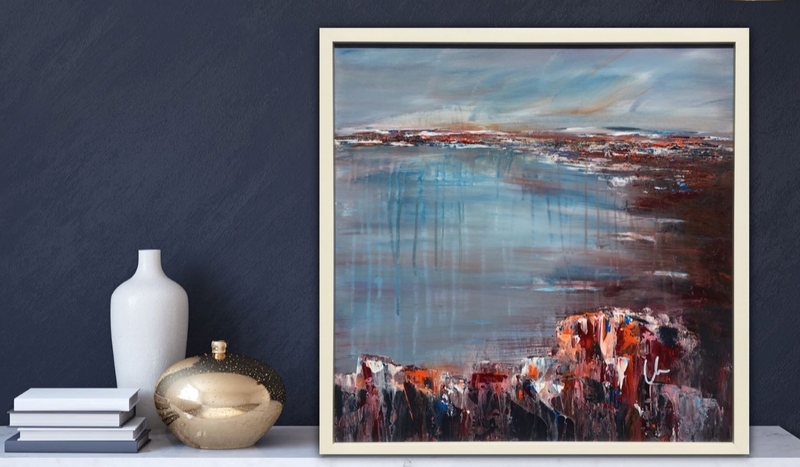 This abstract painting stands out due to its powerful colours and the feeling of depth within. 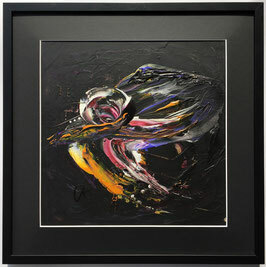 An attractive contemporary piece of art with a great significance. 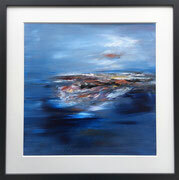 This original comes in black frame (aluminium) with white mat - ready to hang. 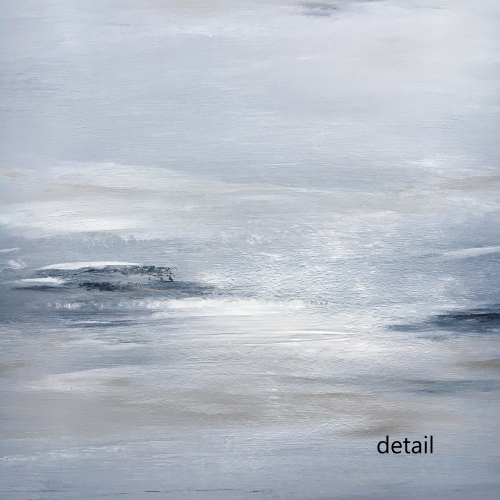 While painting sometimes I chose a feeling, I'd like to work with. 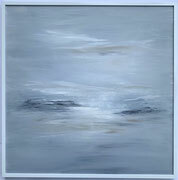 So with this artwork I wanted to express the 'lightness of being'. 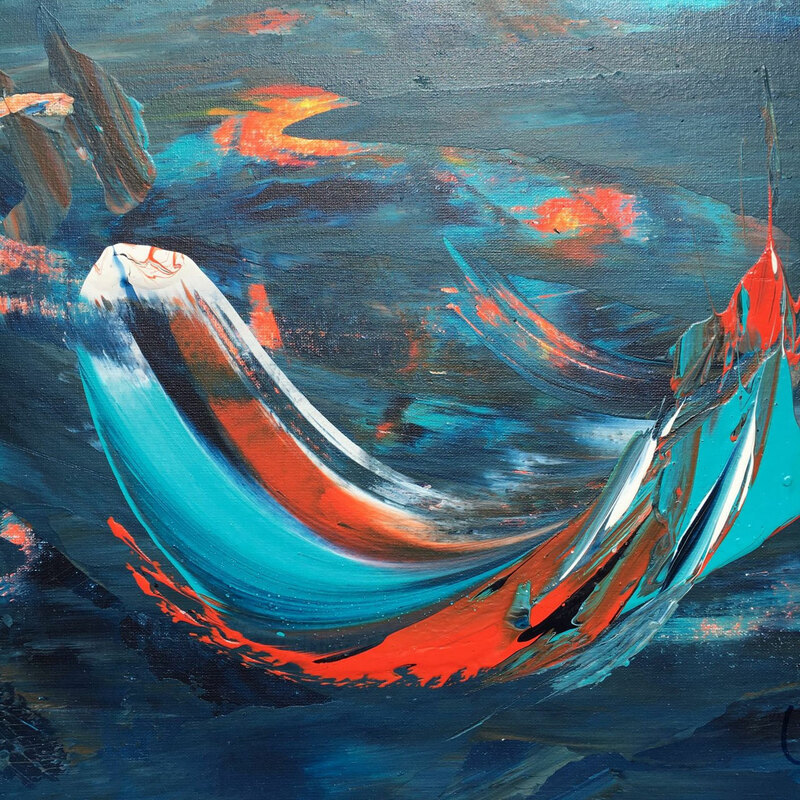 Sometimes we forget the delight and ease of being in daily life challenges. 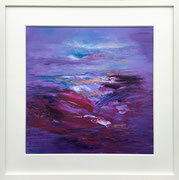 So here is a colourful and joyful reminder to take things easy. 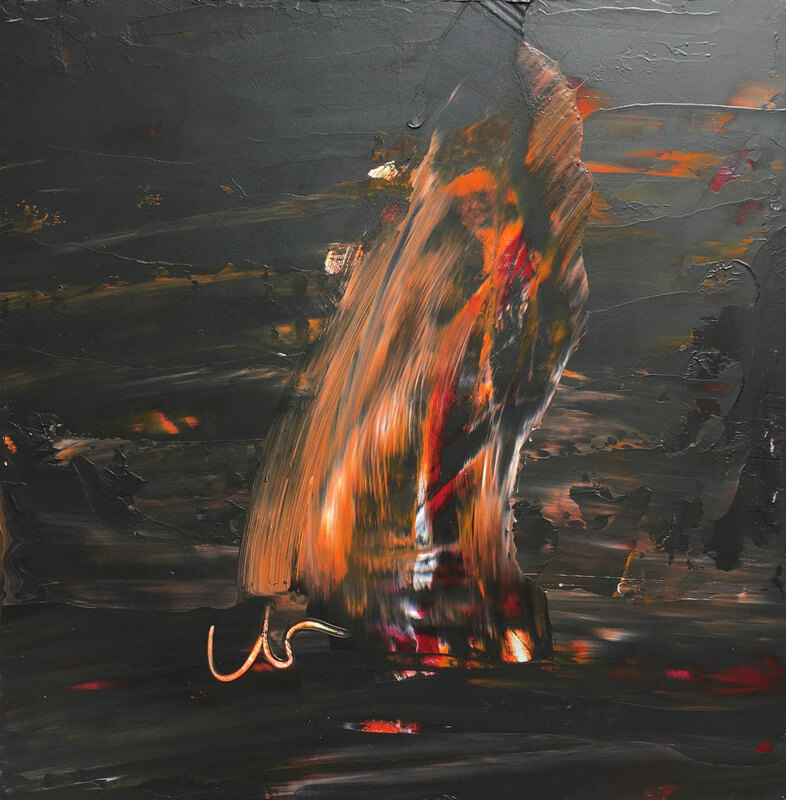 The title already says it all: this painting emanates heat. 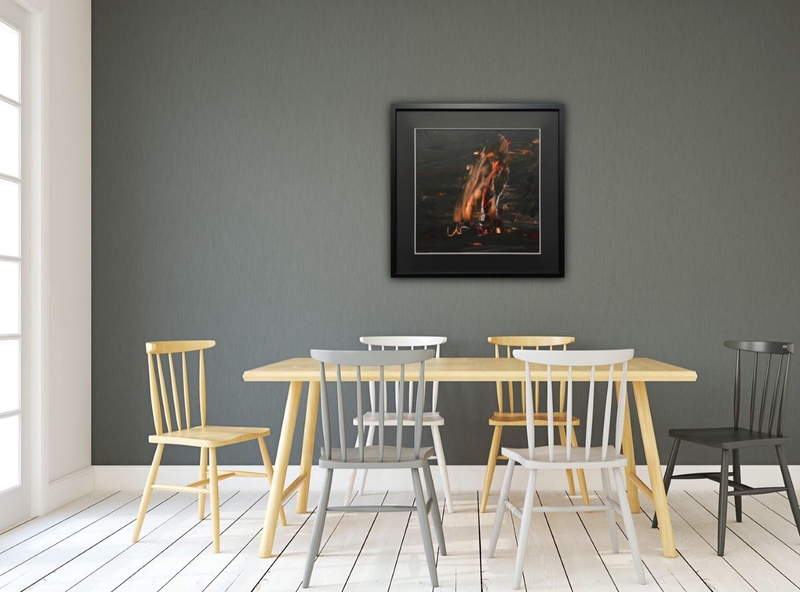 But it's a beneficial warming heat. 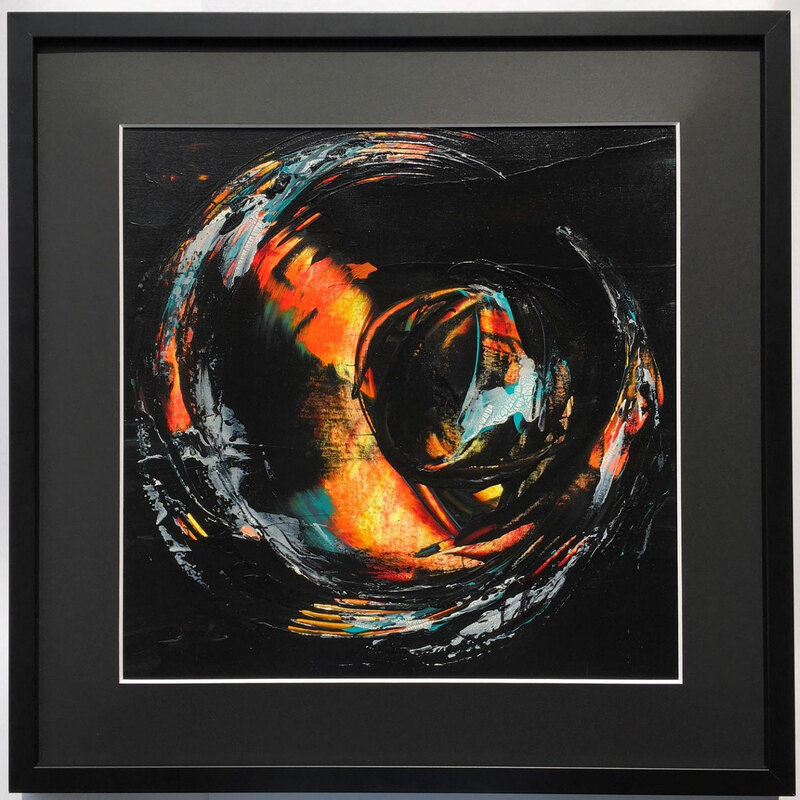 An eye-catching piece, that brings dynamic and powerful energy in a room. 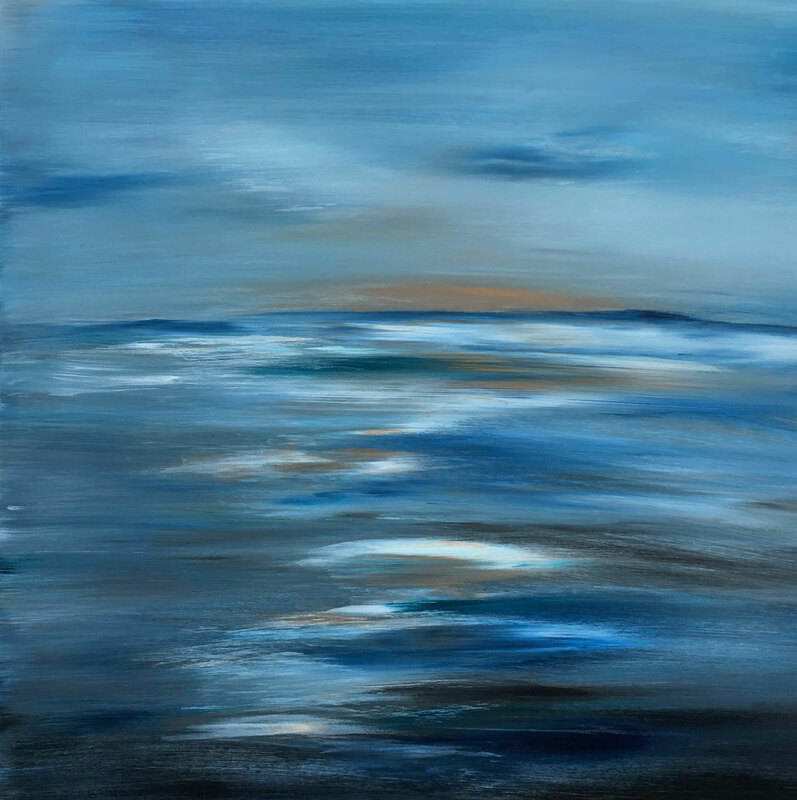 I'm fascinated by sun rise and the special light, that seems to transform the surroundings and gives every new day a kind of reset. 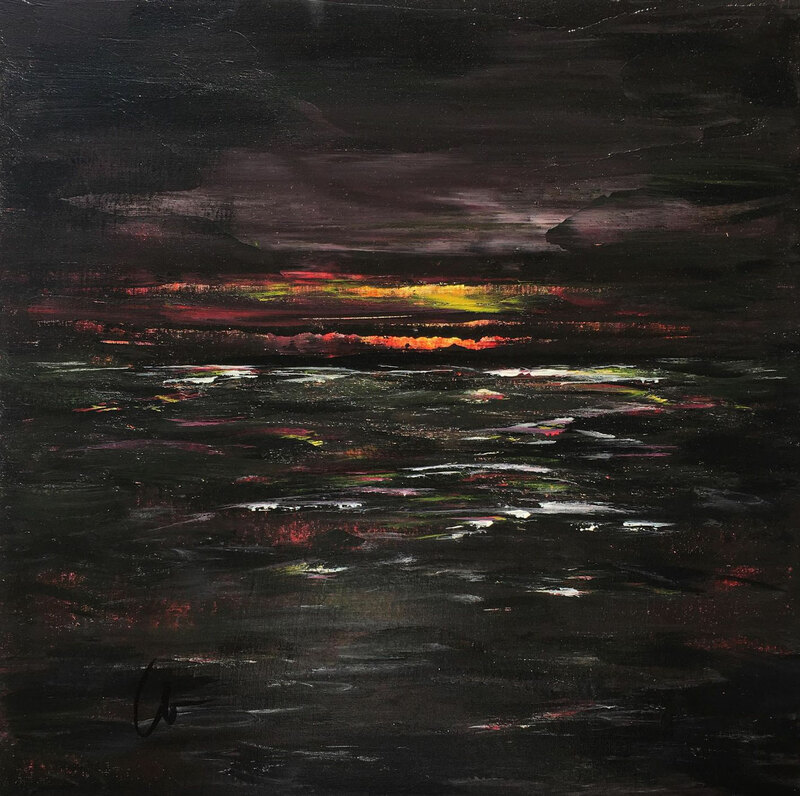 So with this piece I wanted to express the feelings I have watching a sun rise. 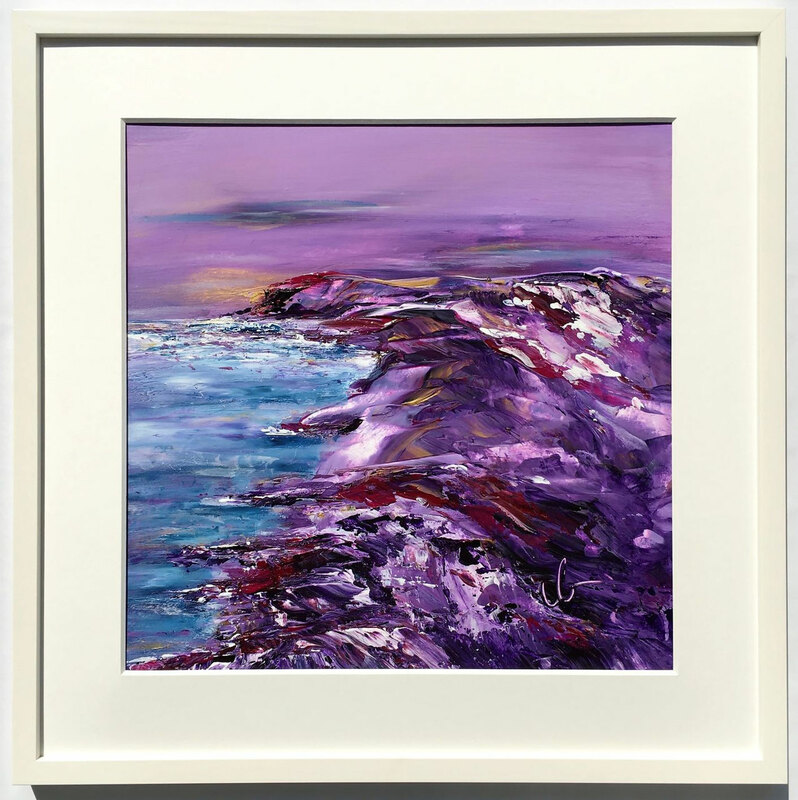 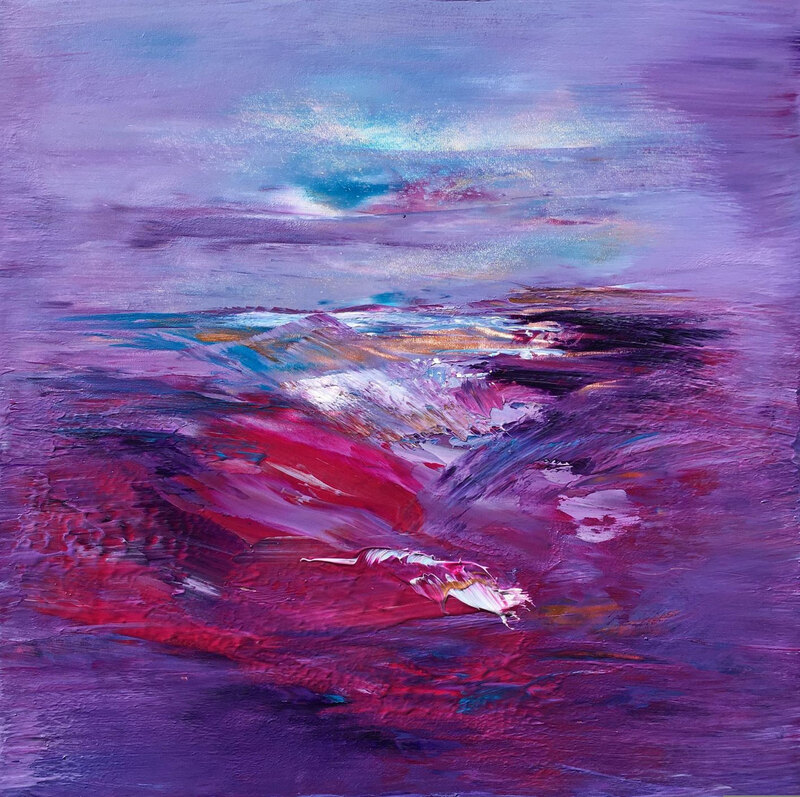 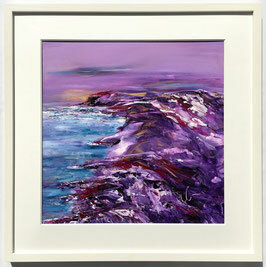 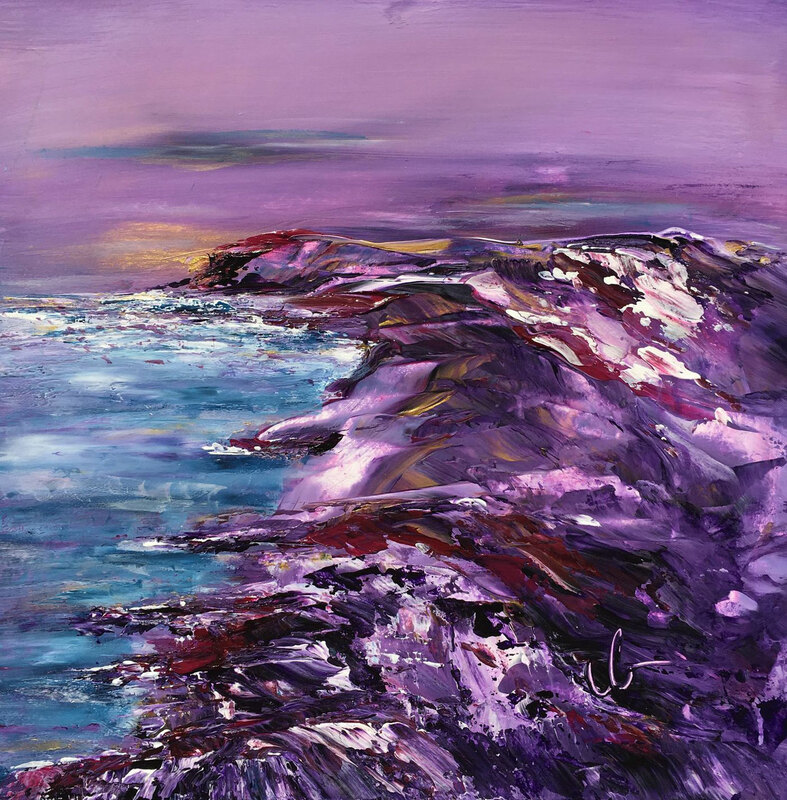 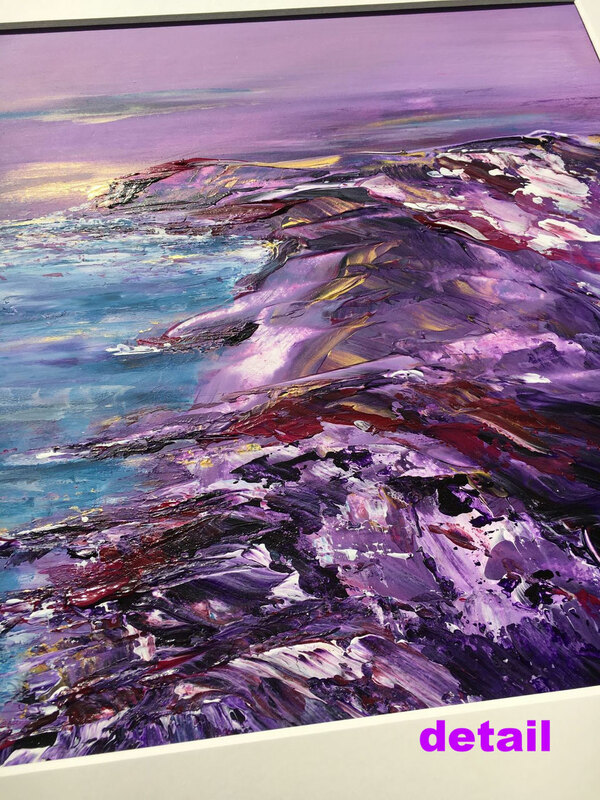 Shades of purple, mixed with gold, white and blue form a kind of magical coast with a great depth. 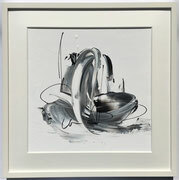 A meaningful painting with long lasting spell. 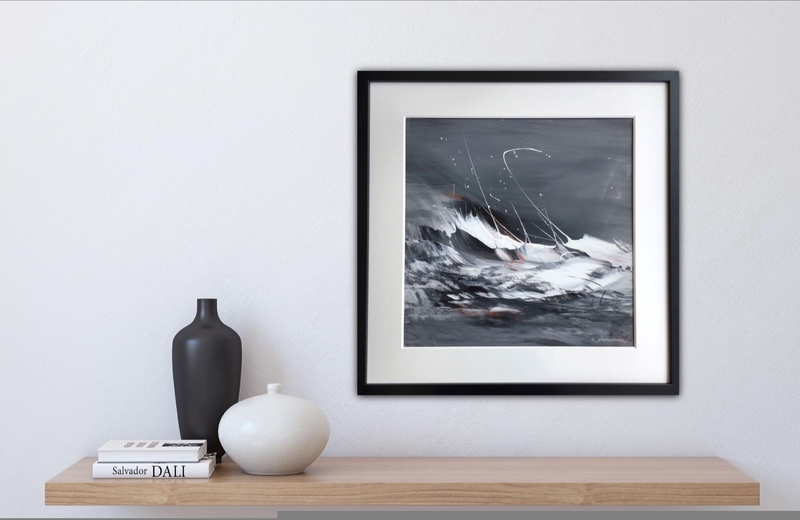 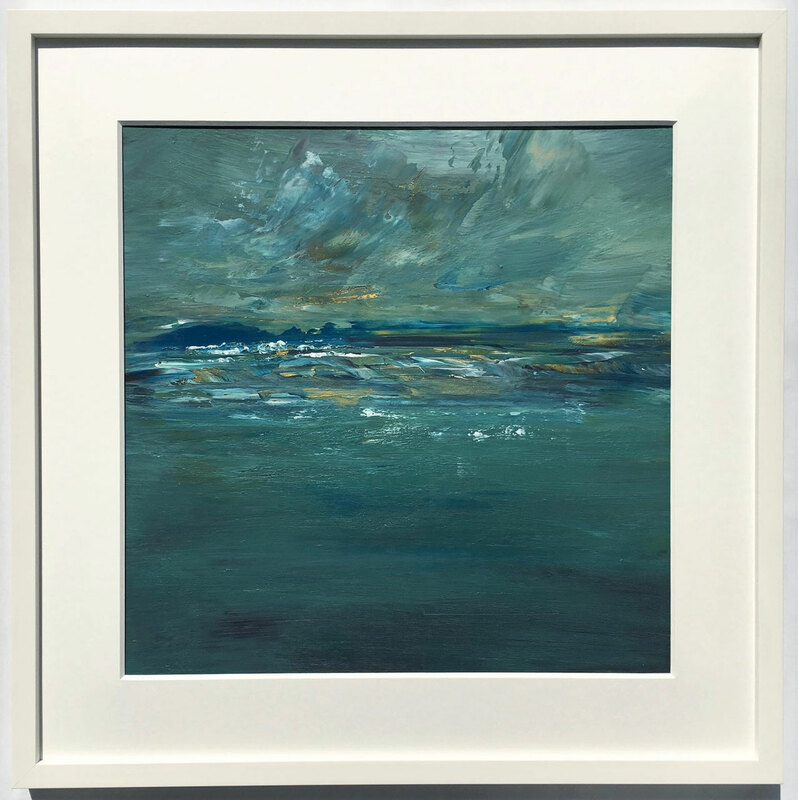 I love the power of the Sea and with this piece I wanted to express this exciting feeling I have seeing and feeling a stormy Sea. 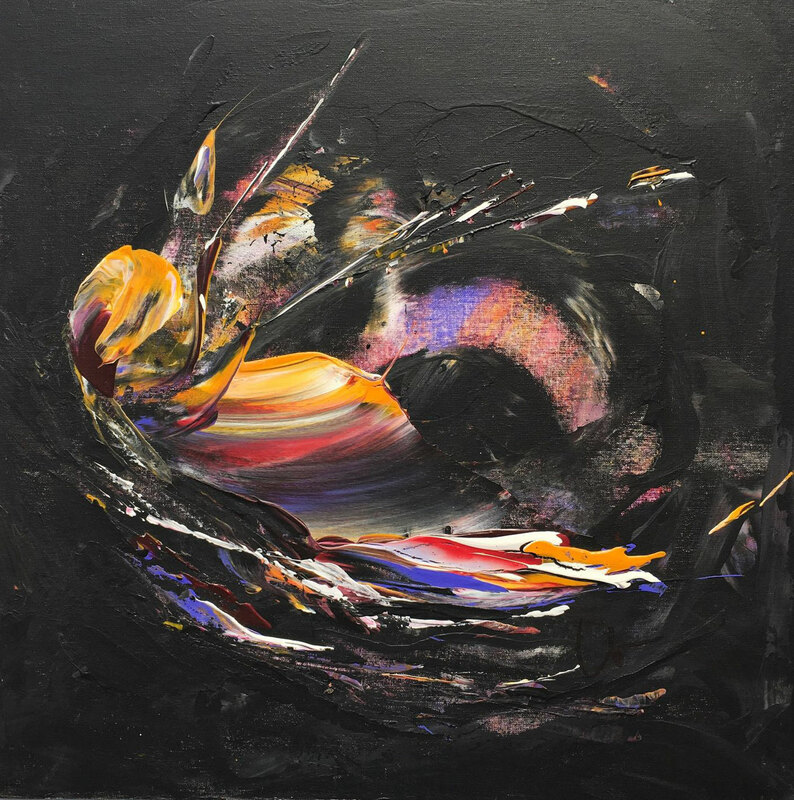 A painting full of movement and suspense. The reduced colours palette makes this piece a long lasting eye-candy. I love to use black colour in my paintings to create contrasts. In this piece I wanted to express just the essence of this colour. 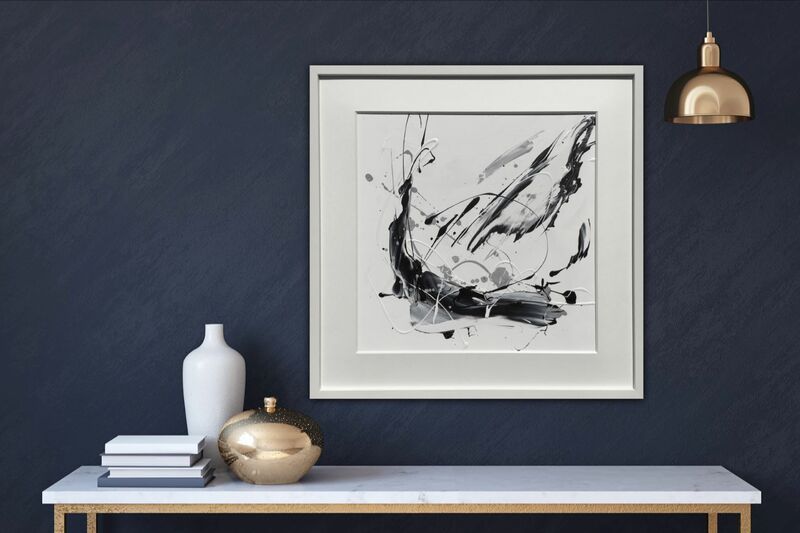 A reduced and compelling piece in every contemporary surrounding. 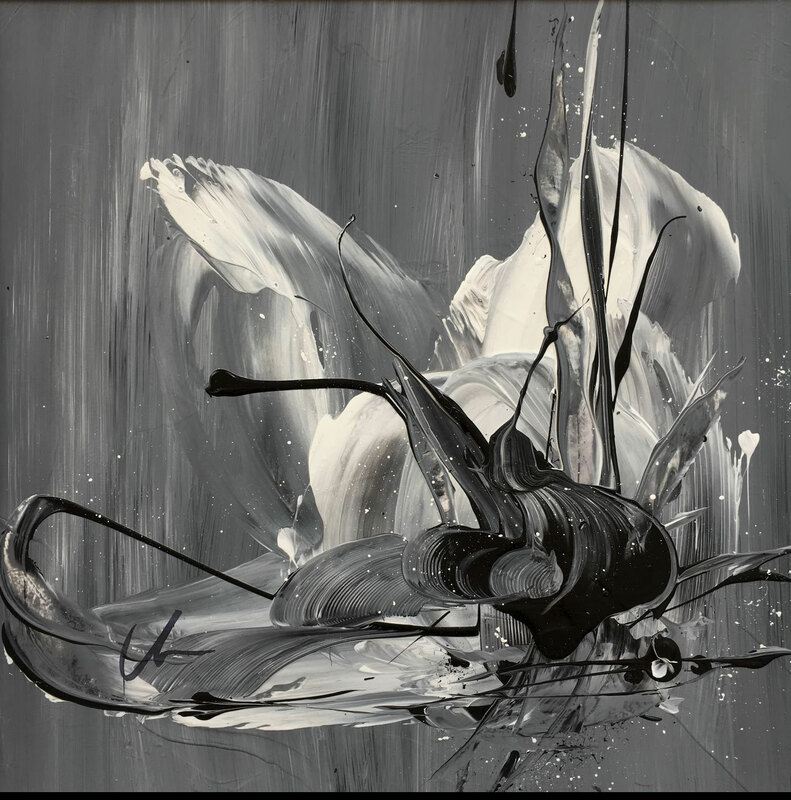 The ultimate contrast of tone - black against white - is always an exciting field to work with. 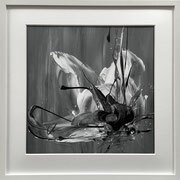 In this black and white series "essence no. 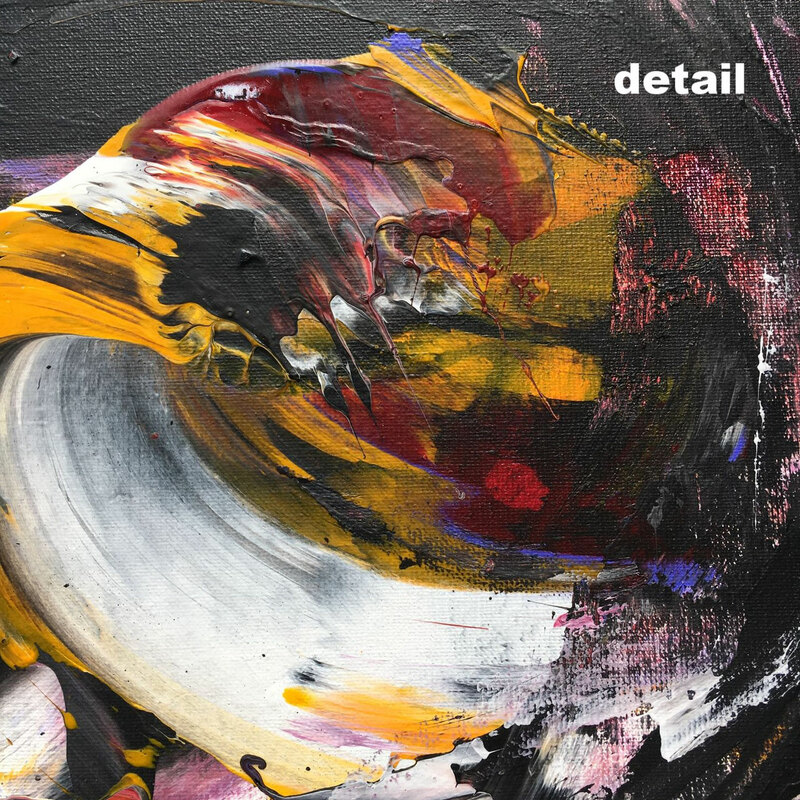 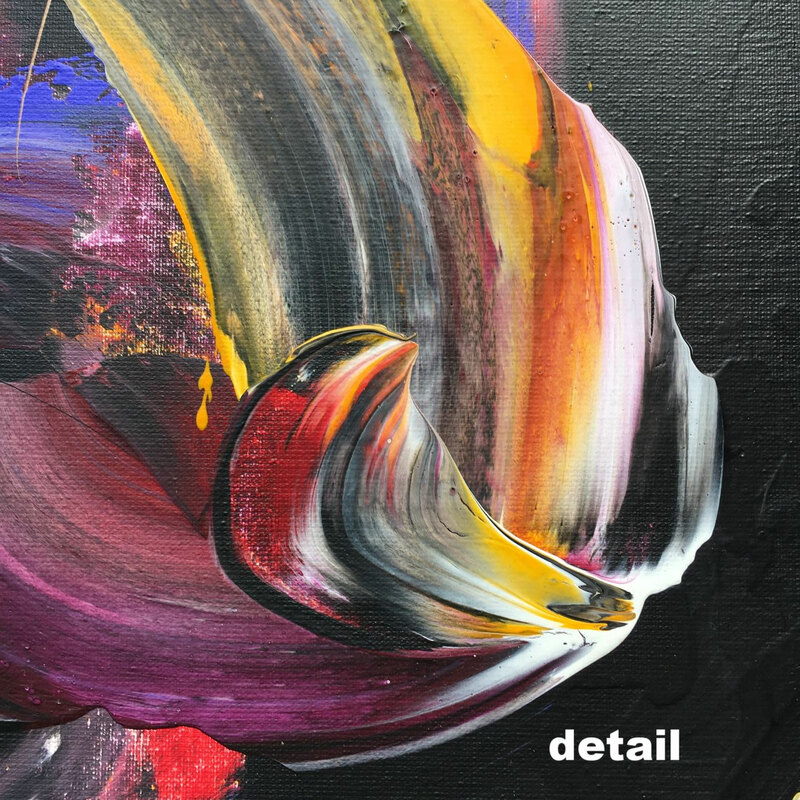 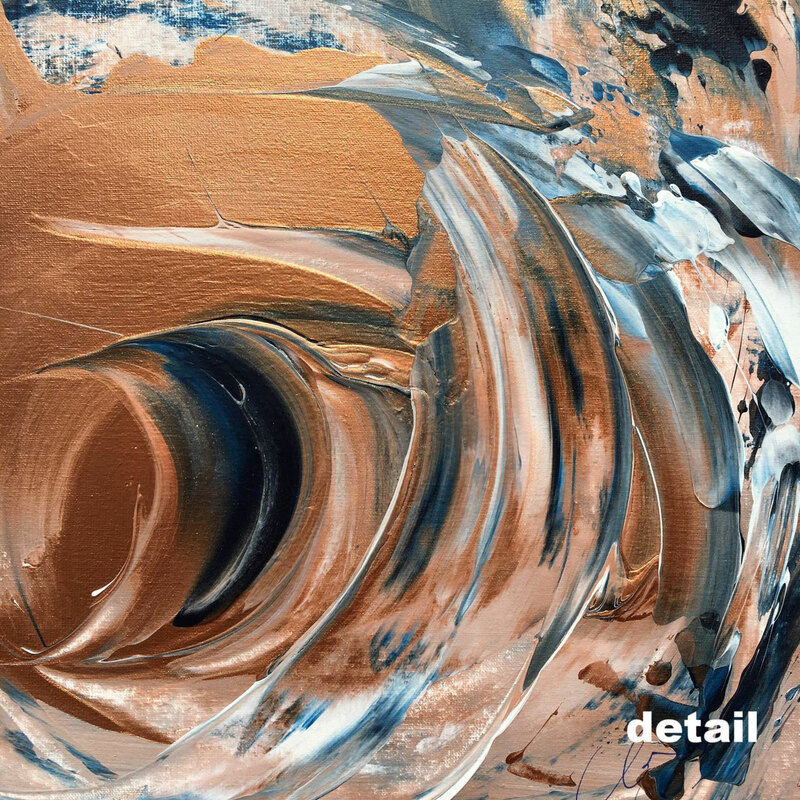 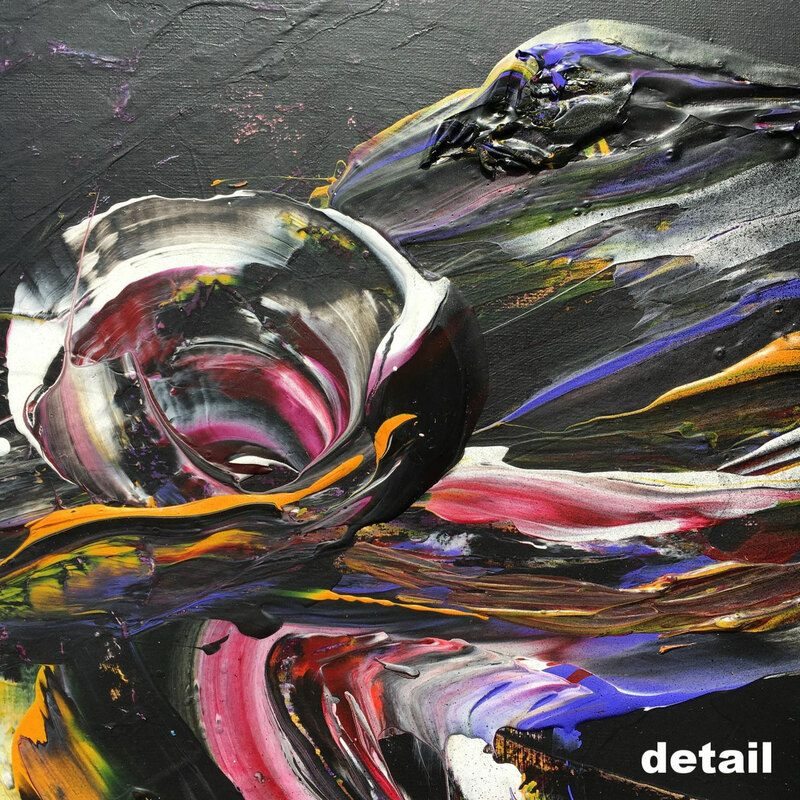 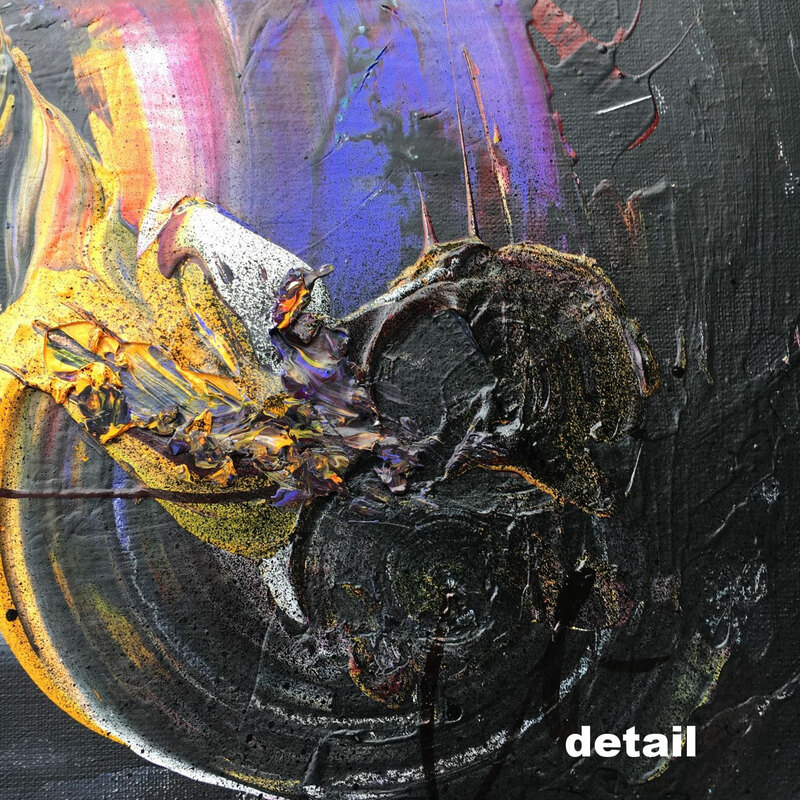 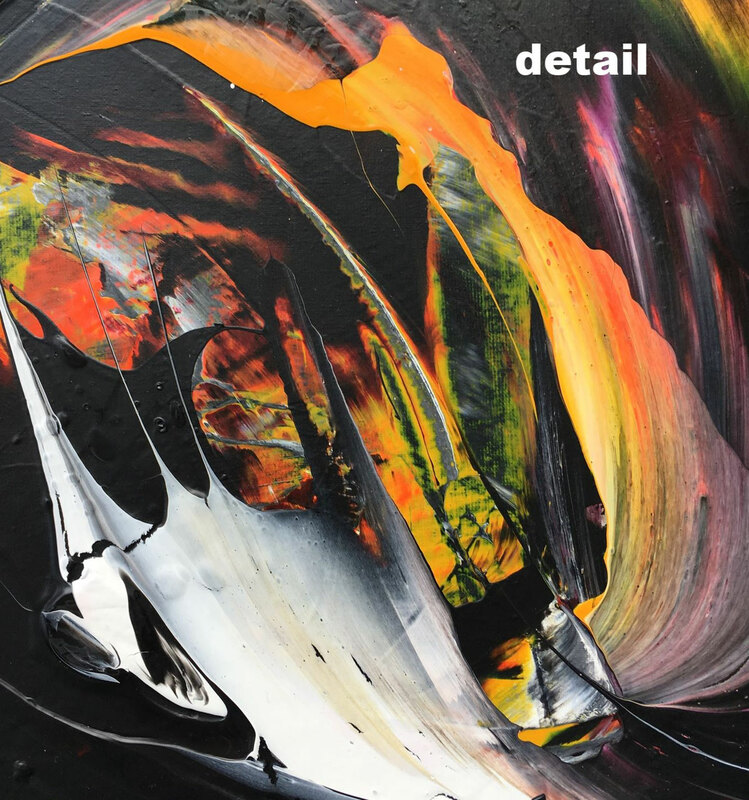 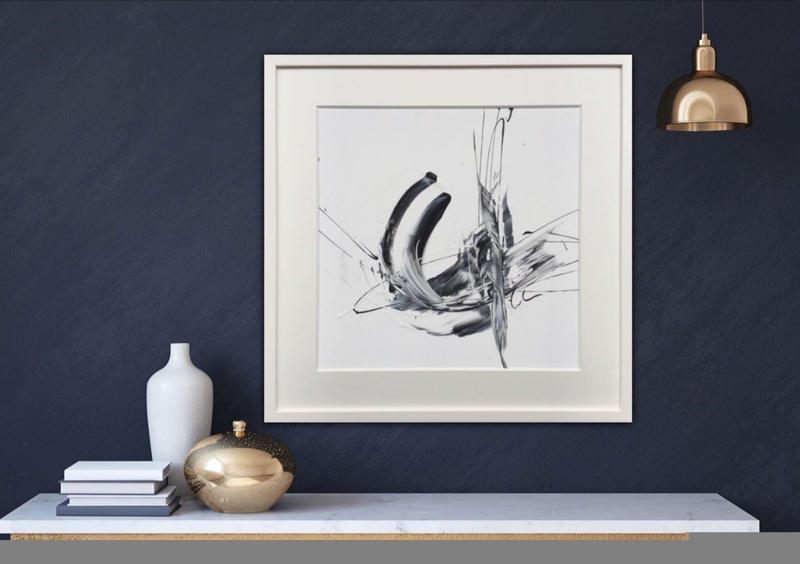 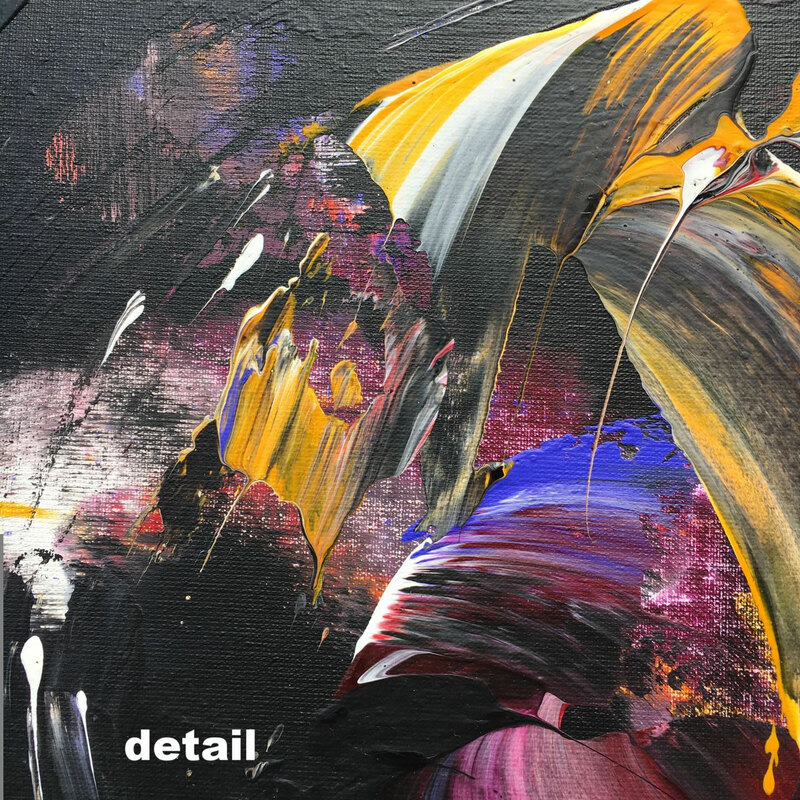 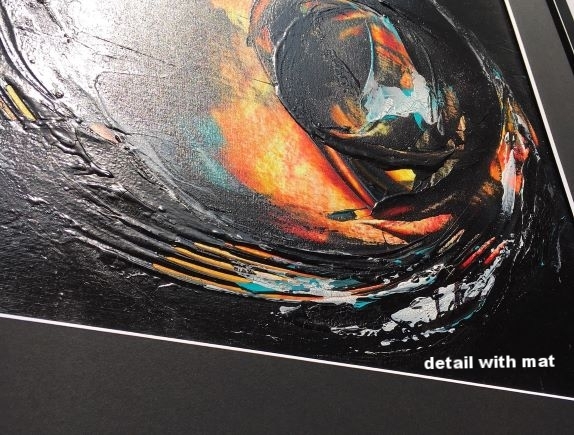 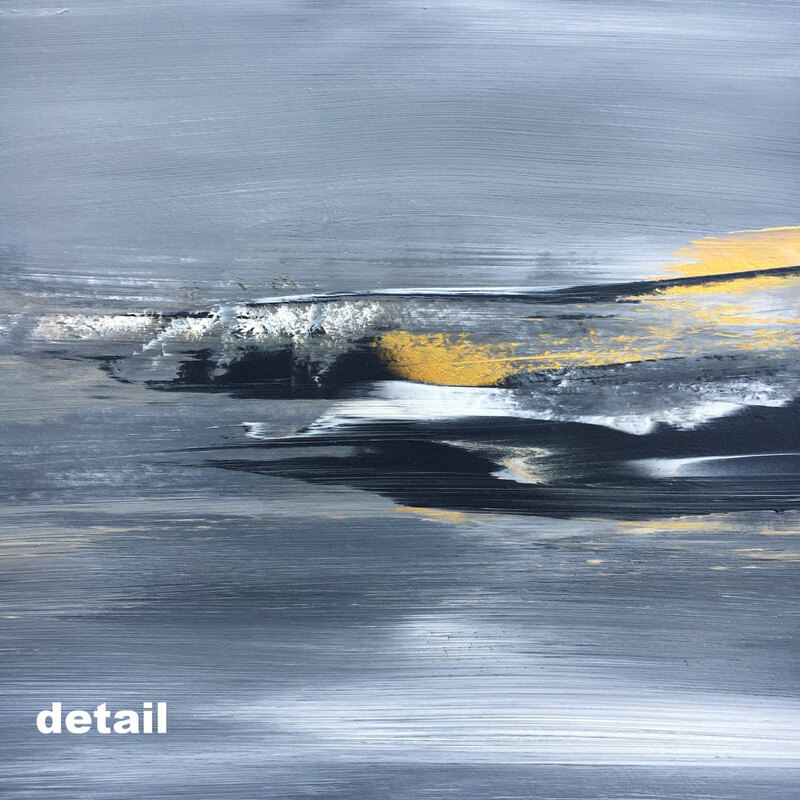 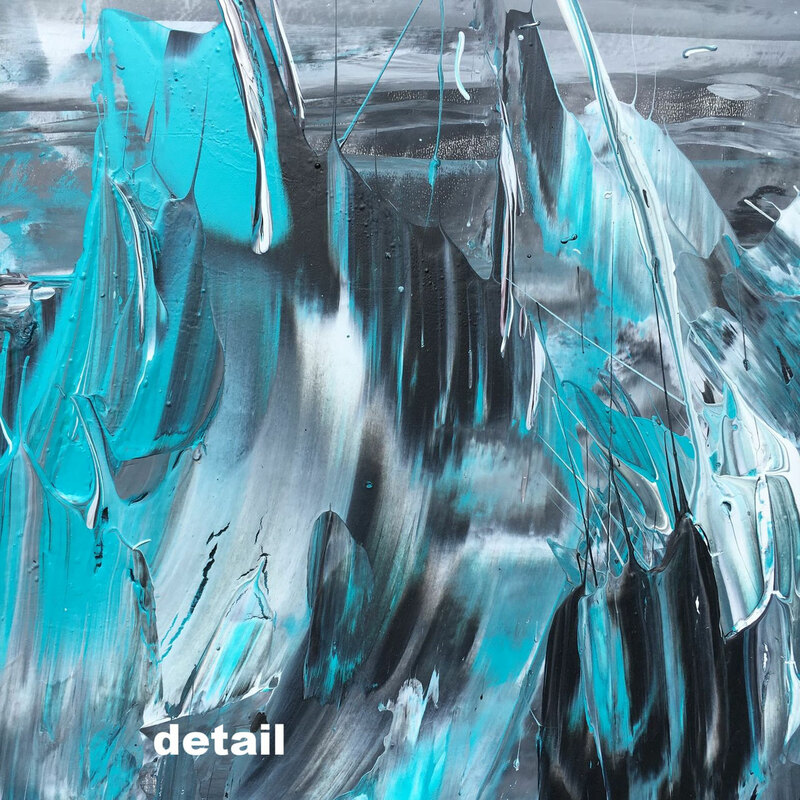 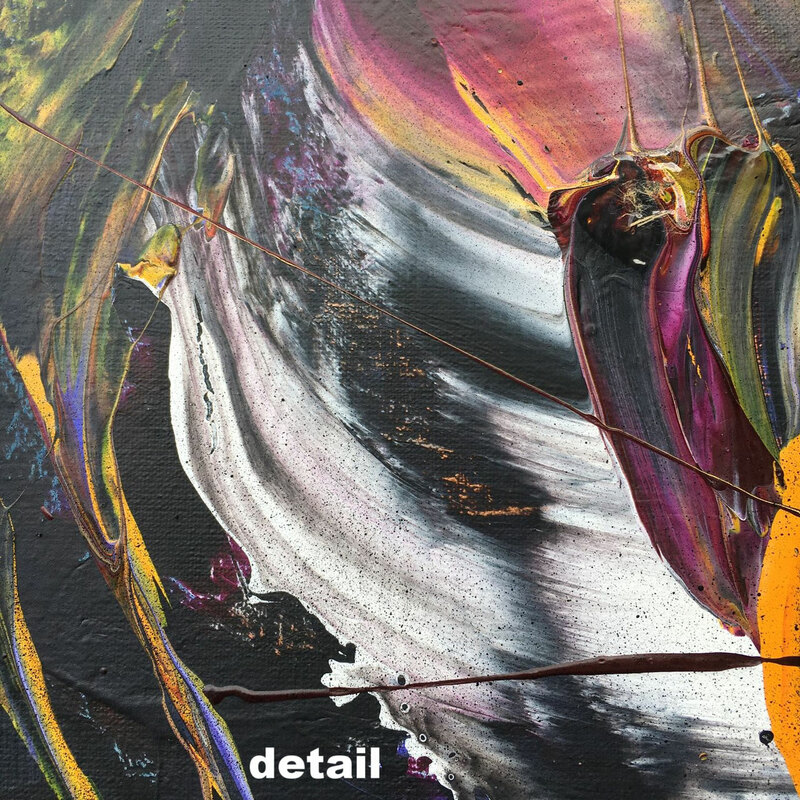 1 - 3" I wanted to create contemporary pieces, that are full of movement and details, but are reduced to its essence of colours which guarantees a timelessly beautiful expression. 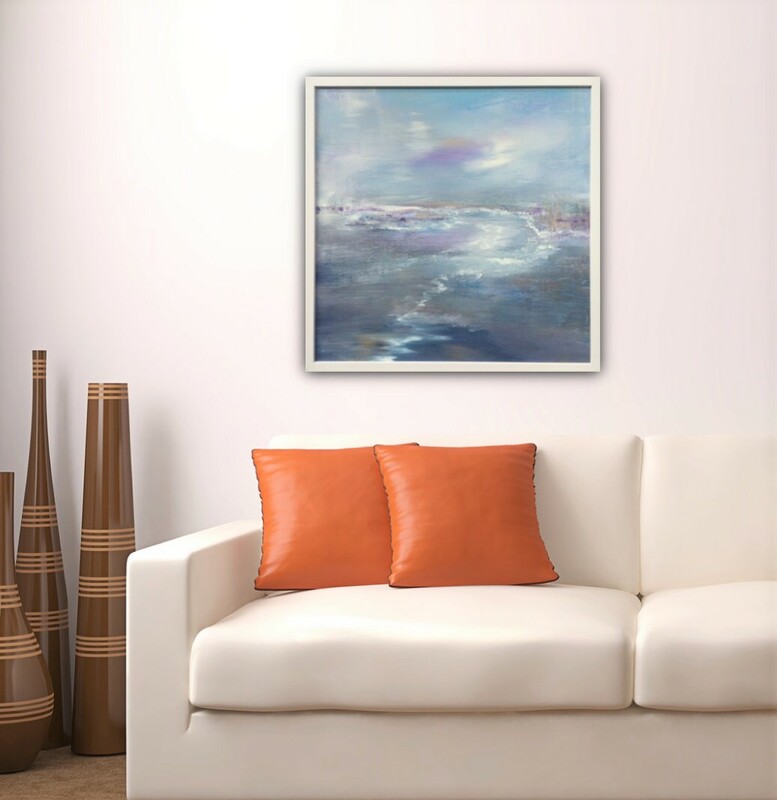 Every painting can stand alone or can be hung with the other pieces, as diptych or triptych. 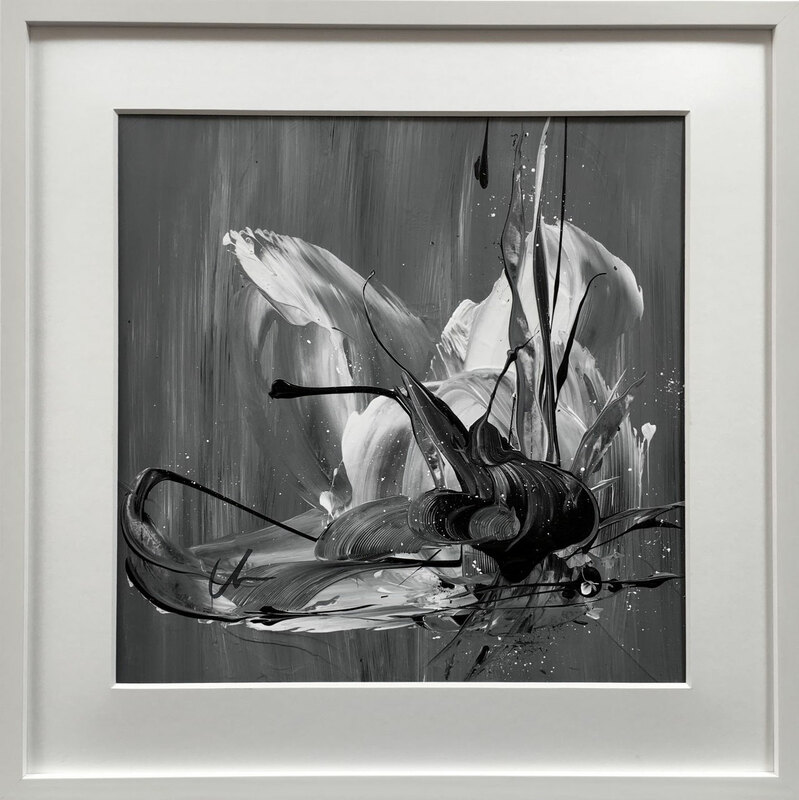 In this black and white series "essence no. 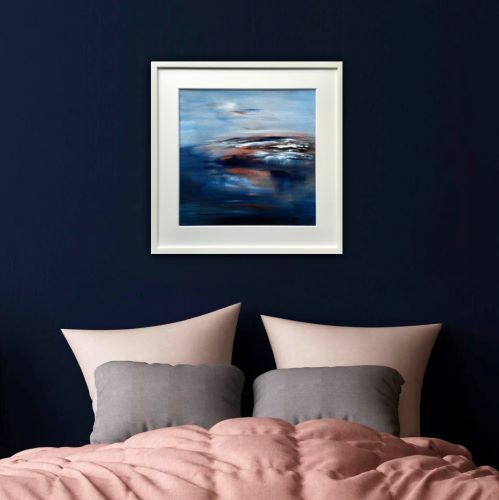 1 - 3" I wanted to create contemporary pieces, that are full of movement and details, but are reduced to its essence of colours which guarantees a timelessly beautiful expression. 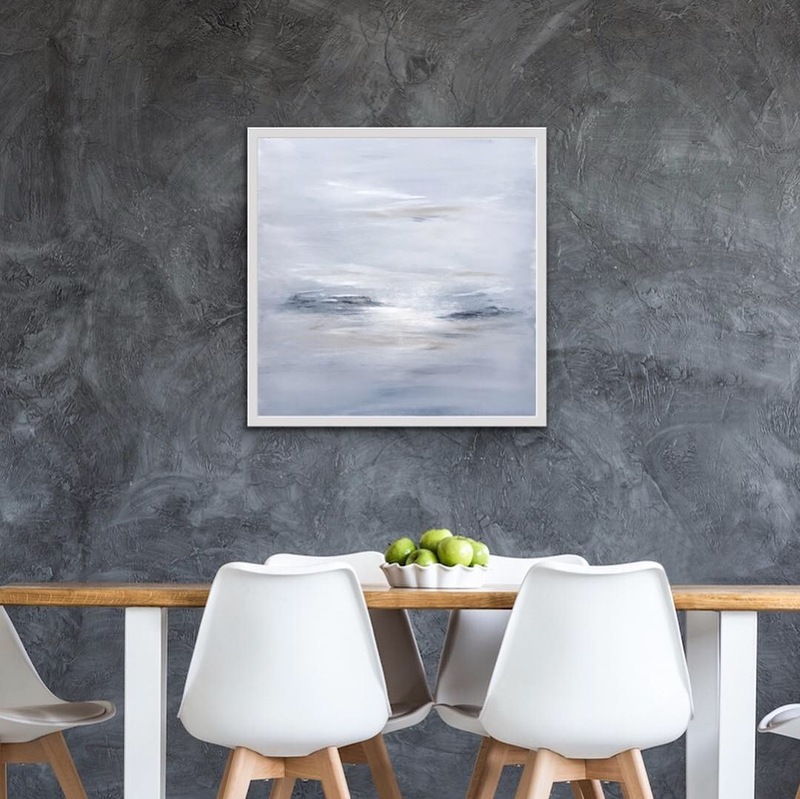 Every painting can stand alone or can be hung with the other pieces, as diptych or triptych. 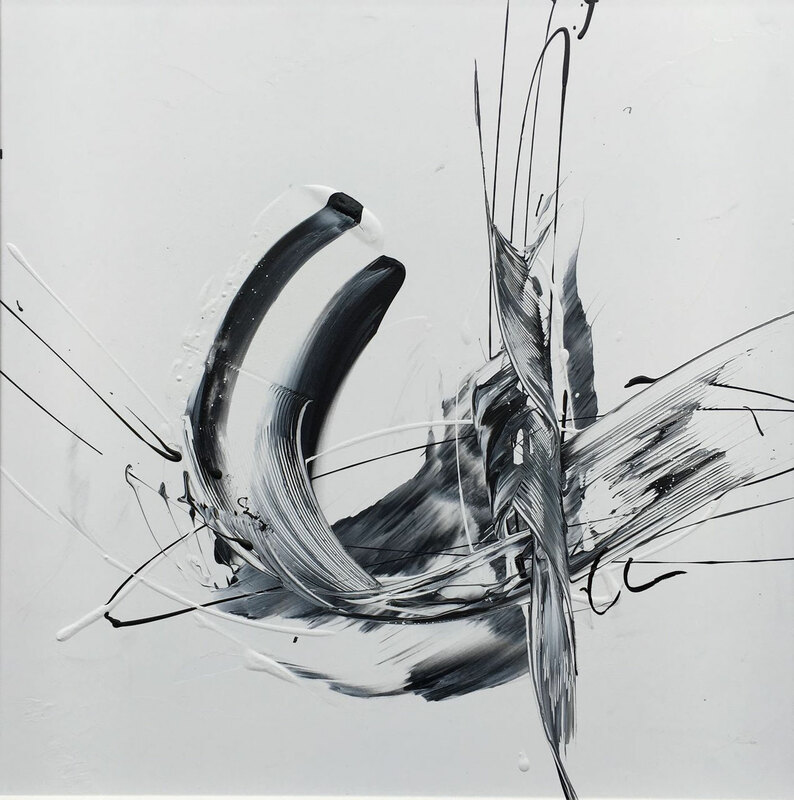 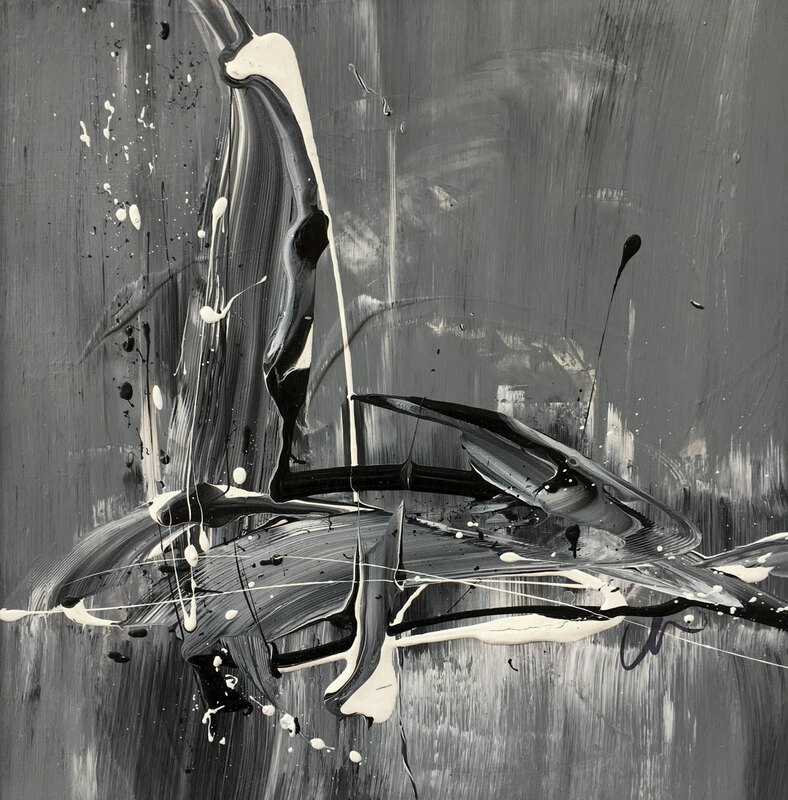 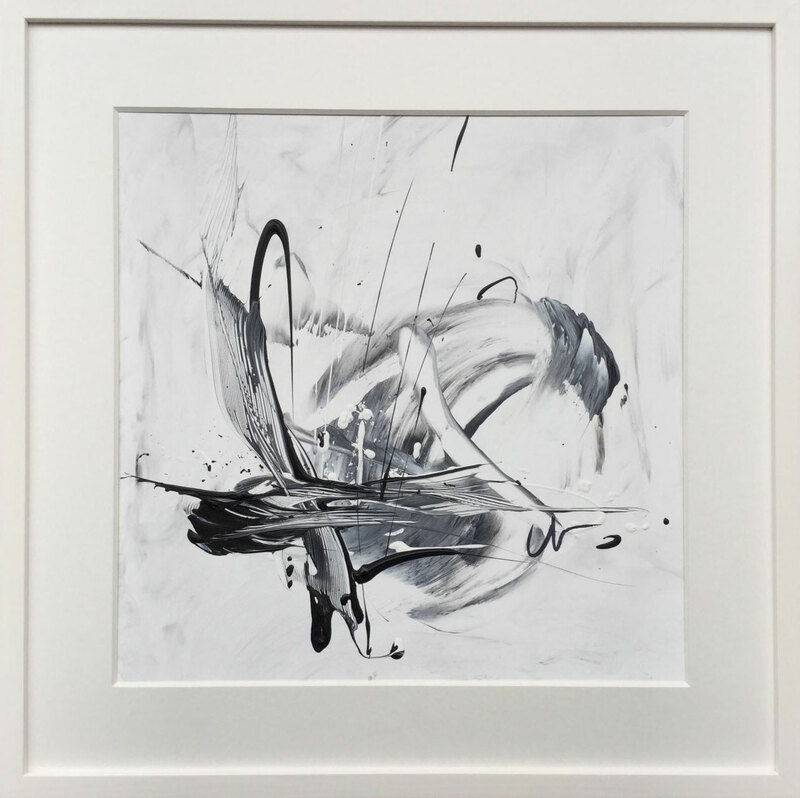 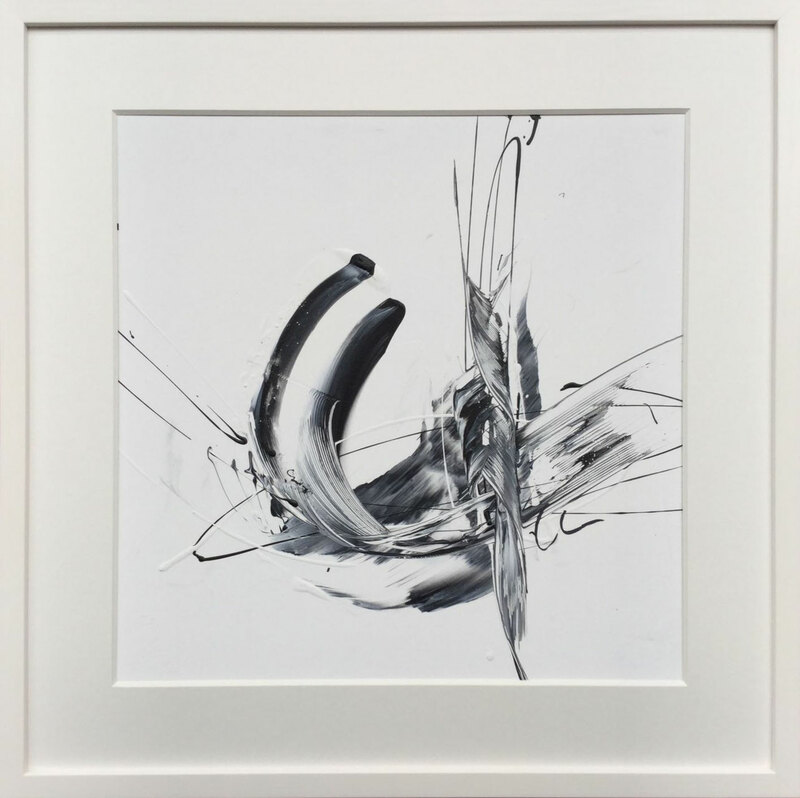 A black and white painting which captivates through the movement and different textures. 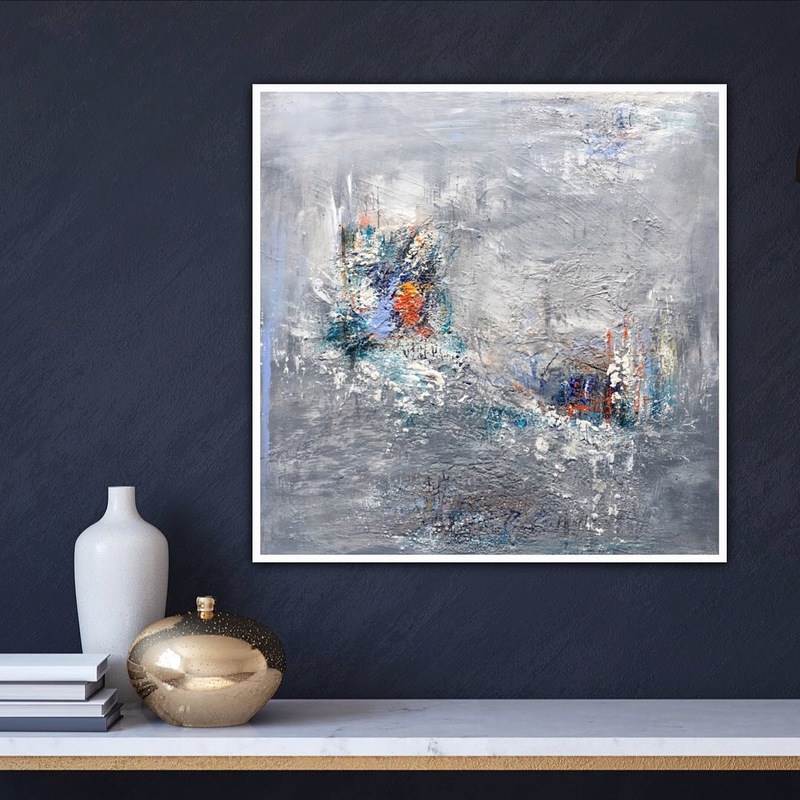 A long lasting eye turner in every contemporary surrounding. 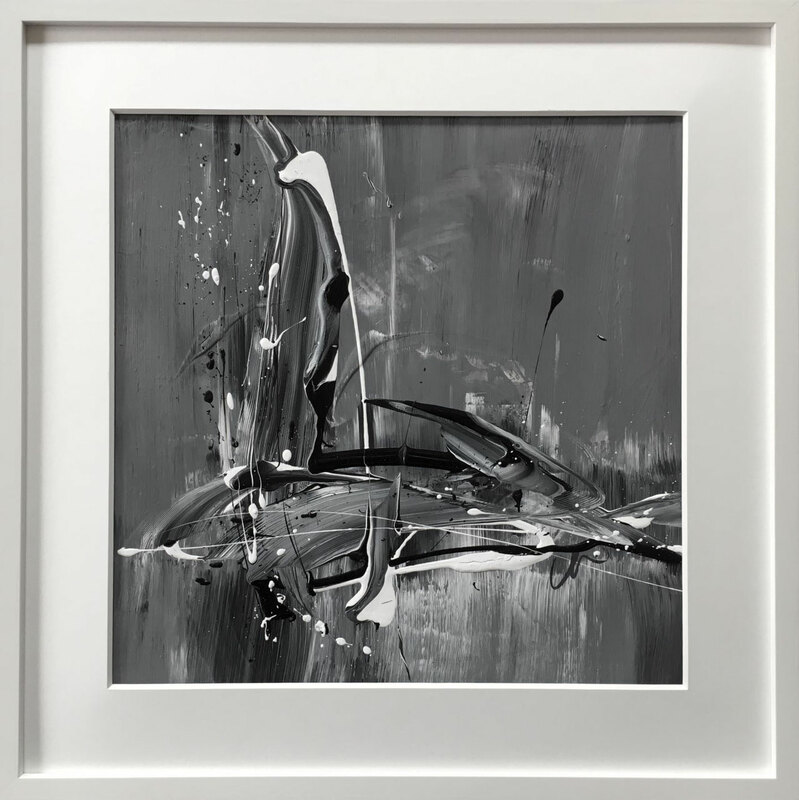 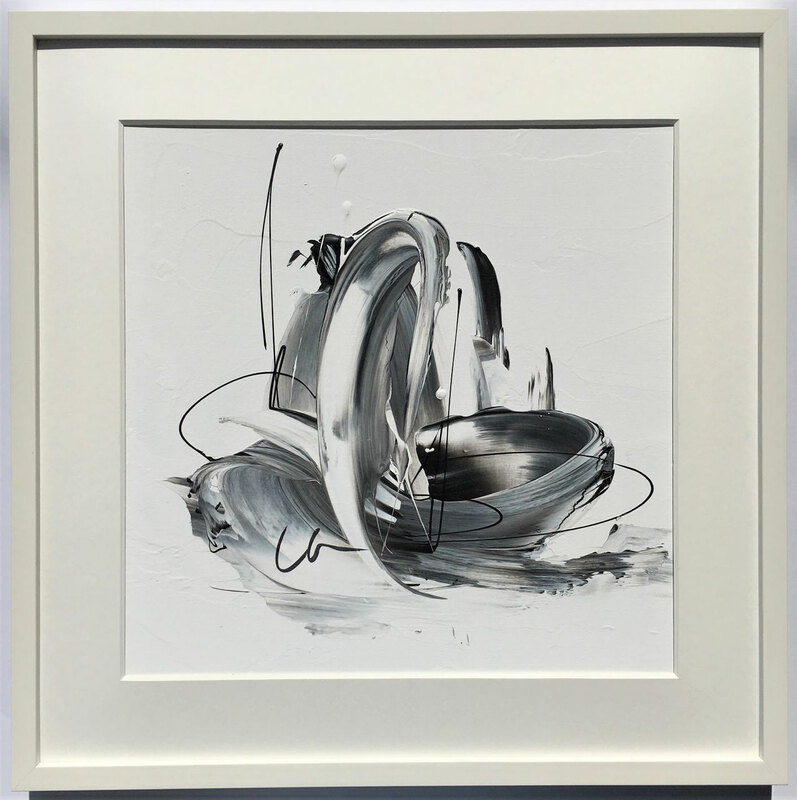 This original painting comes in a white frame (wood) with white mat - ready to hang. This compelling piece is full of movement and even so balanced and harmonious. 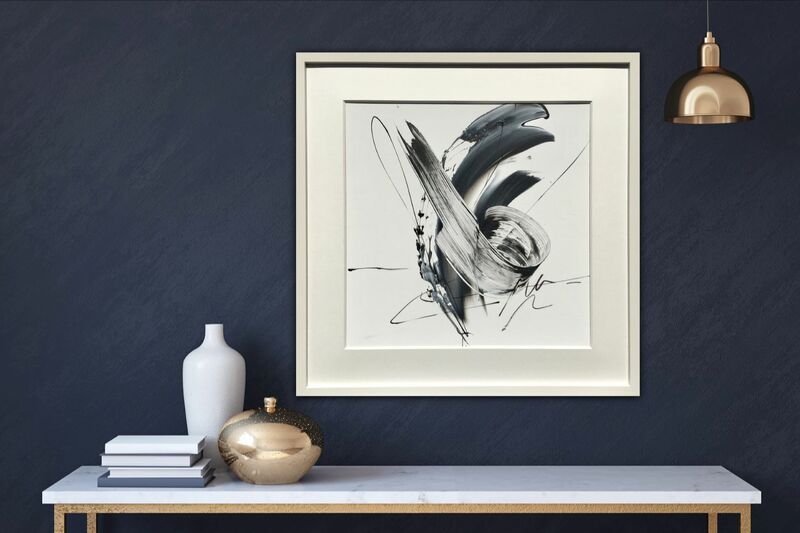 The minimalist colours palette makes this piece a long lasting eye turner and enriches every contemporary room with an expressive message. 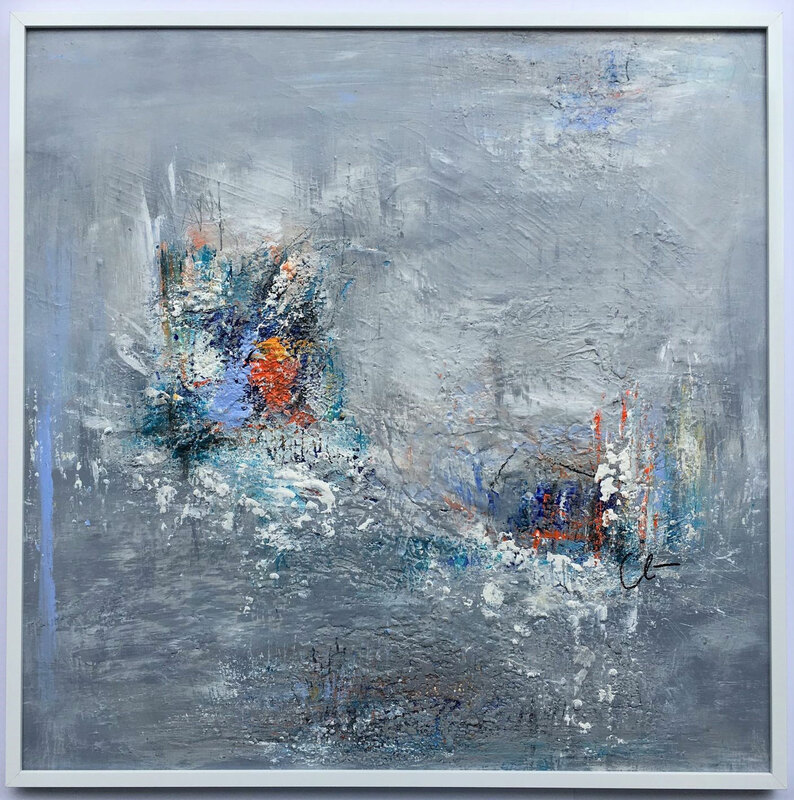 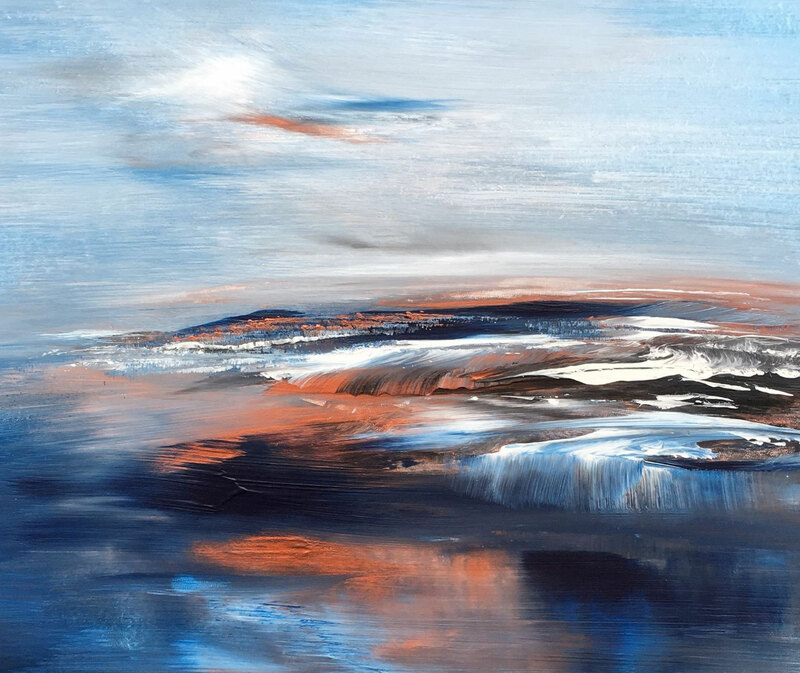 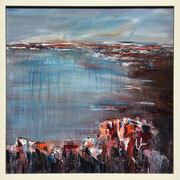 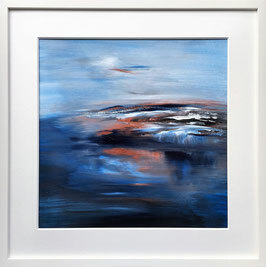 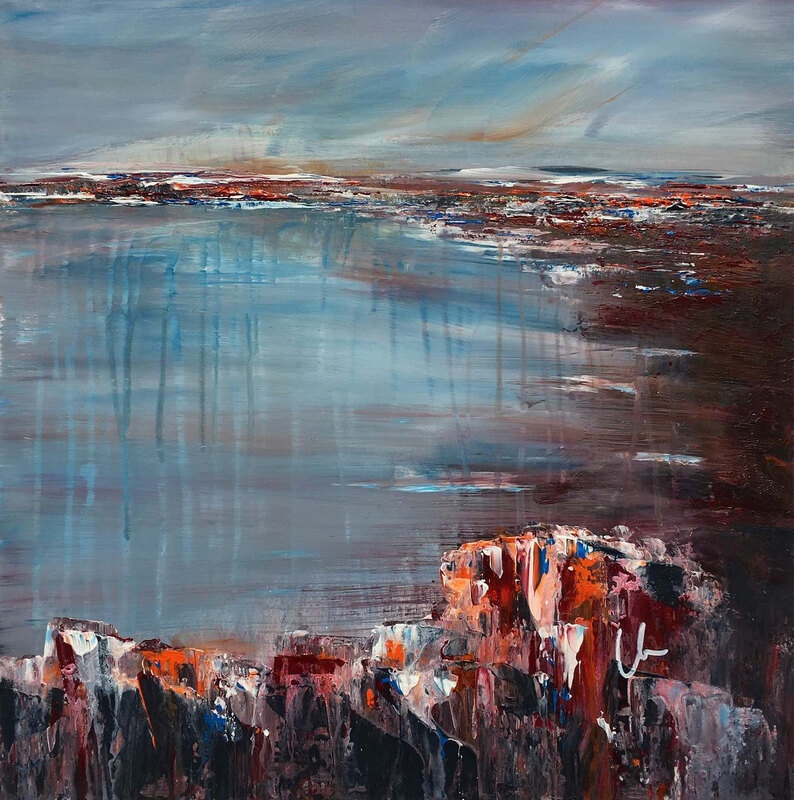 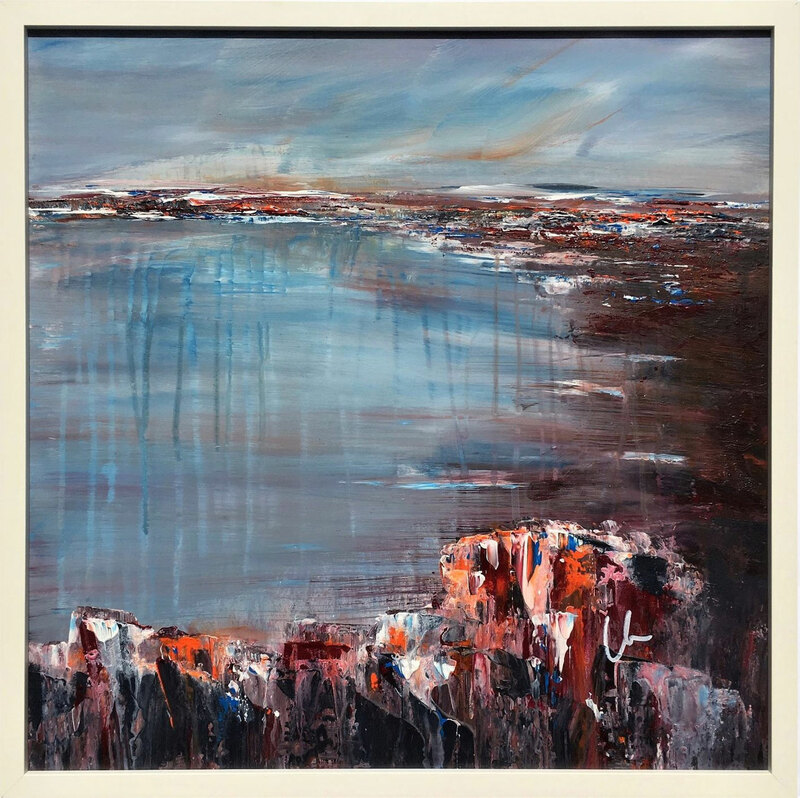 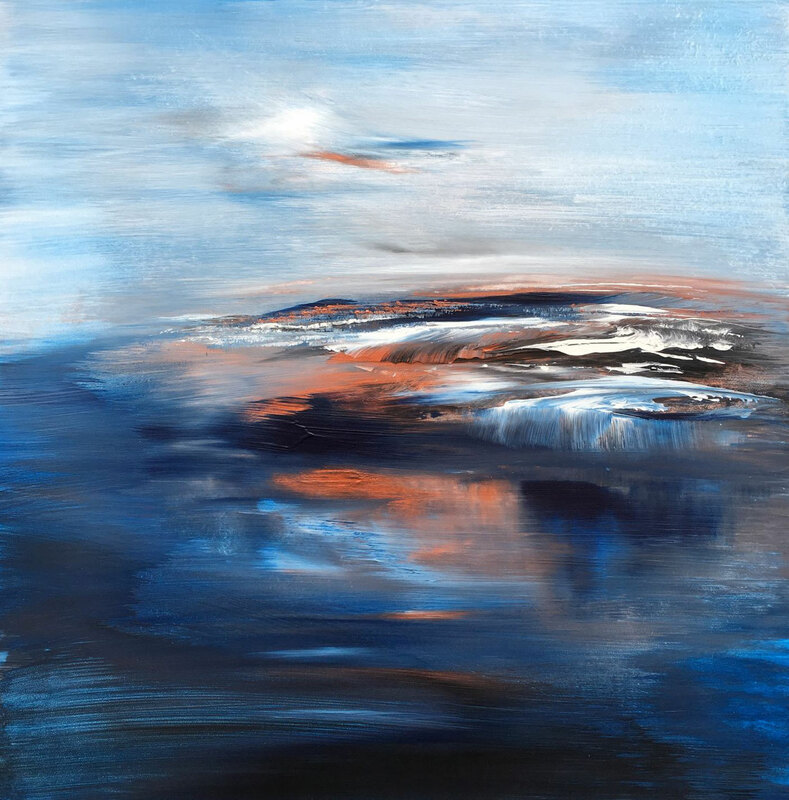 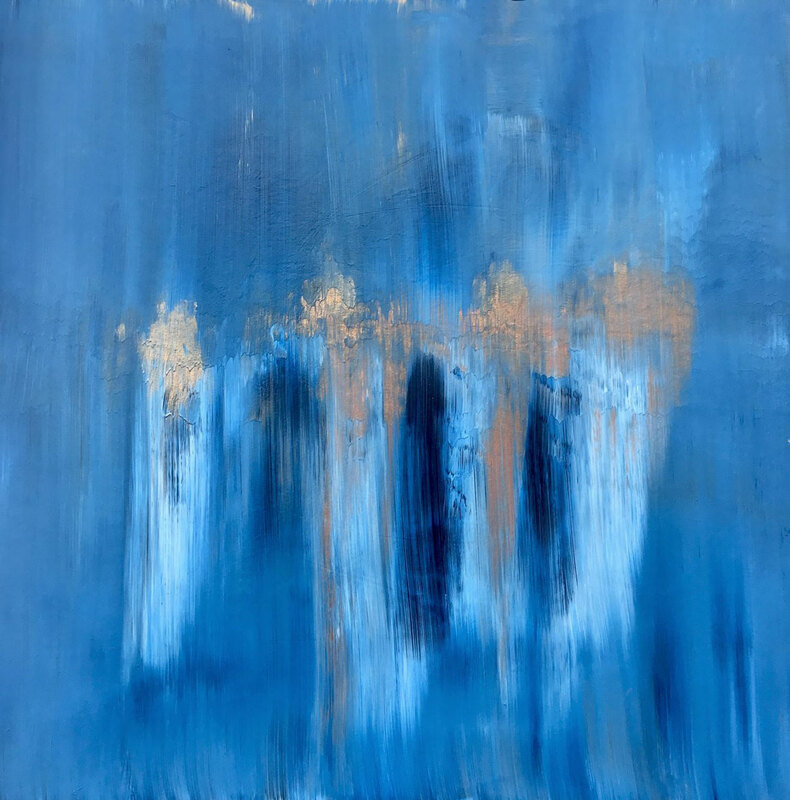 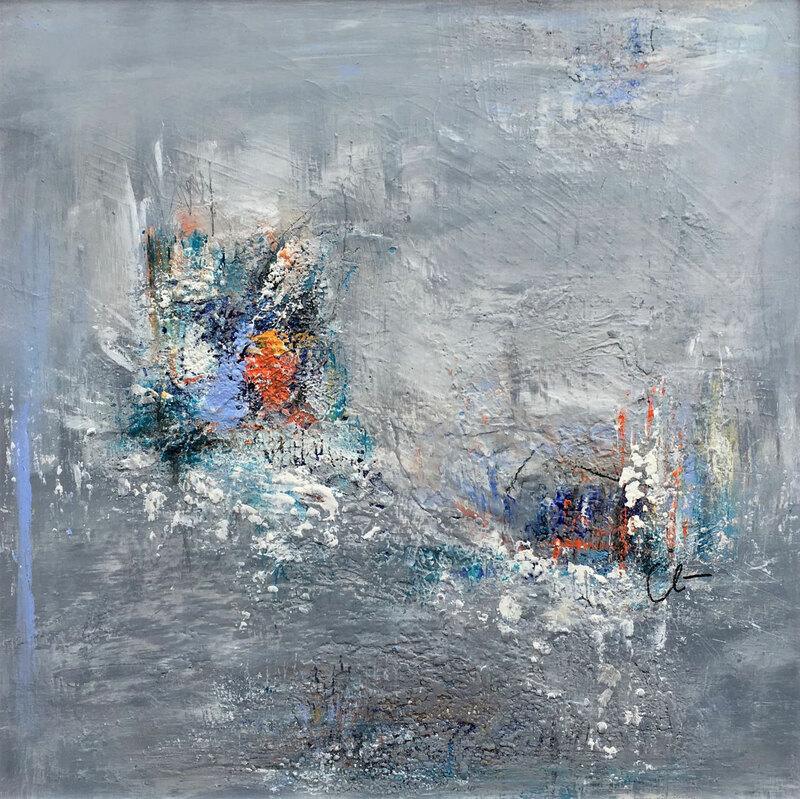 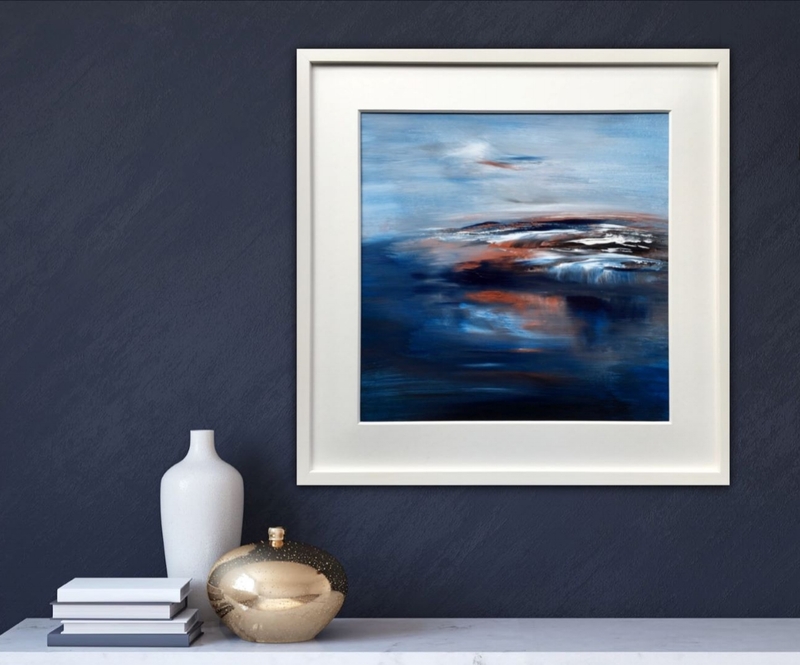 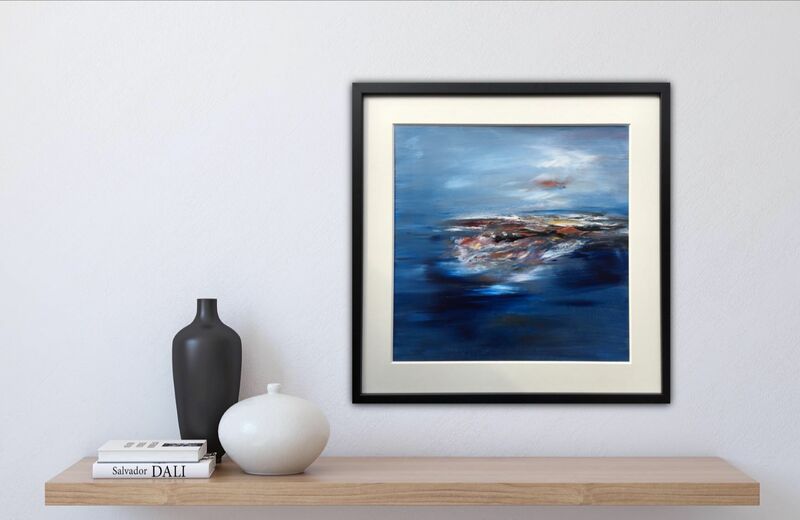 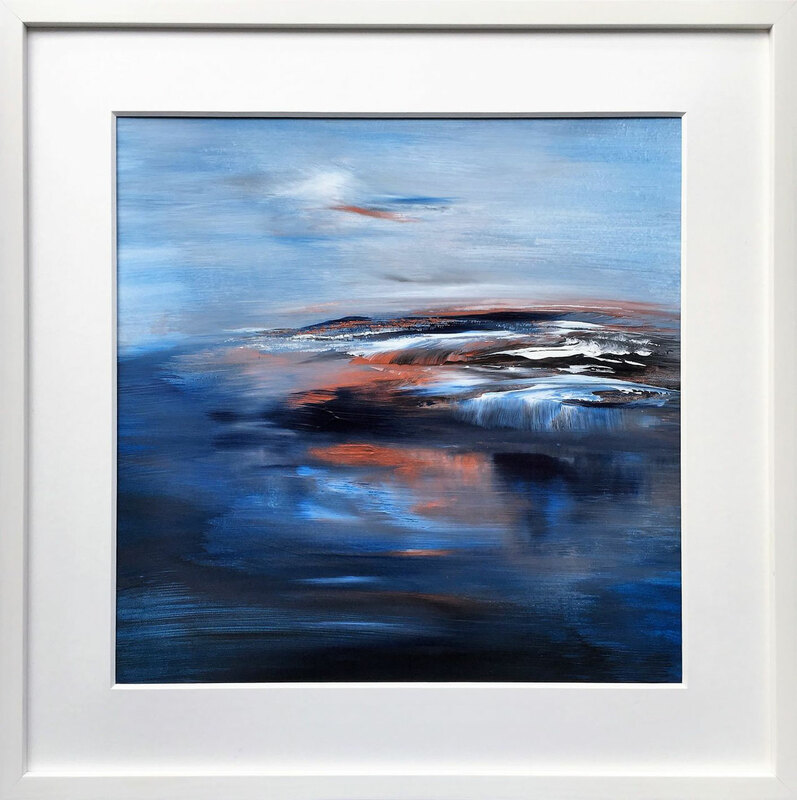 Blue, copper and white are the three tones in this exciting and dynamic piece. 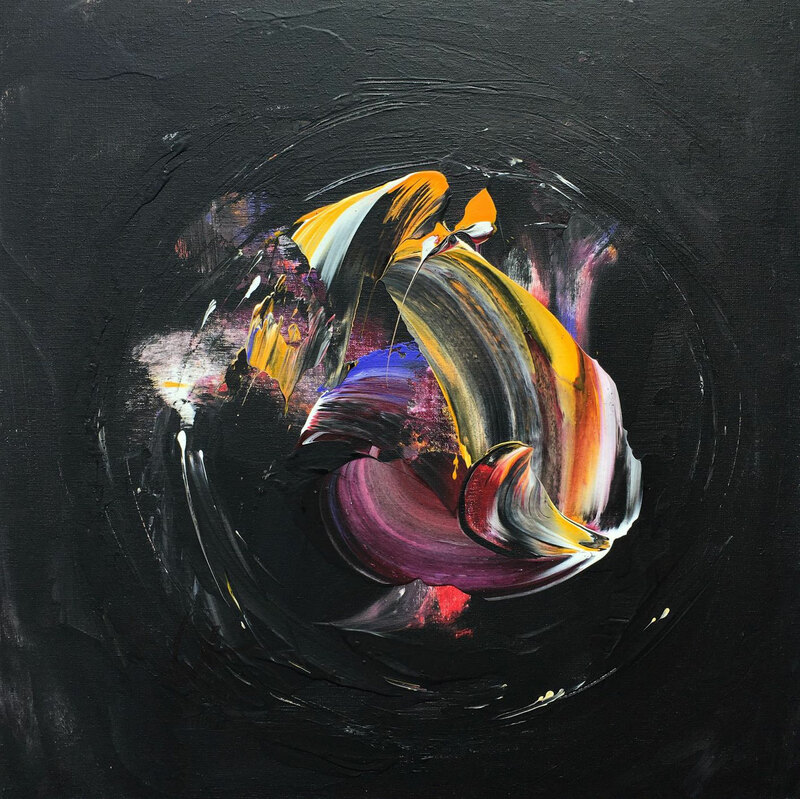 A typhoon of light, that moves its surroundings without destroying them. 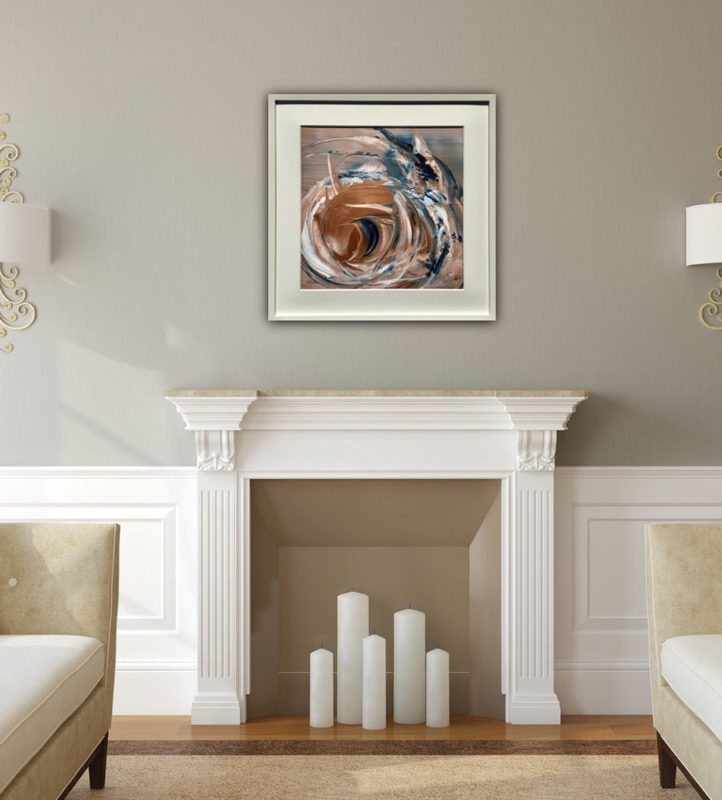 A contemporary piece that brings movement and warmth in a room. This dynamic piece speaks about the circle of life ... always moving. Blue, copper and white are the three tones in this exciting piece. 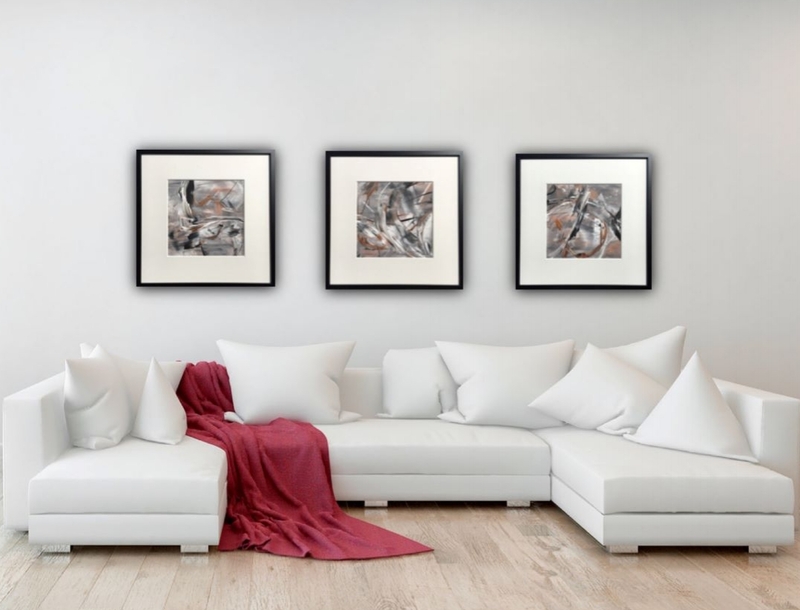 A circle of light that moves its surroundings bringing warmth, serenity and impact. 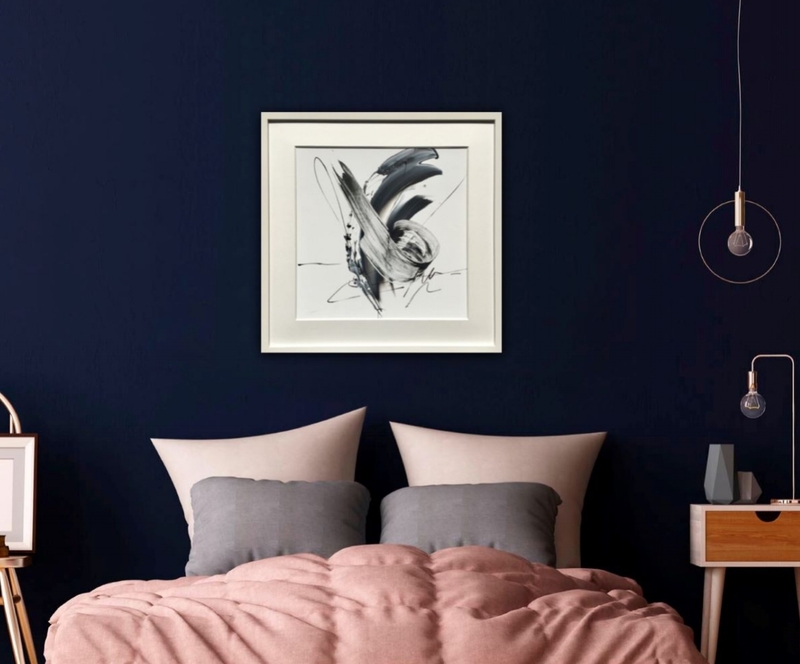 This piece is a kind of good luck charm - a lucky dragon, that brings good vibes and powerful colours into your home or office. 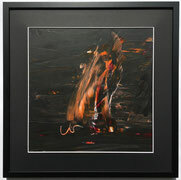 Black is always a good choice to create strong contrasts. 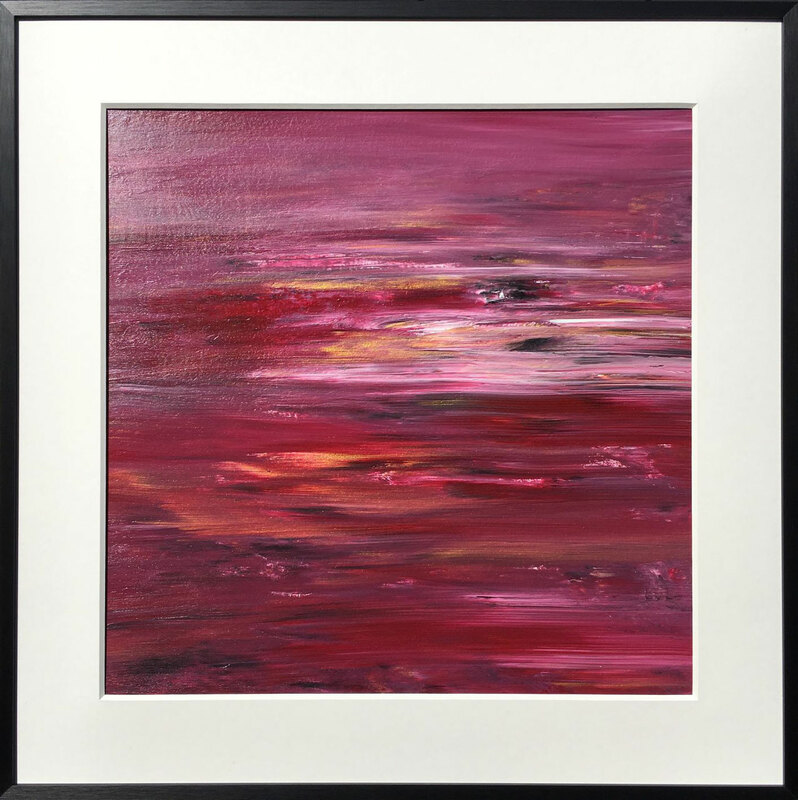 By adding warm colours as red, yellow and orange I have created pieces, that are particularly captivating as a solo eye-catcher or e.g. 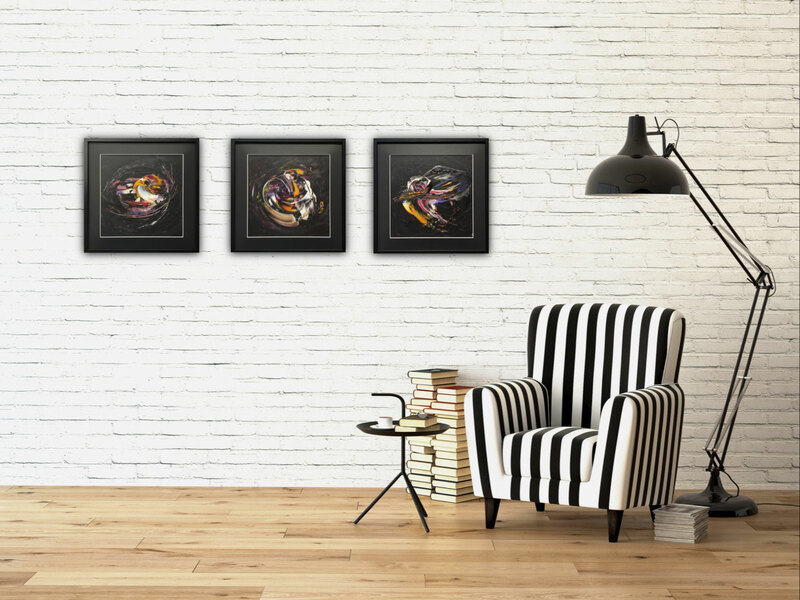 arranged together with other pieces of this series. 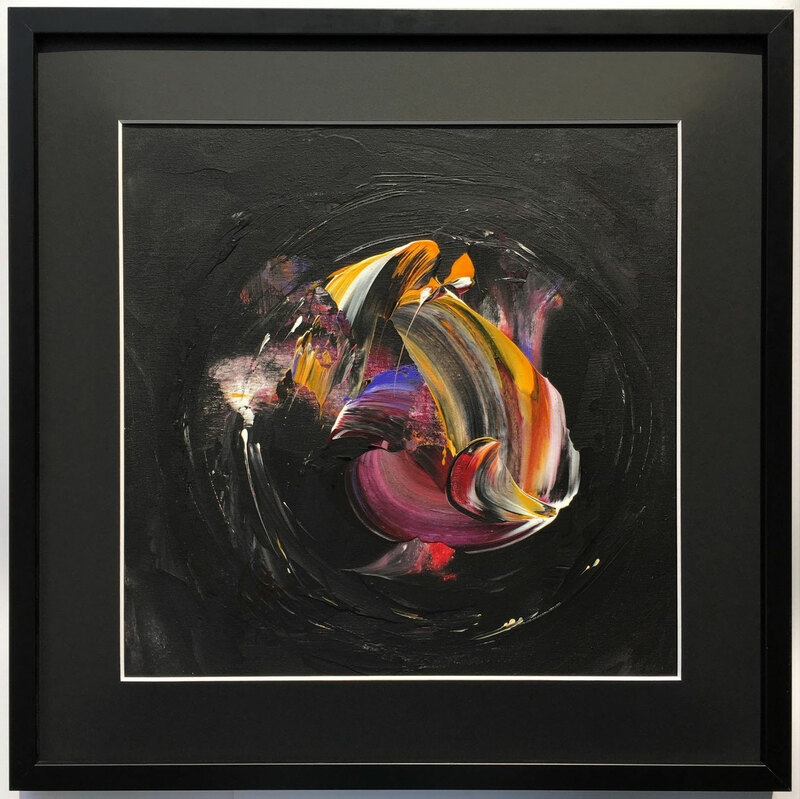 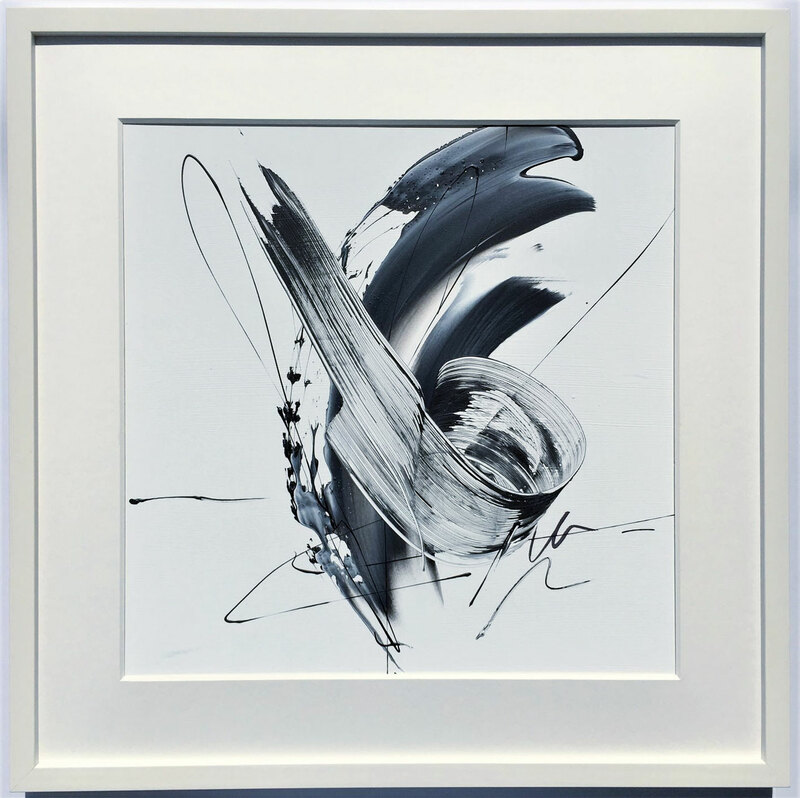 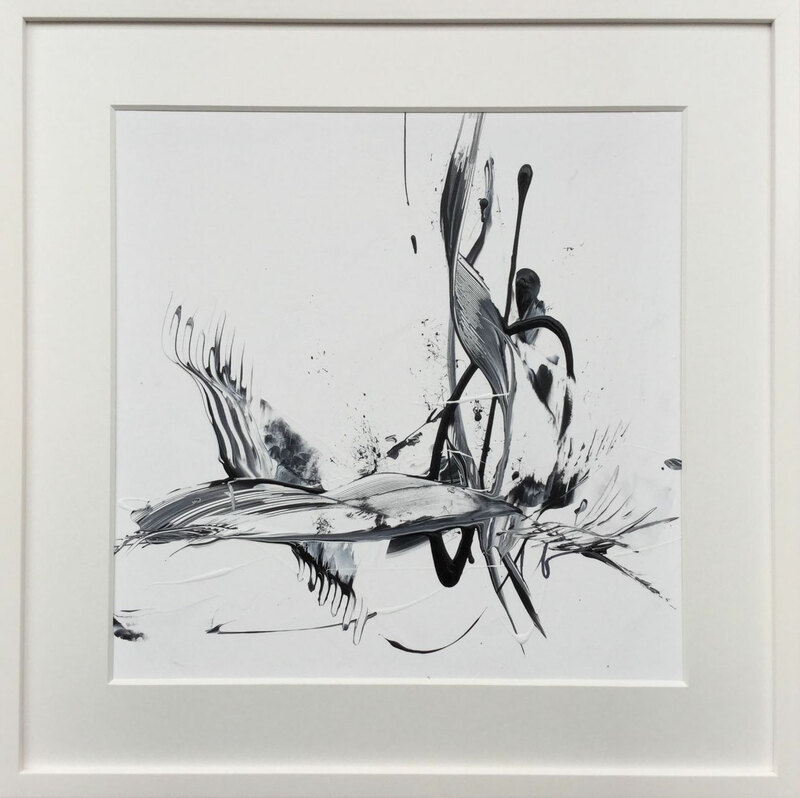 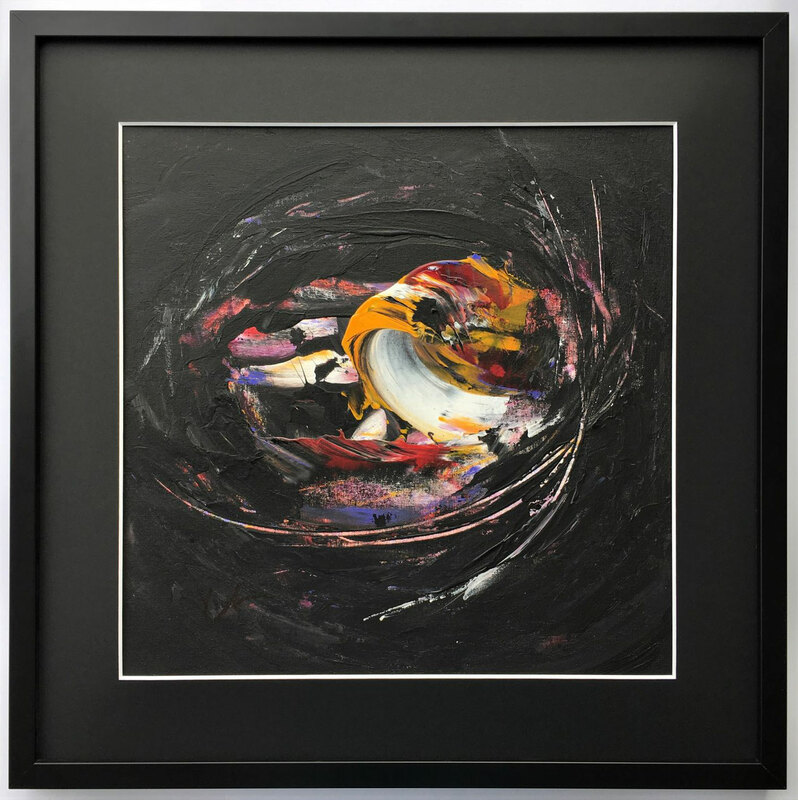 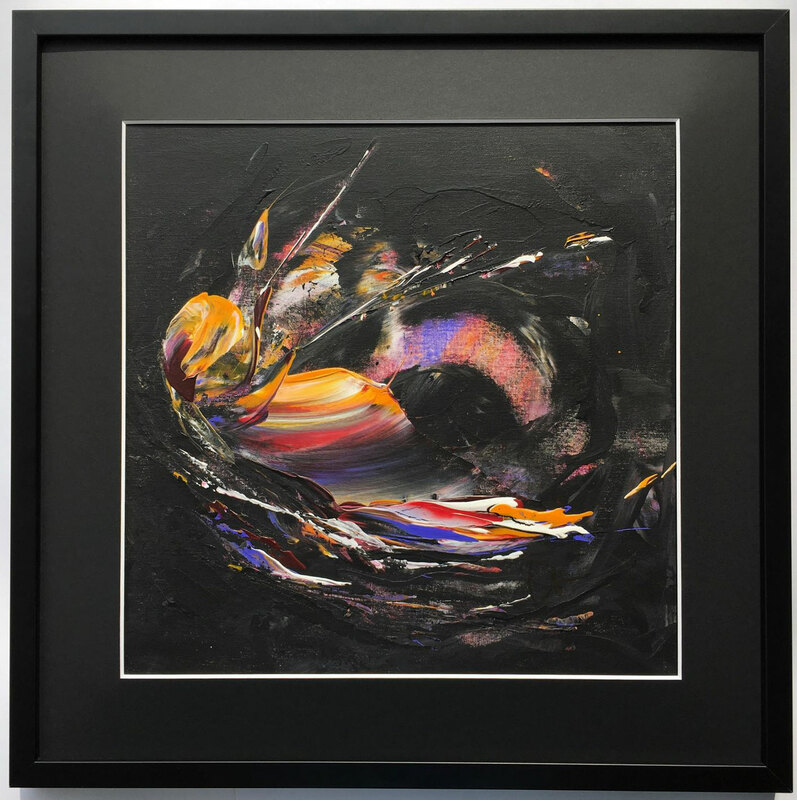 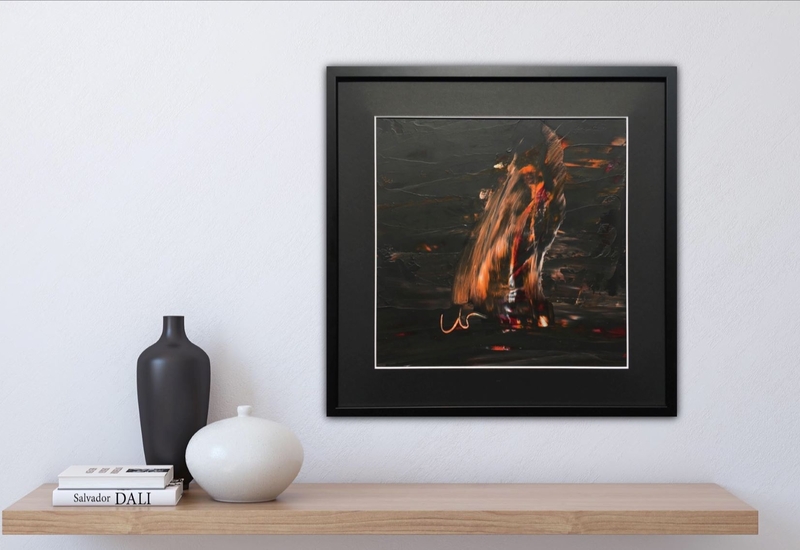 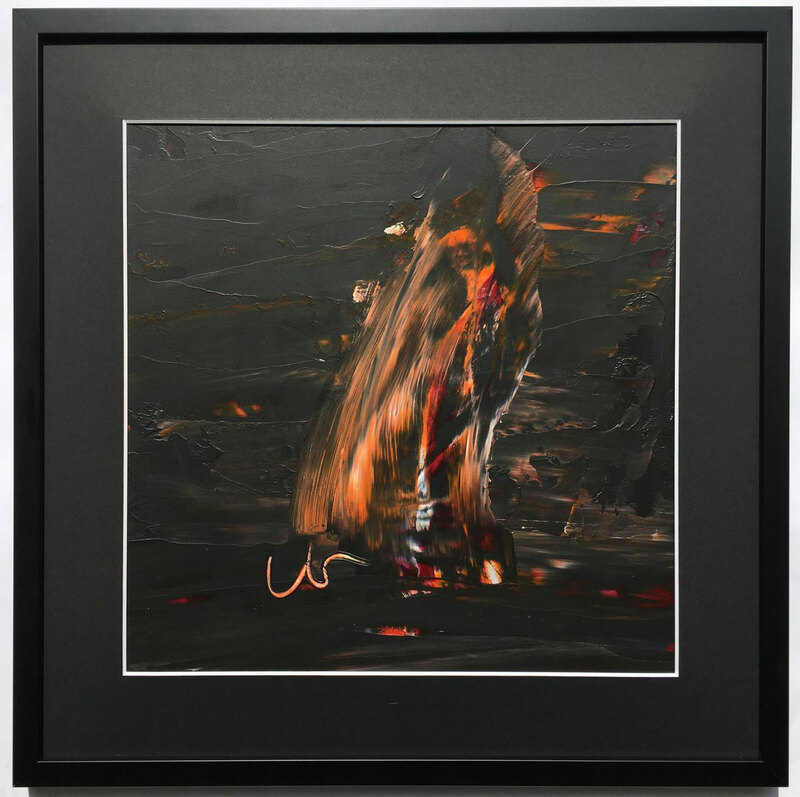 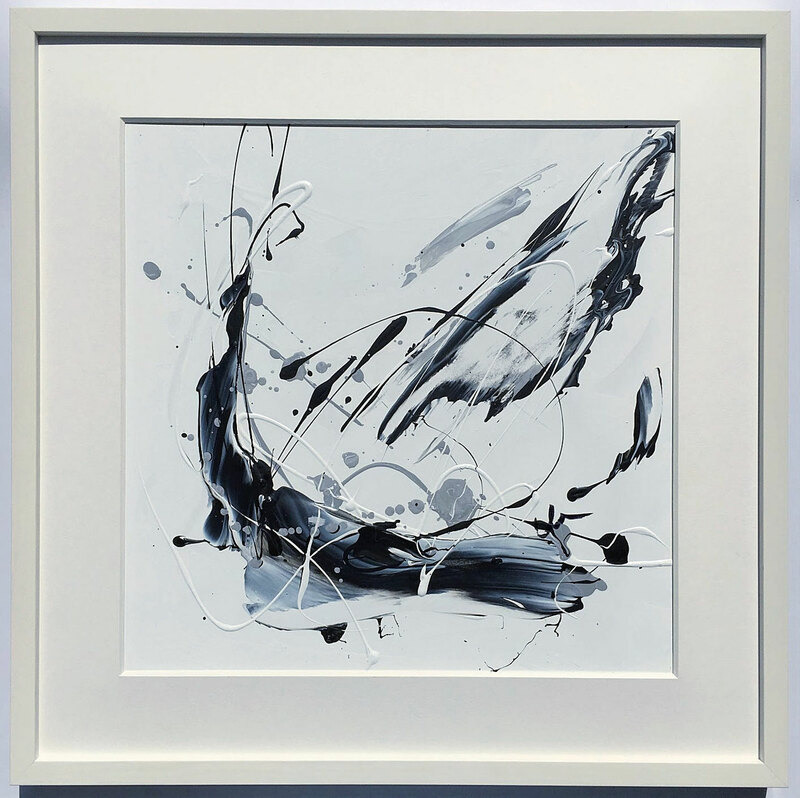 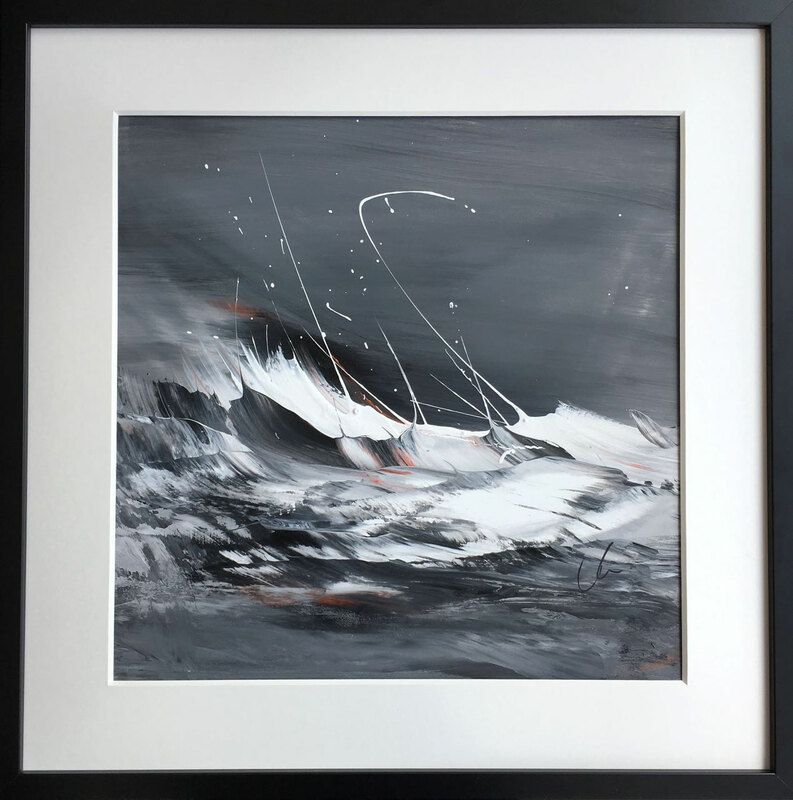 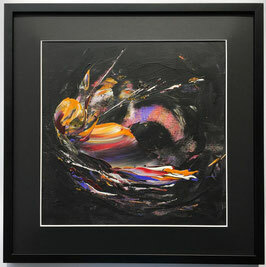 This original painting comes in a black frame (wood) with black mat - ready to hang. 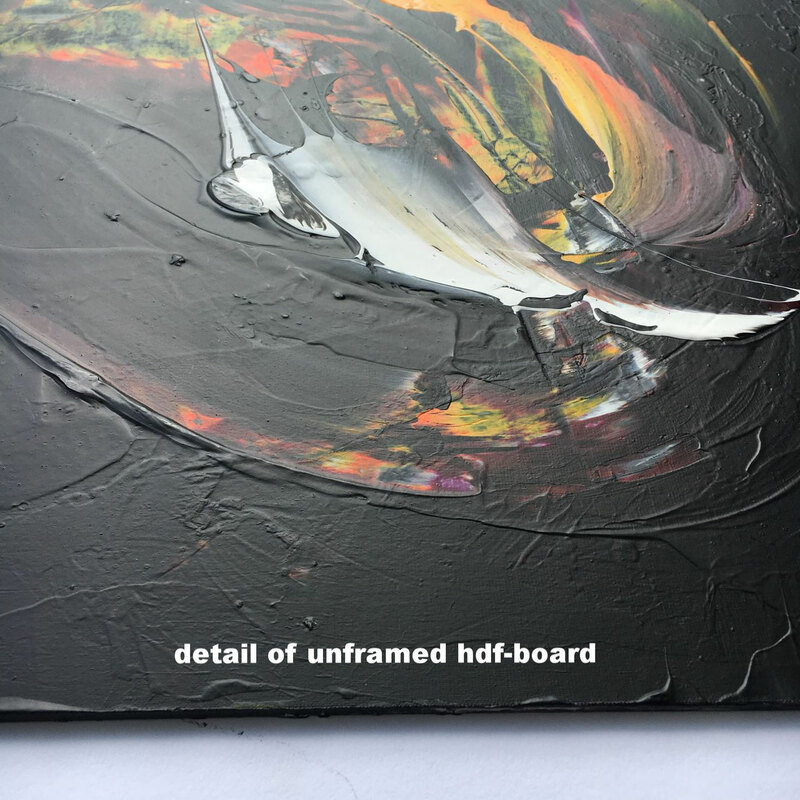 Acrylic paint on thin HDF-board (=high density fiber board) 0,3 cm (0,12 inch) - ready framed. This rather minimalistic piece is powerful and colourful despite the reduced colours palette. 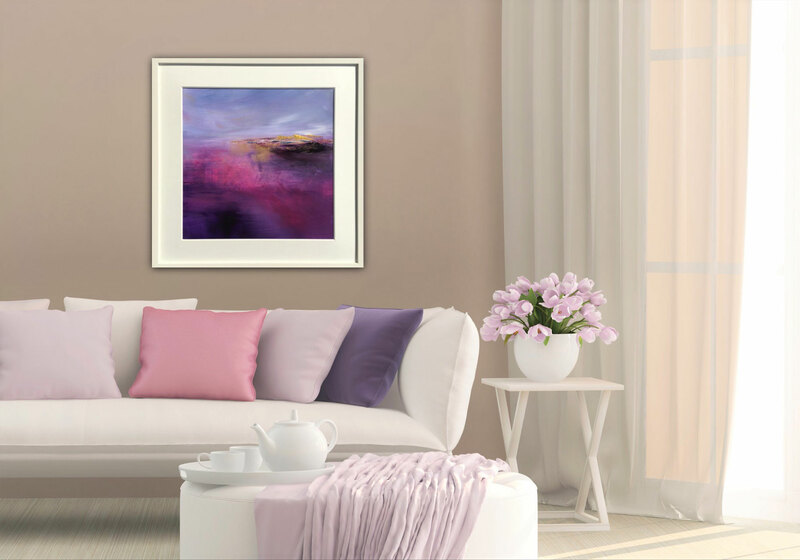 By using great colours contrasts I have created this extraordinarily captivating piece, which can be hung as a solo eye-catcher or e.g. 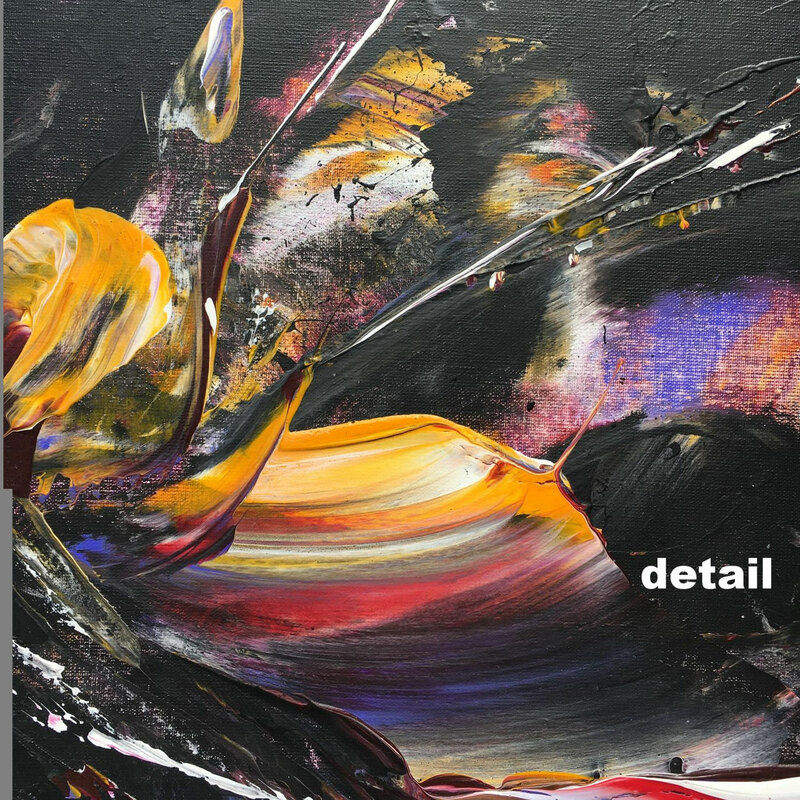 arranged together with other pieces of mine. 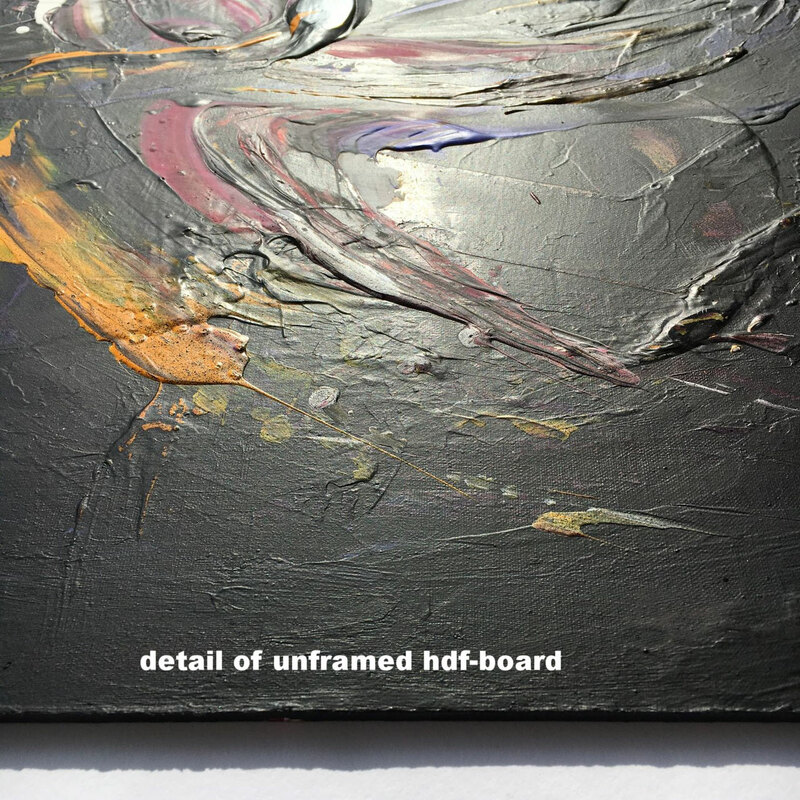 Acrylic paint on thin HDF-board 0,3 cm (0,12 inch) - please note: HDF-boards need framing. 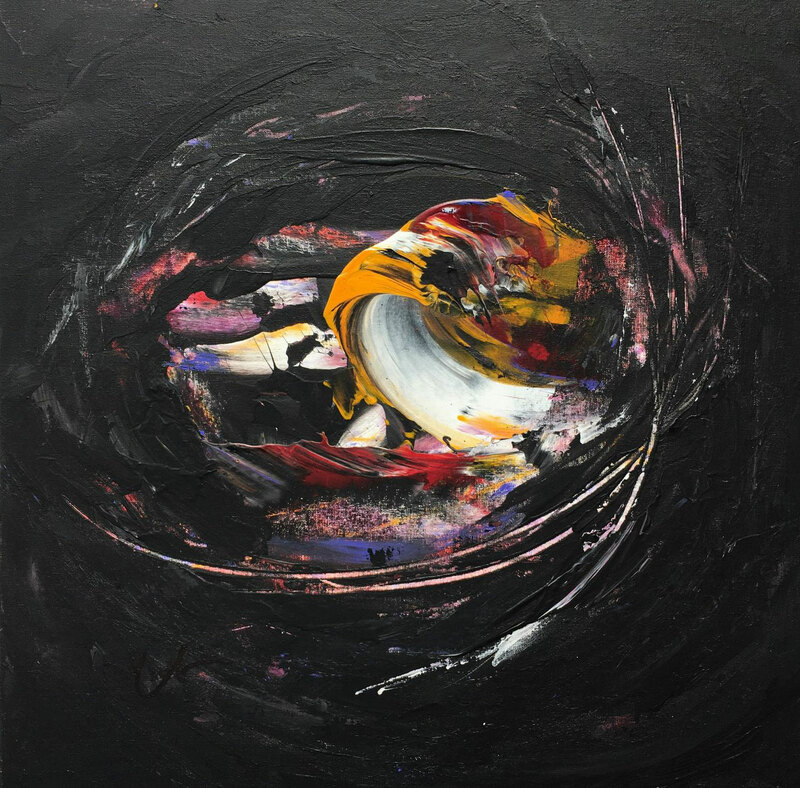 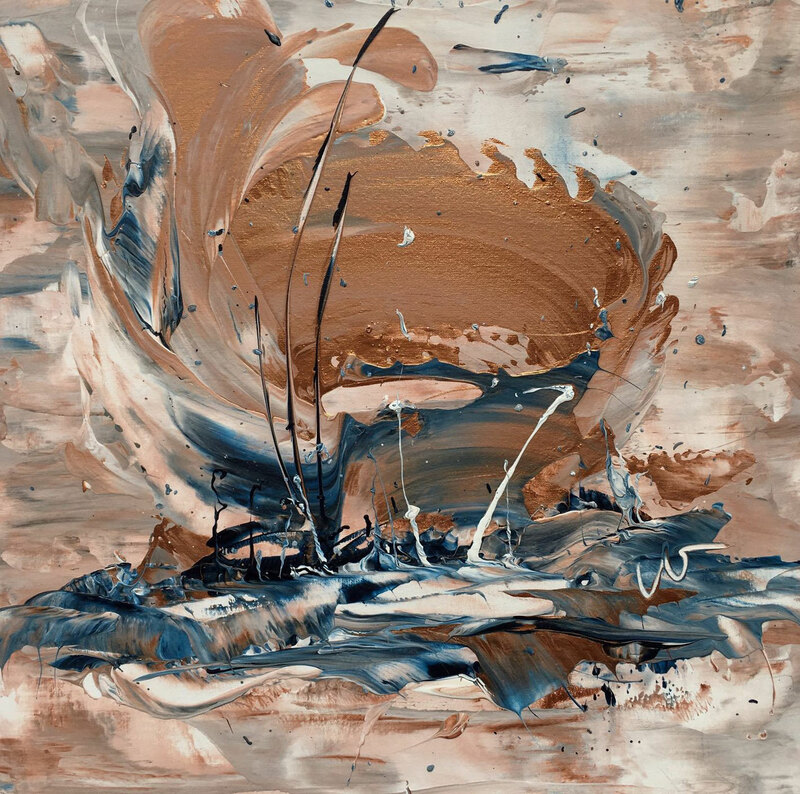 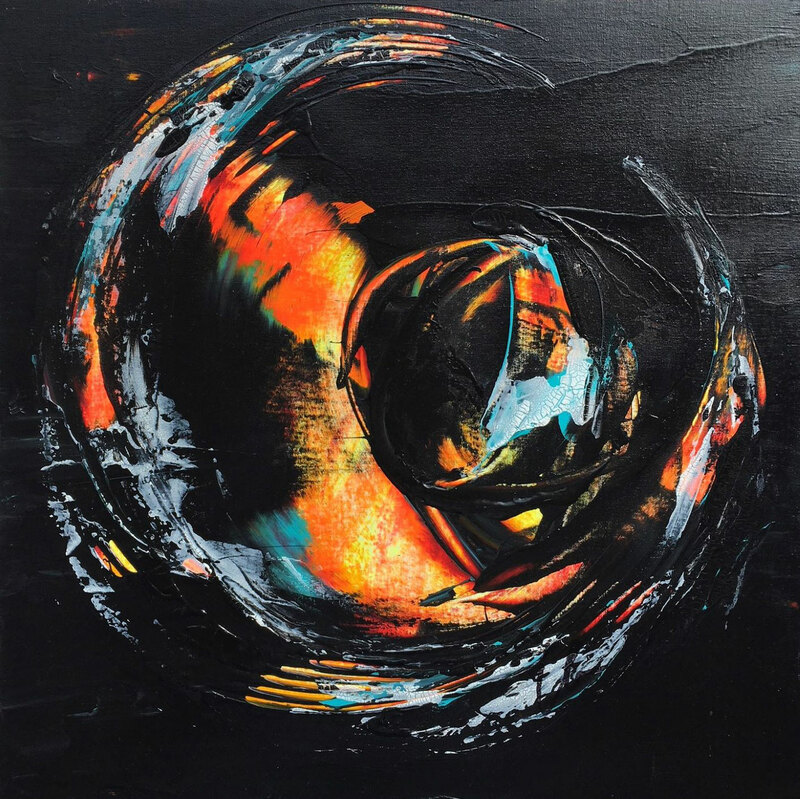 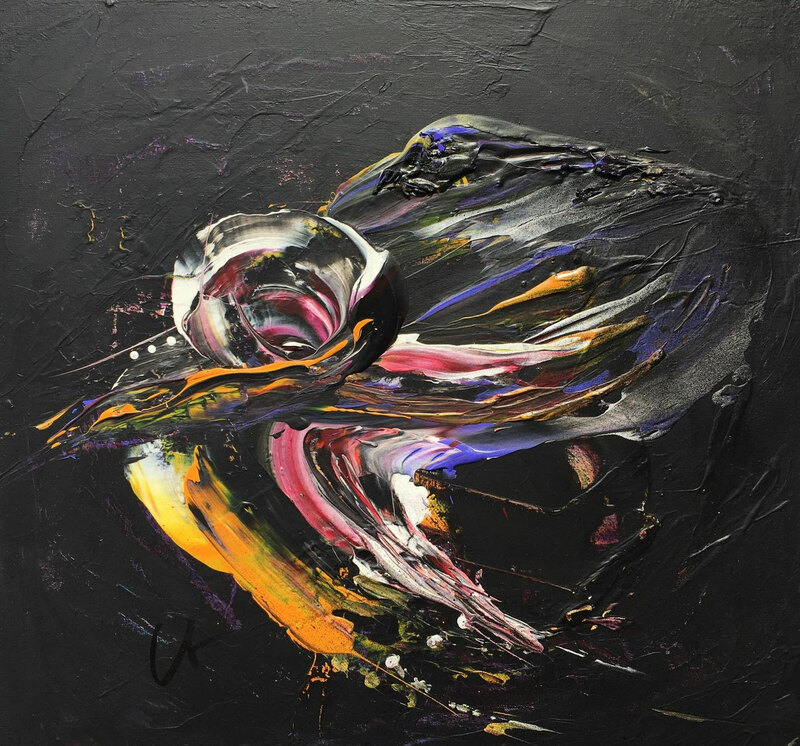 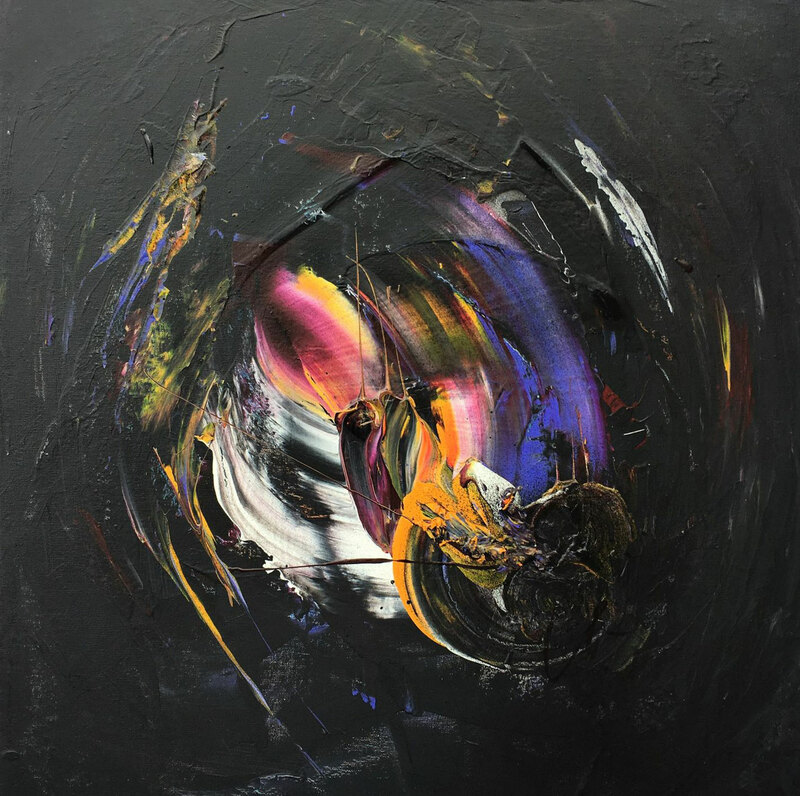 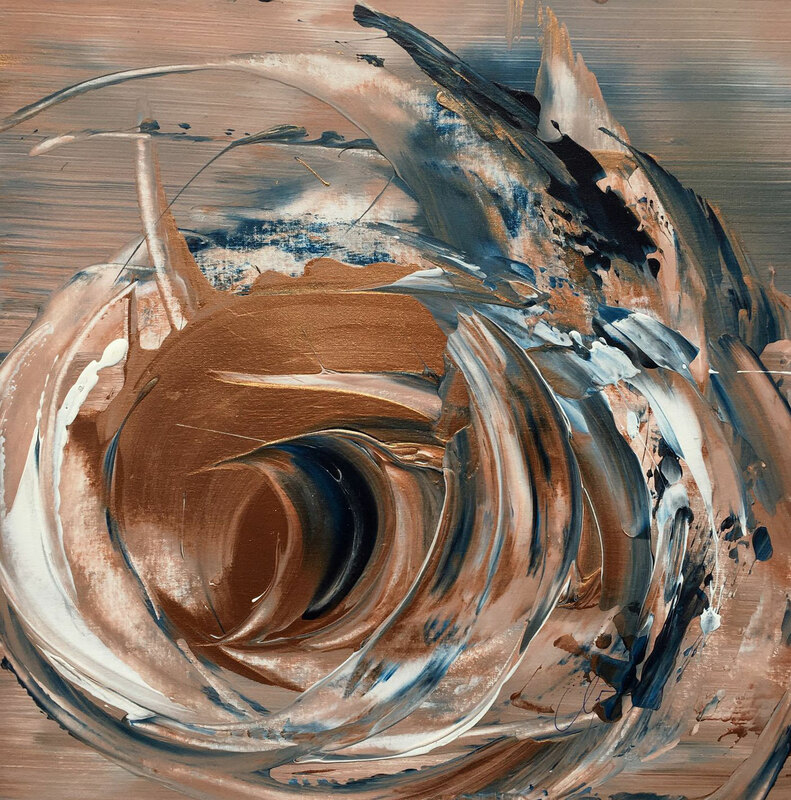 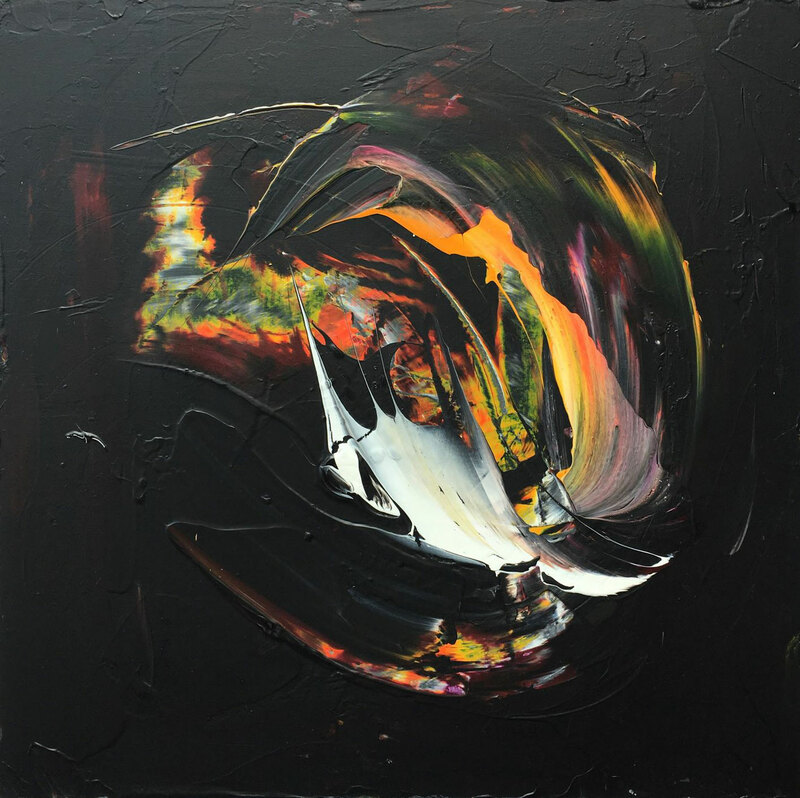 This energetic and expressive vortex has fascinating colour shades and movement. 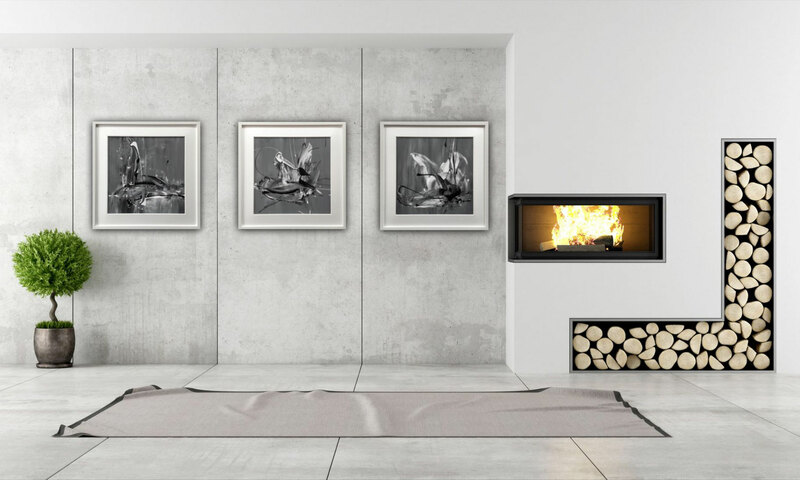 Powerful and at the same time harmonious. 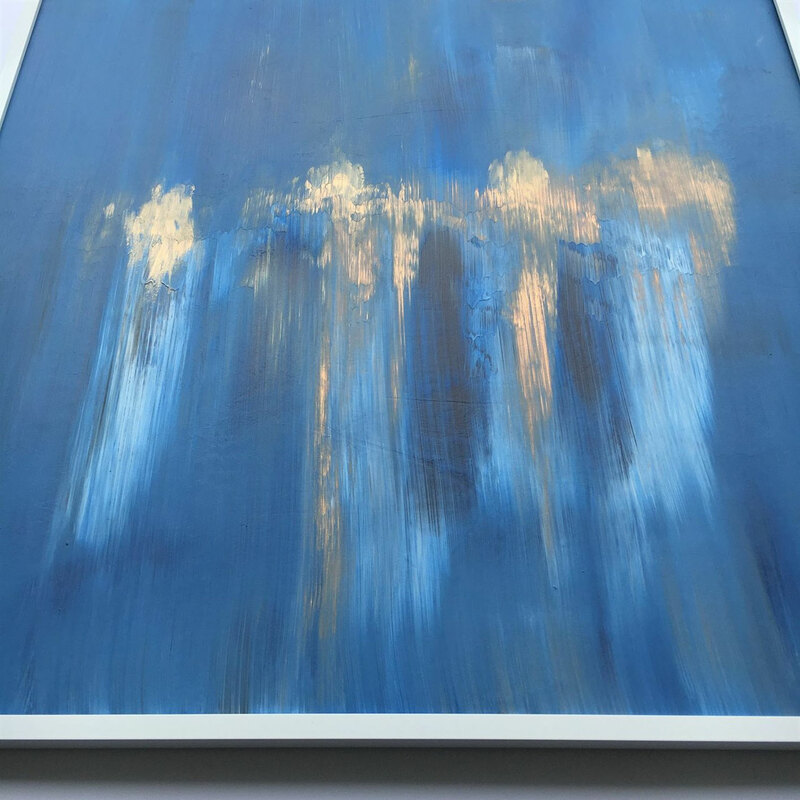 A piece that never gets boring. 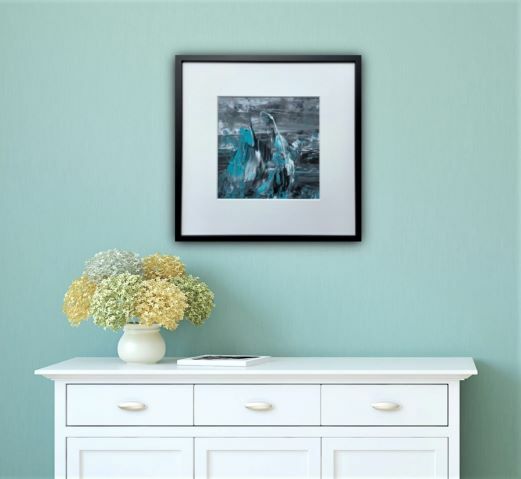 It can be hung as a solo eye-catcher or e.g. 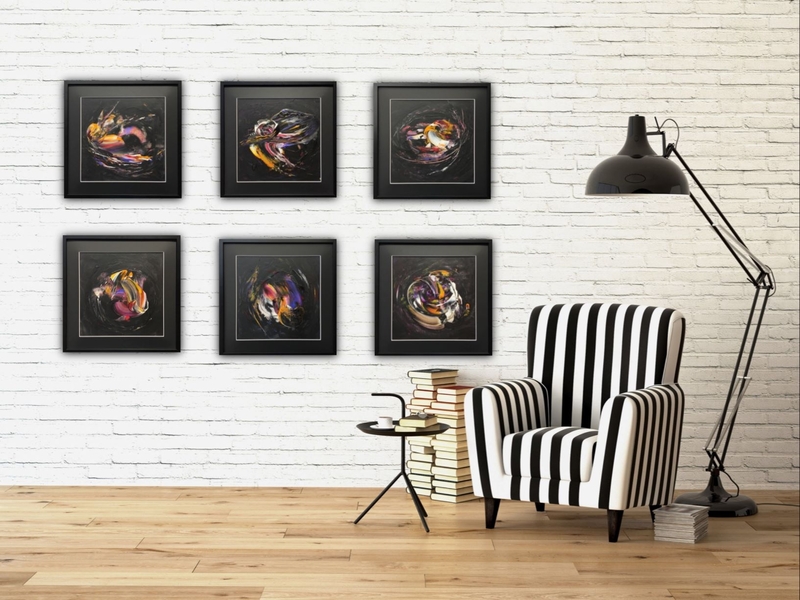 arranged together with other pieces of mine. 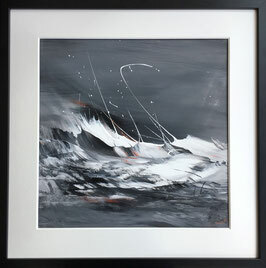 When I first started to paint this series, I imagined what it would feel like to be in space ... I imagined colourful 'holidays' in the black surrounding, which led to powerful abstract artwork with strong colour contrasts. 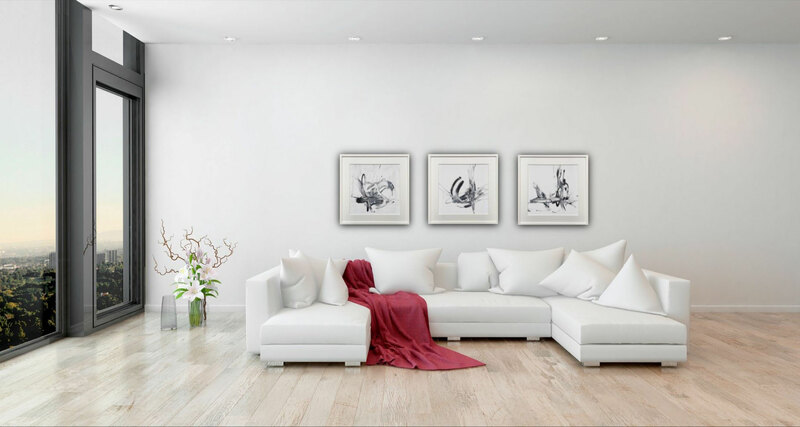 Each work can stand alone as an attractive contemporary piece or can be arranged together with other paintings of the series. This original comes in a black frame (wood) including black mat - ready to hang. 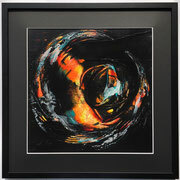 Framed size: 50 x 50 x 2 cm (19,7 x 19,7 x 0,78 inch) - ready framed. 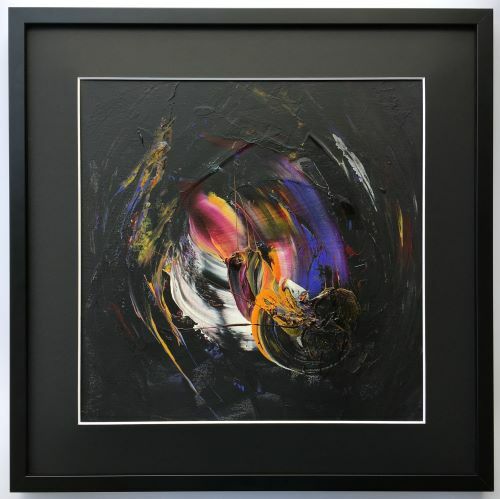 This original painting comes in a black frame (wood) including black mat - ready to hang. 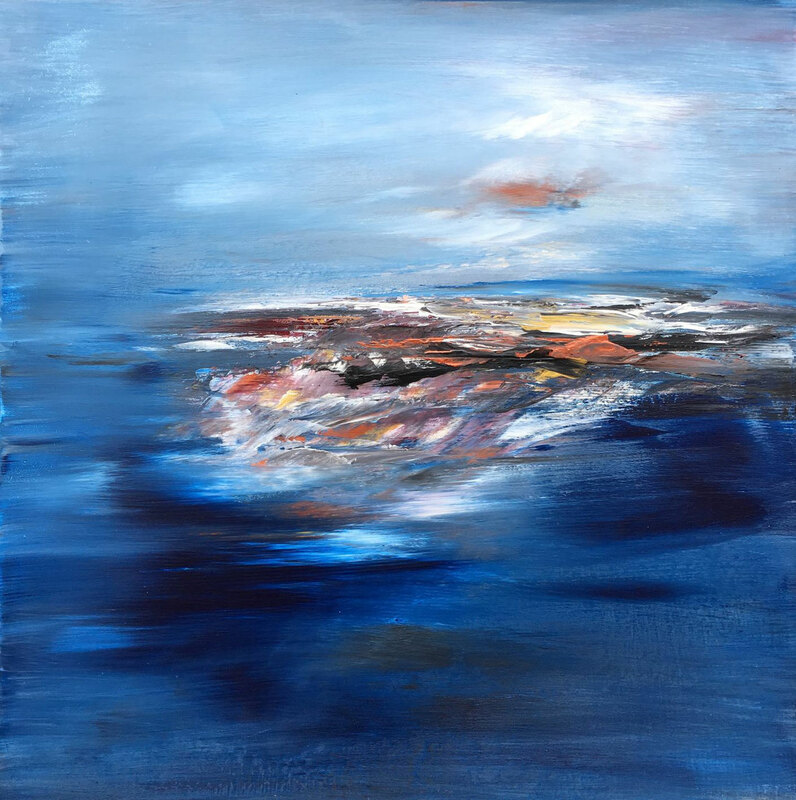 This piece always reminds me to take things easy - because the world always goes round and round, no matter what we think is so important at the moment. Warm and bright orange contrasting with turquoise, white and black give this painting a special radiance and expression. 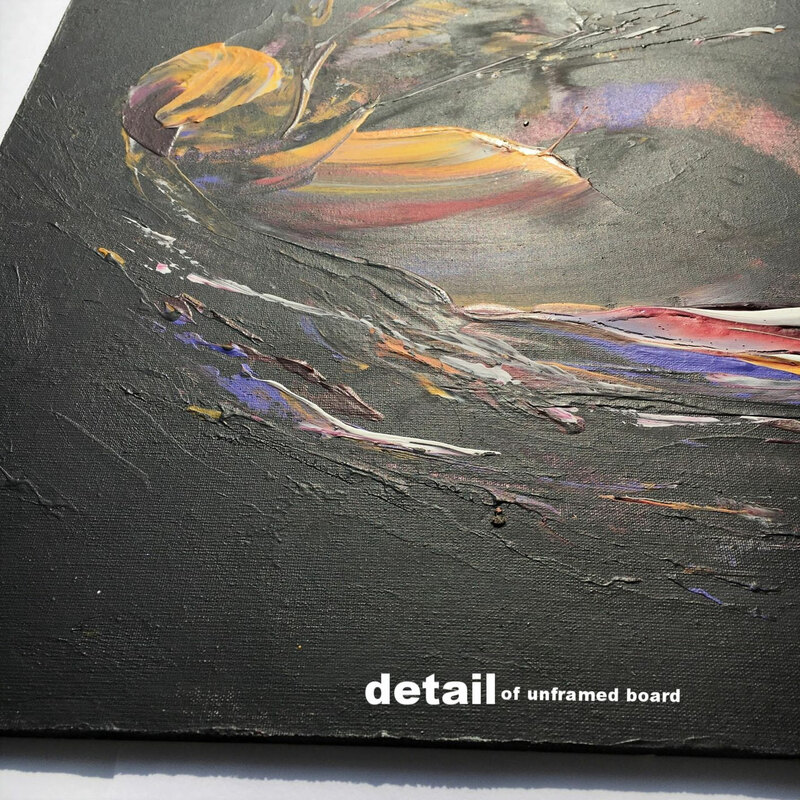 Varnished with a matt finish. 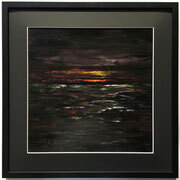 When darkness seems to take over - there is always a light at the horizon to give hope and strength. 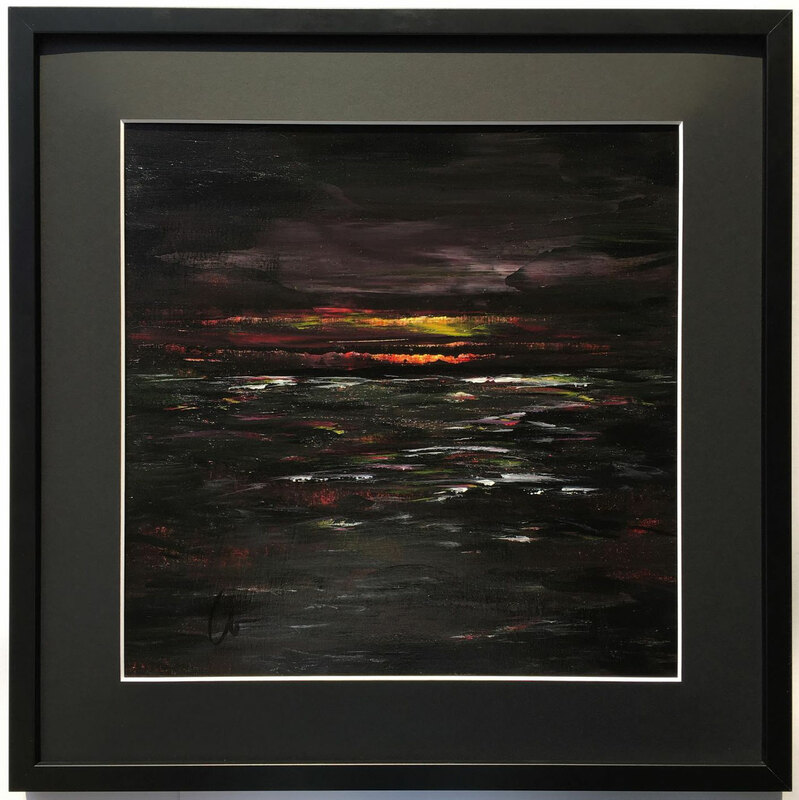 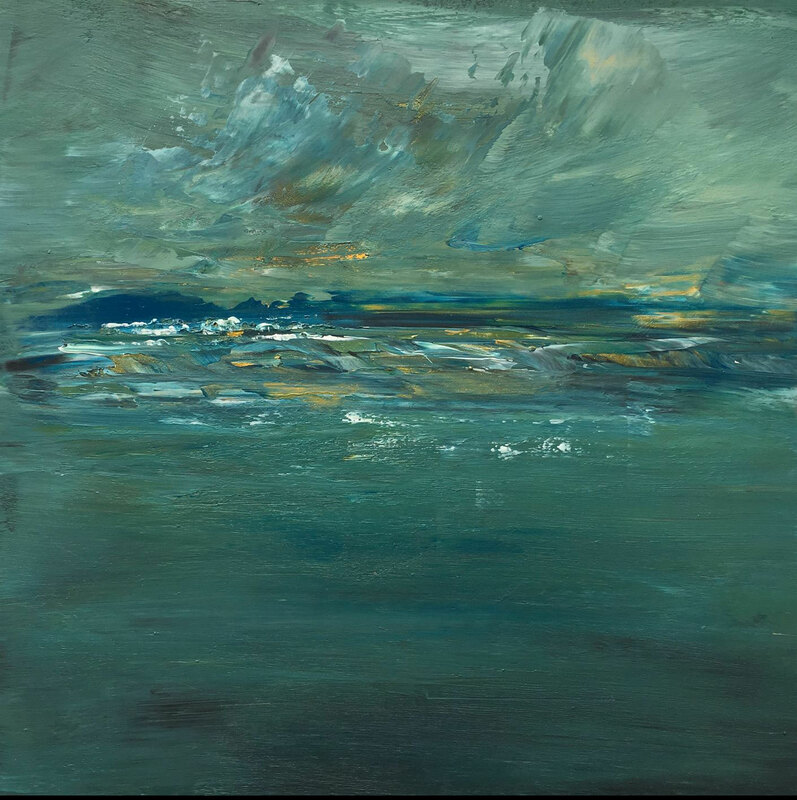 Strong colour contrasts give this painting depth and a sense of light despite the darkness. 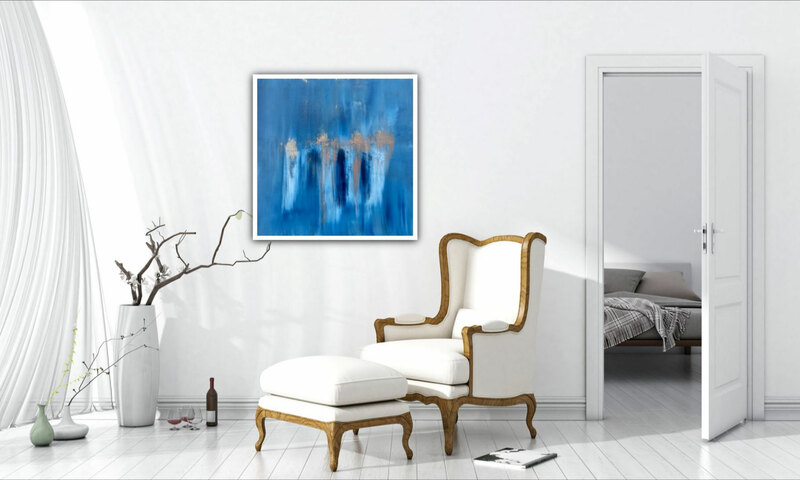 A mimimalist piece with a radiosity of good vibes. 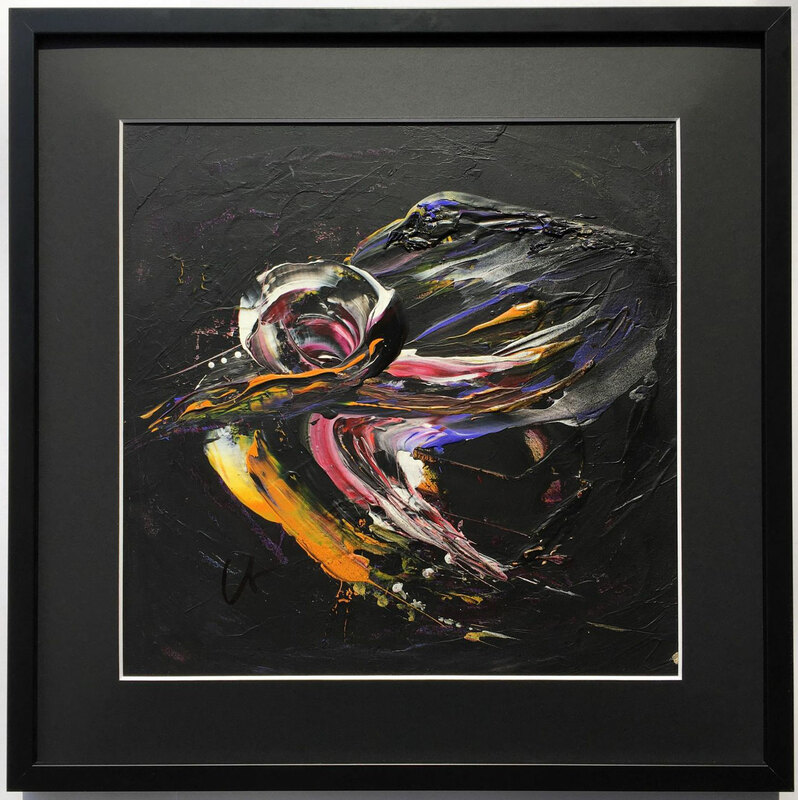 This energetic and abstract flower has fascinating colour shades. 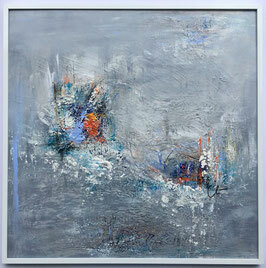 Expressive and at the same time harmonious. 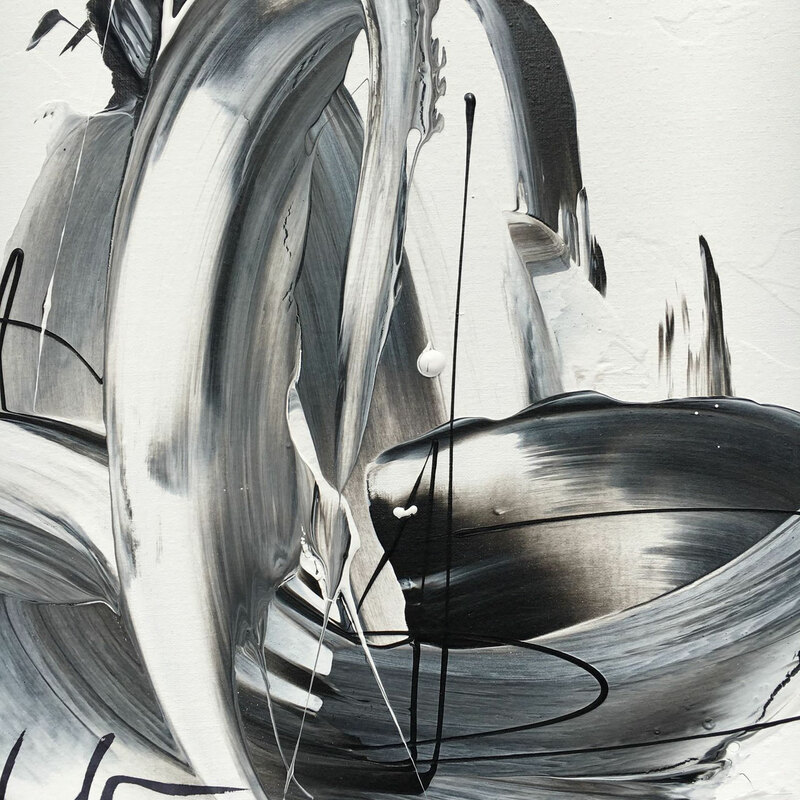 A piece that never gets boring. 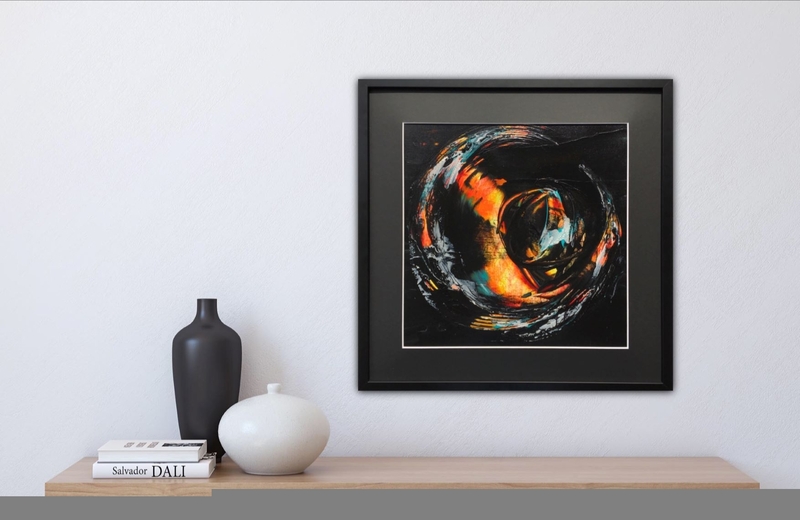 This energetic piece brings fire-energy into your room. 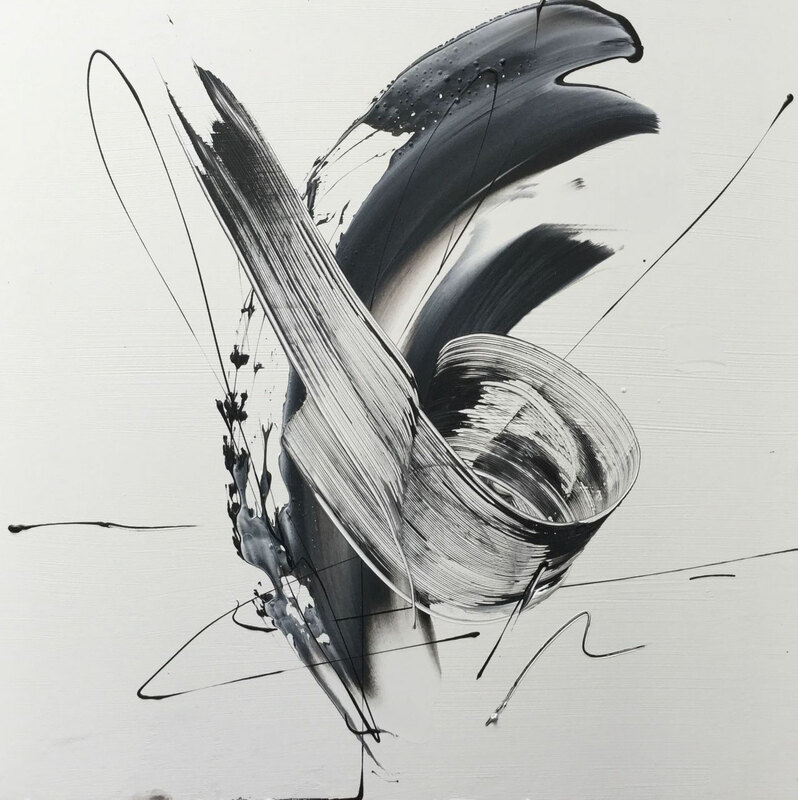 Expressive and powerful. 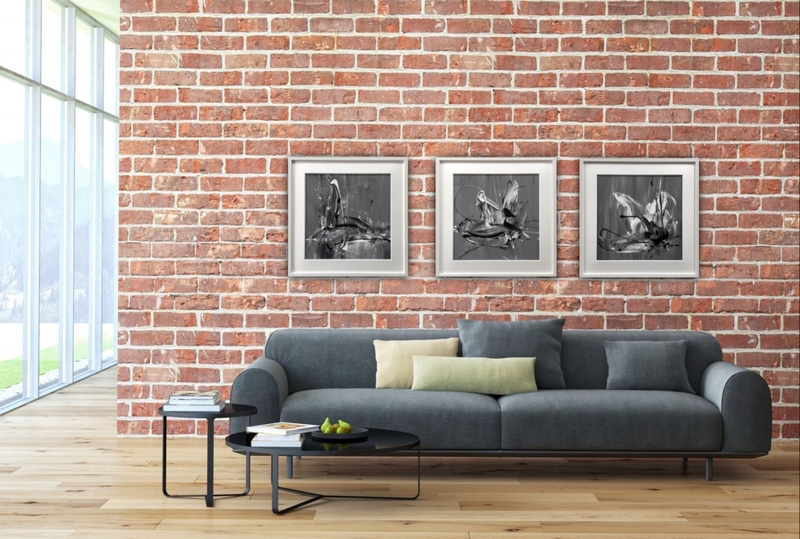 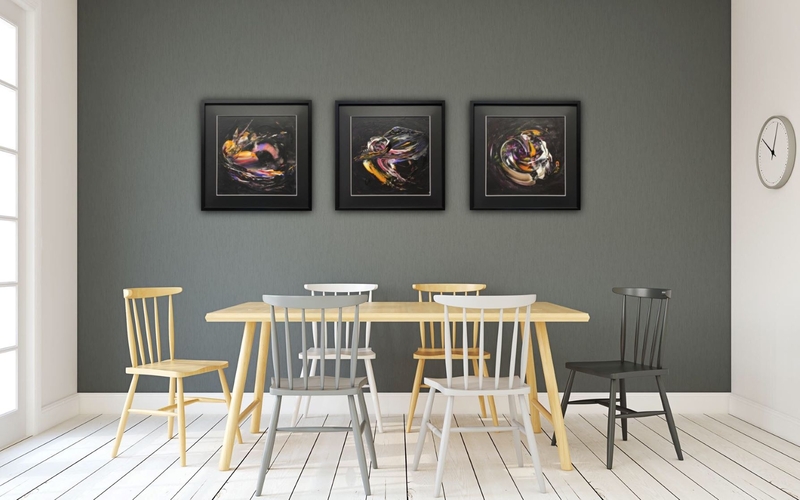 This compelling triptych is full of movement and even so balanced and harmonious. 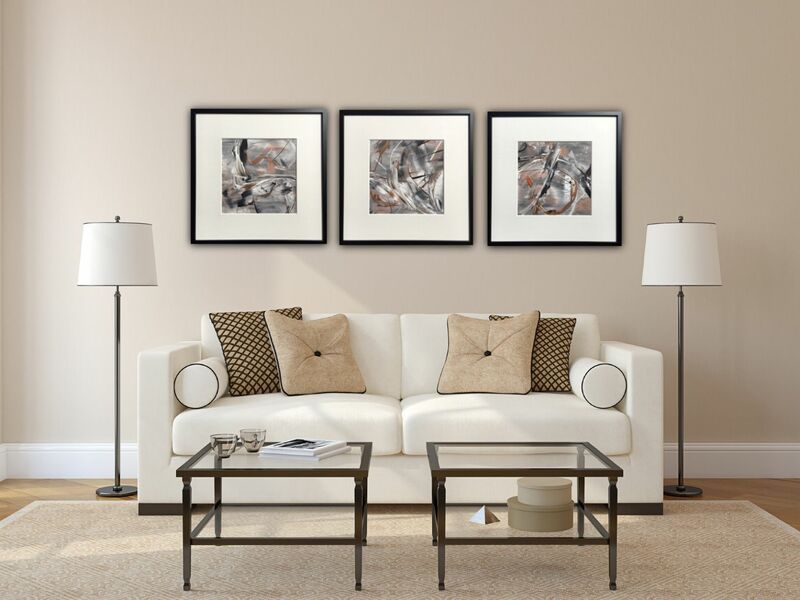 The minimalist colours palette of white, black and copper make these pieces a long lasting pleasure and enrich every contemporary room. These original paintings come framed in black frames (wood) with white quality mat - ready to hang. 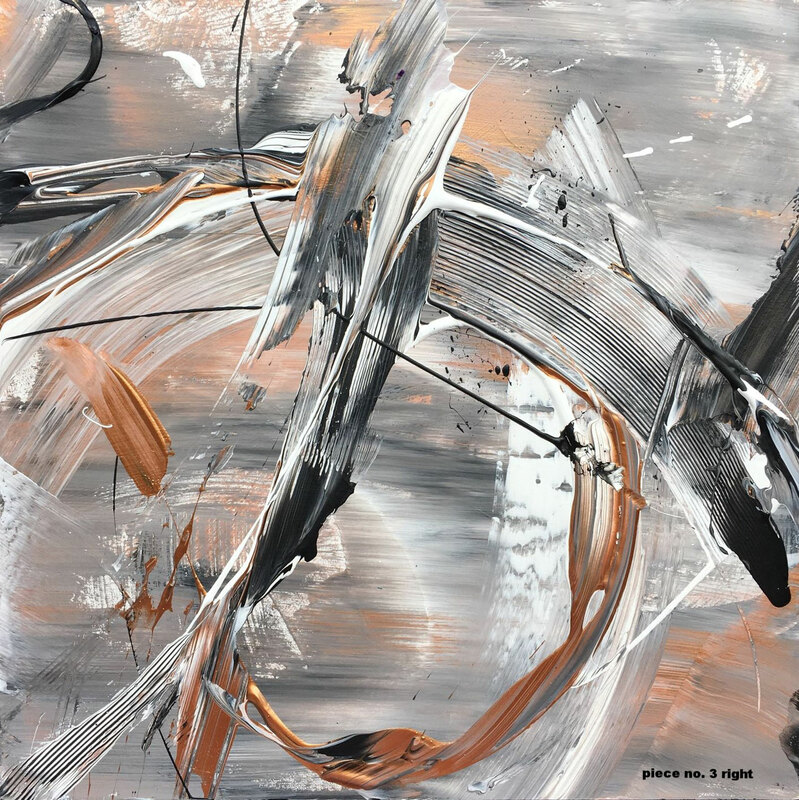 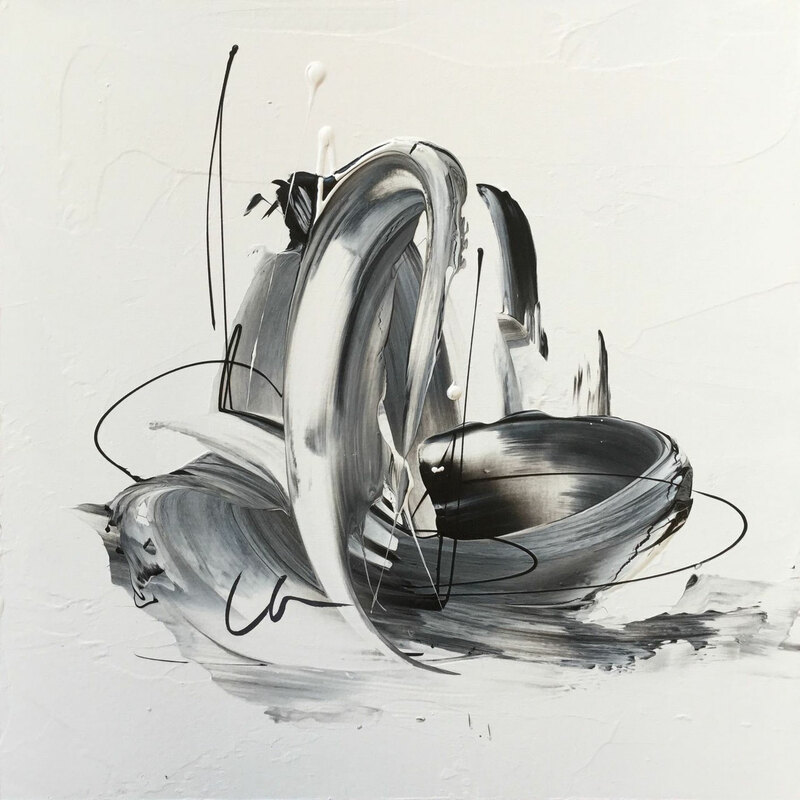 This compelling piece of the series "contradictions 1 - 3" is full of details and movement and even so balanced and harmonious. 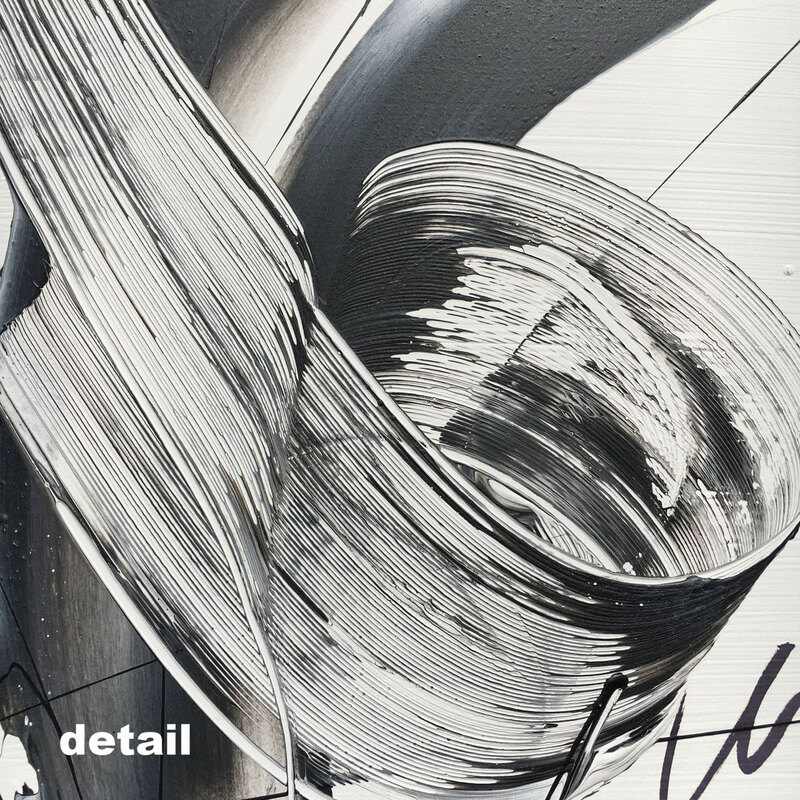 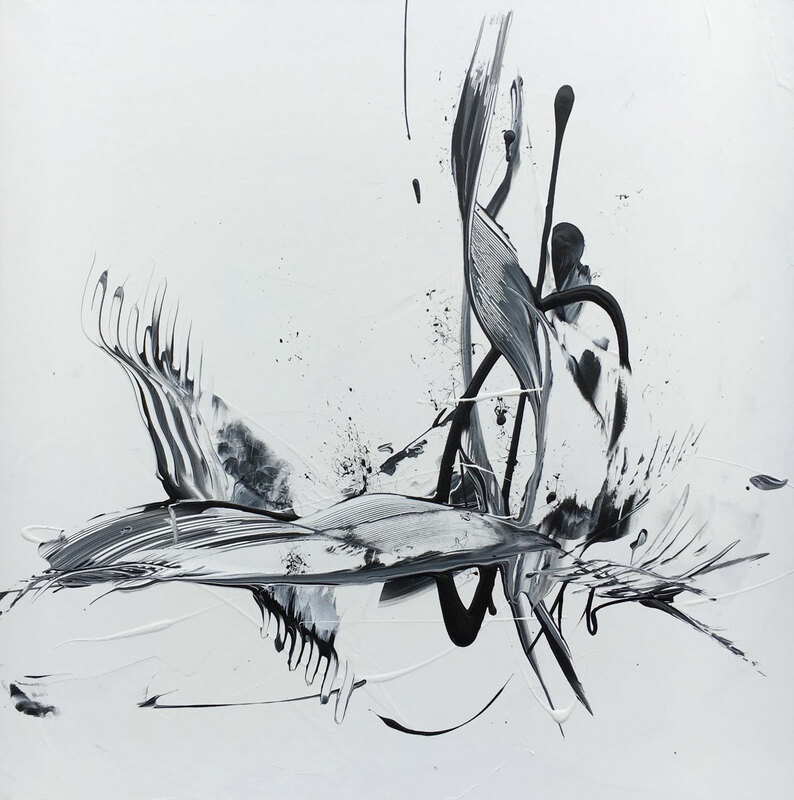 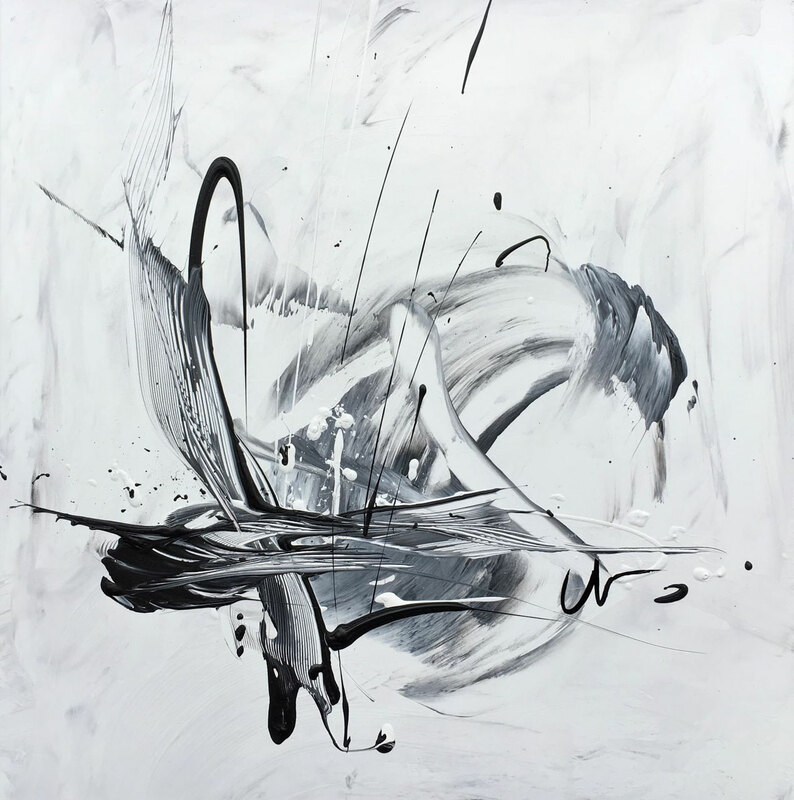 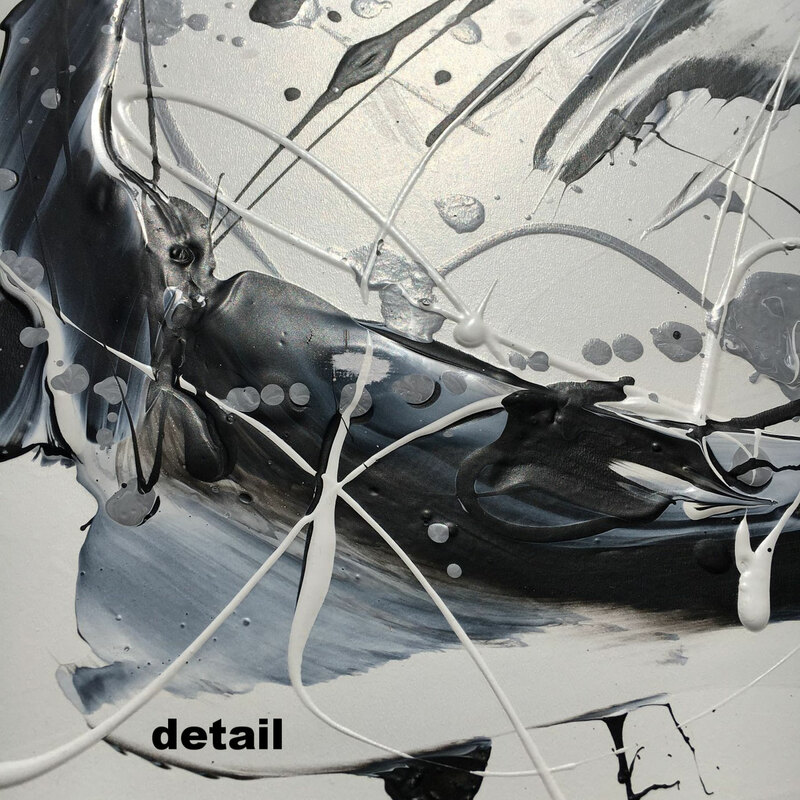 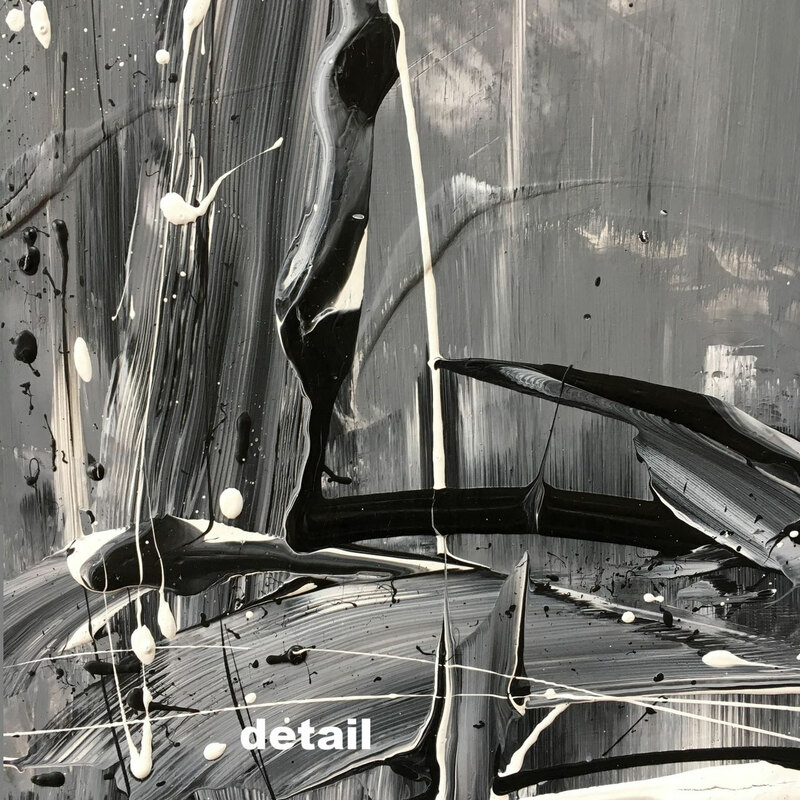 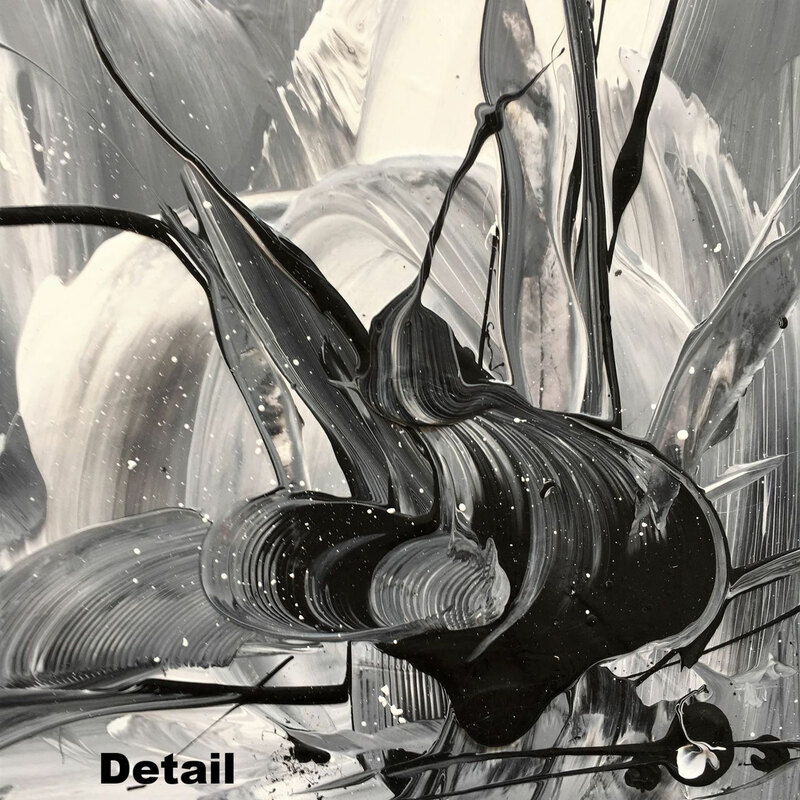 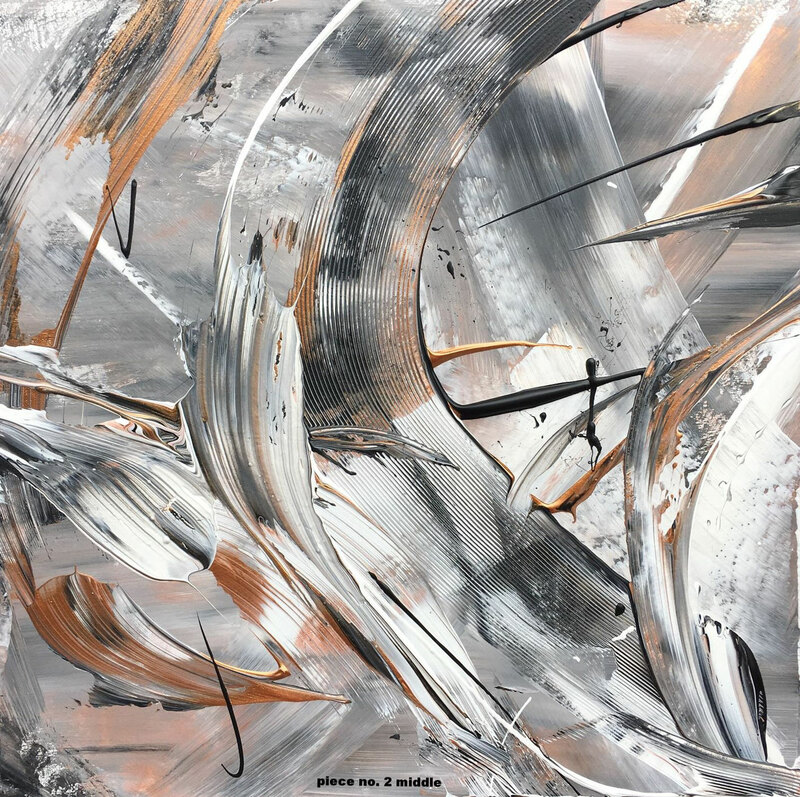 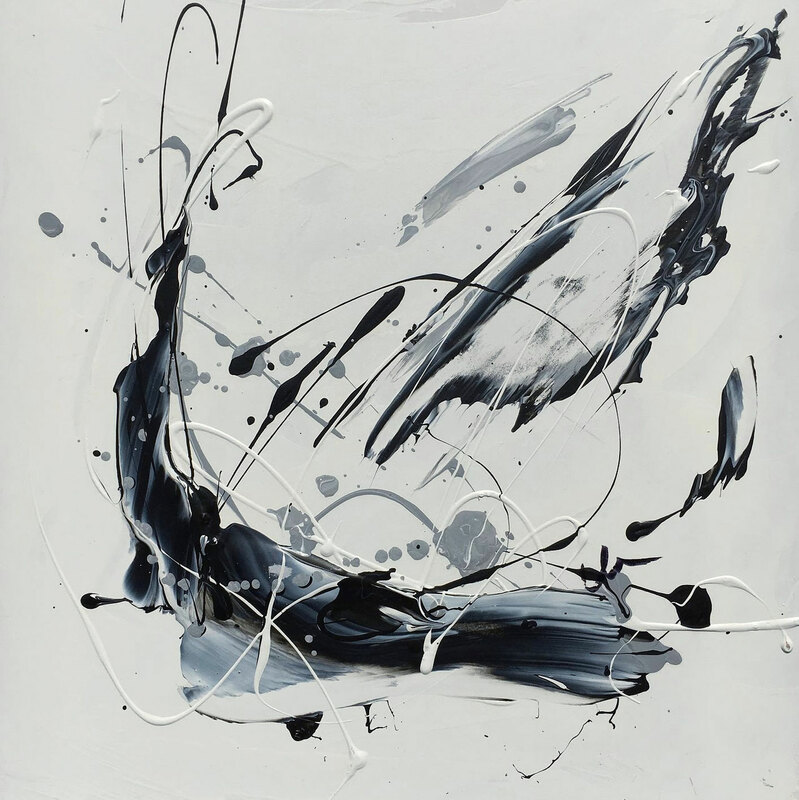 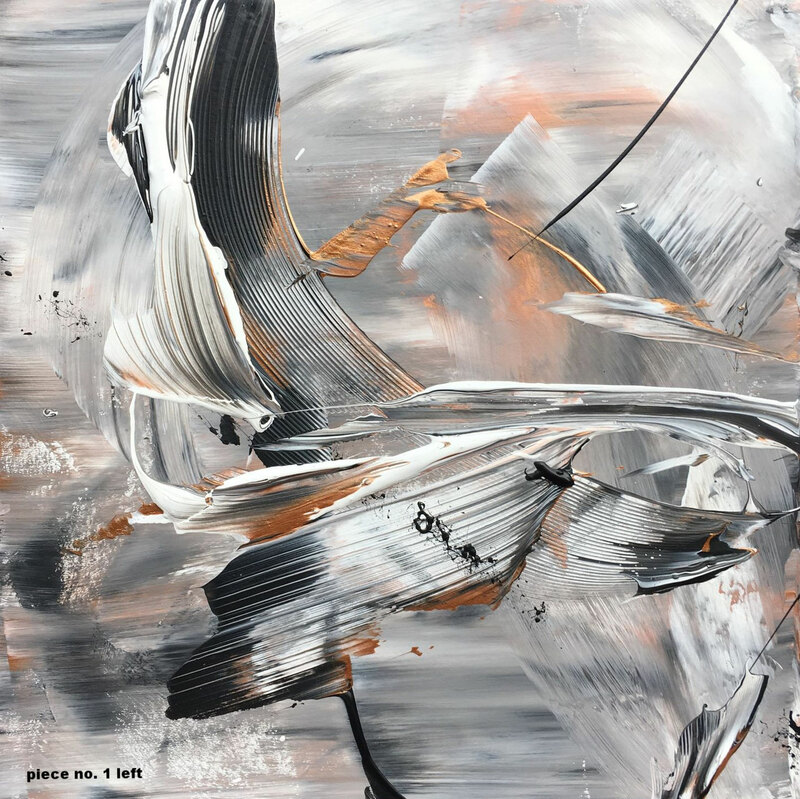 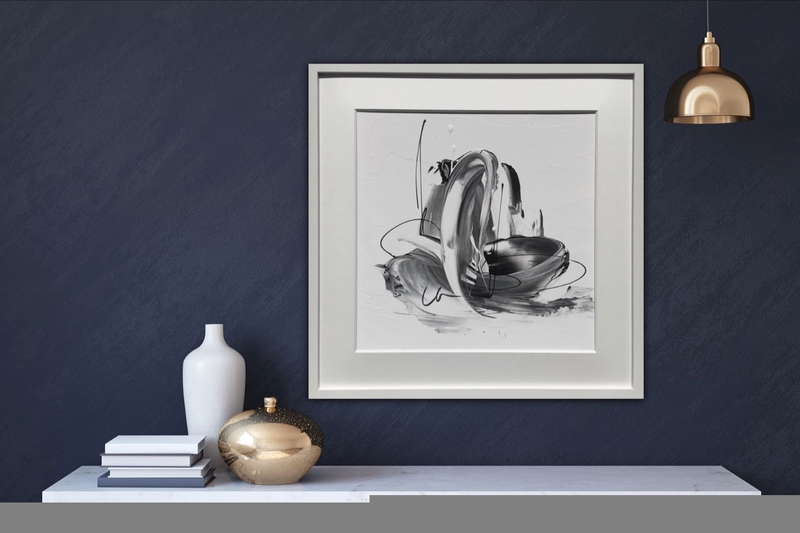 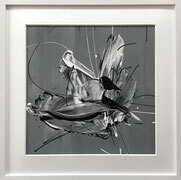 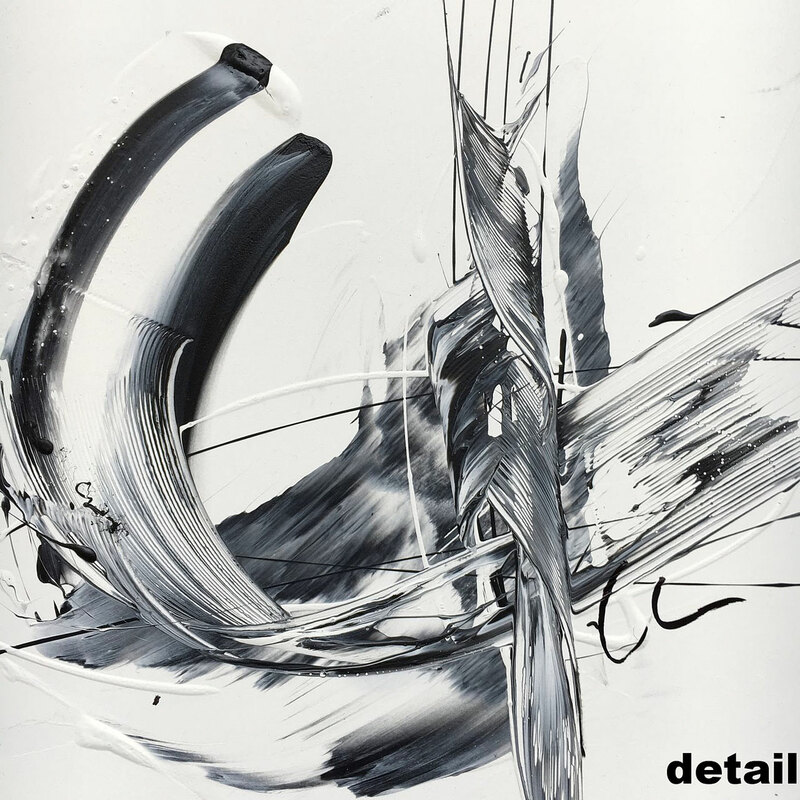 The minimalist colours palette of white, grey and black give this painting a contemporary look and an aura of luxury. 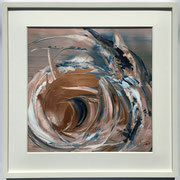 Each painting can stand alone or can be arranged with other pieces of the series. 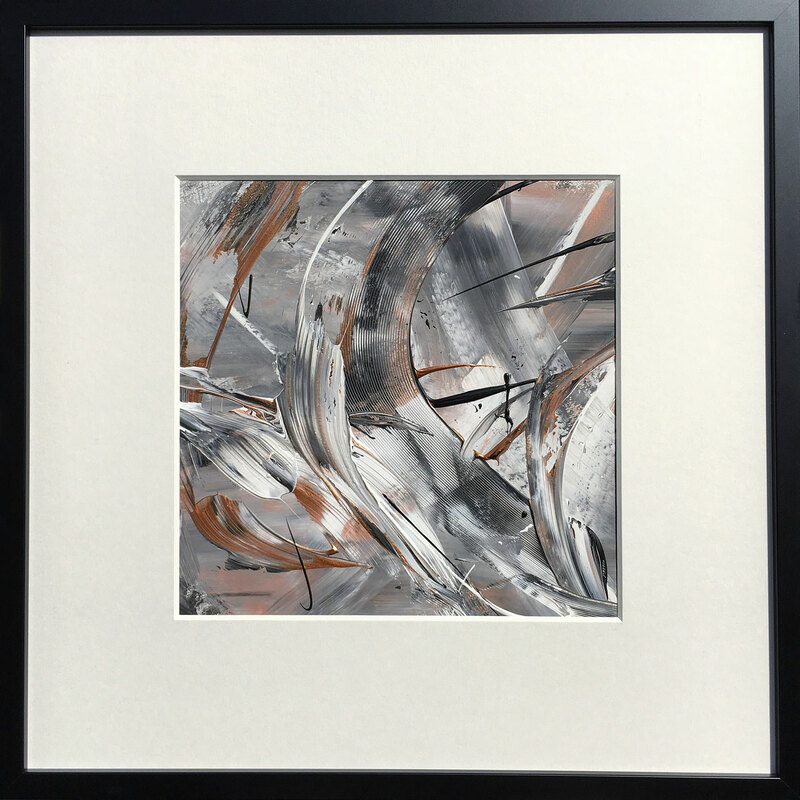 This original painting comes in a white frame (wood) including white mat - ready to hang.